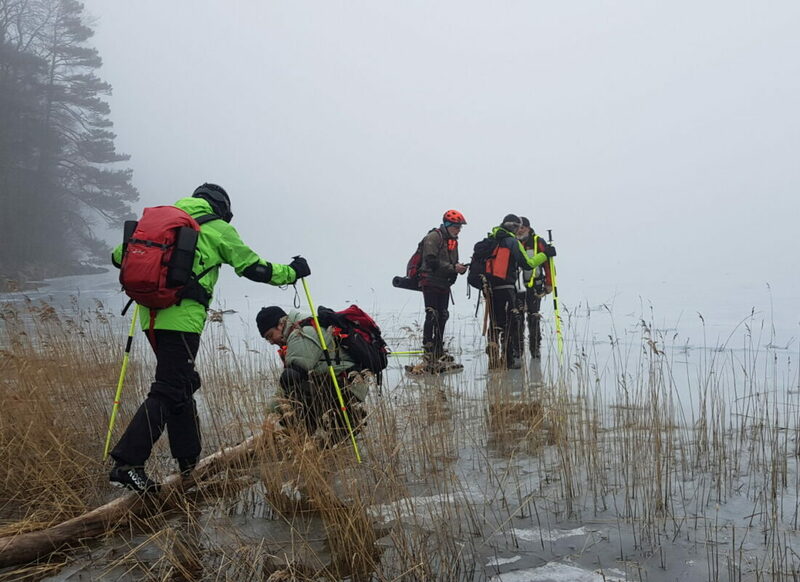 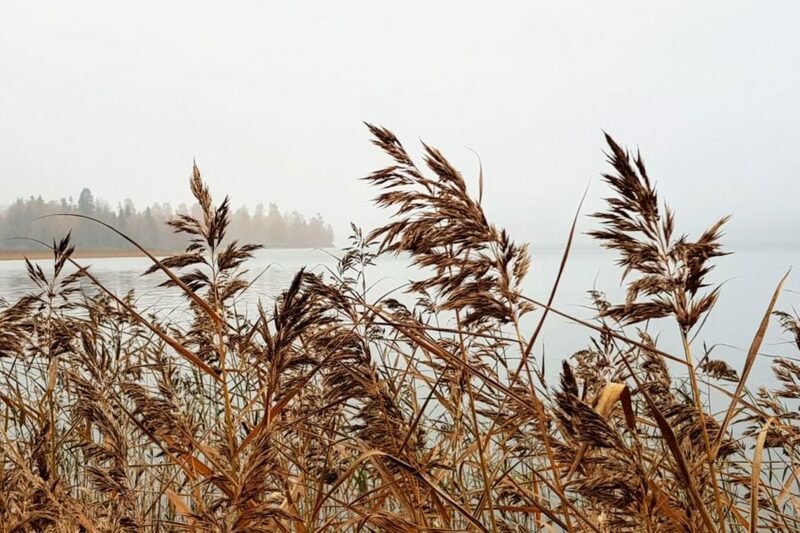 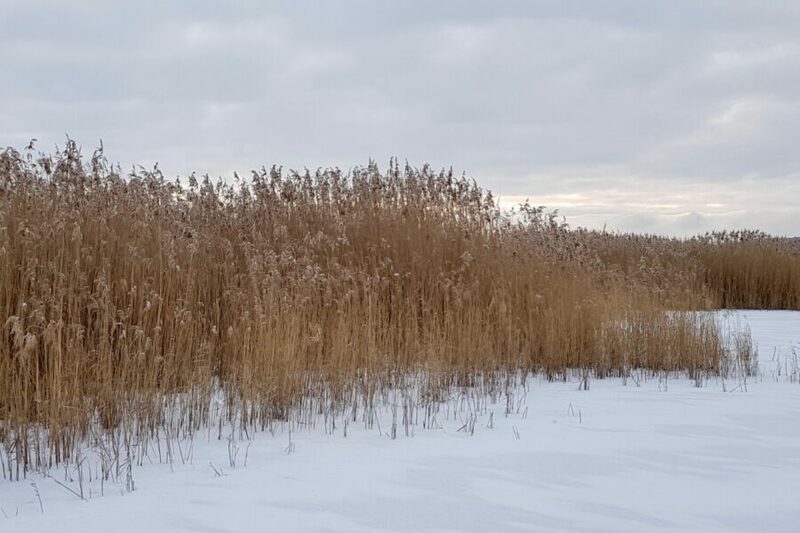 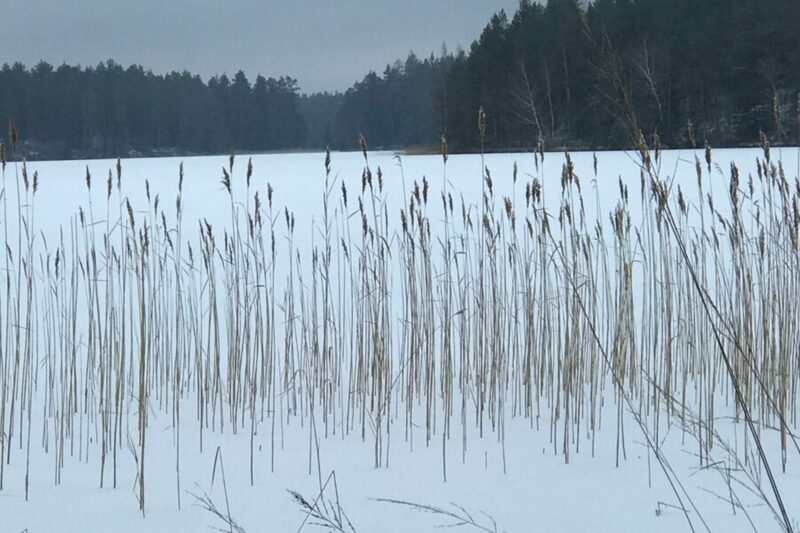 For three days in the beginning of November we were fortunate to visit Lake Rogen Nature Reserve. 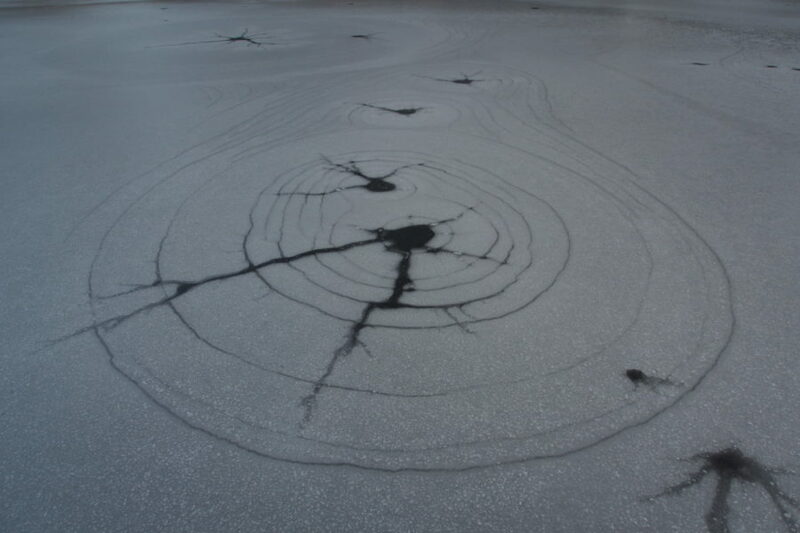 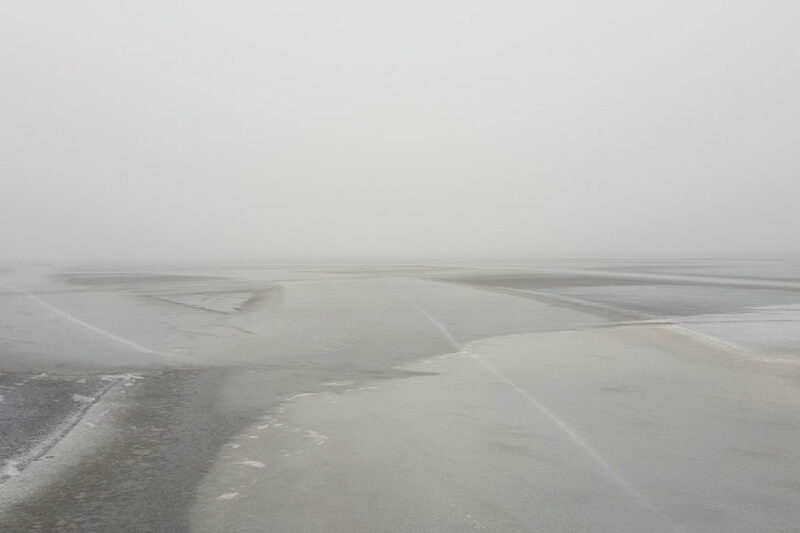 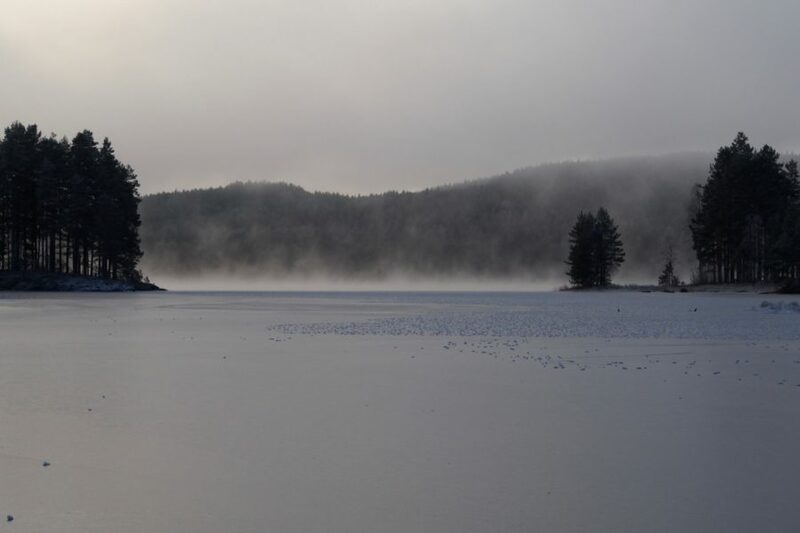 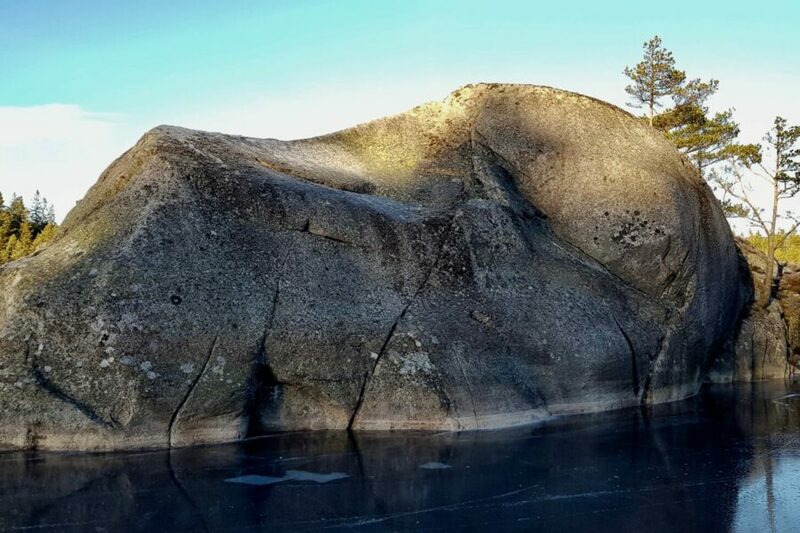 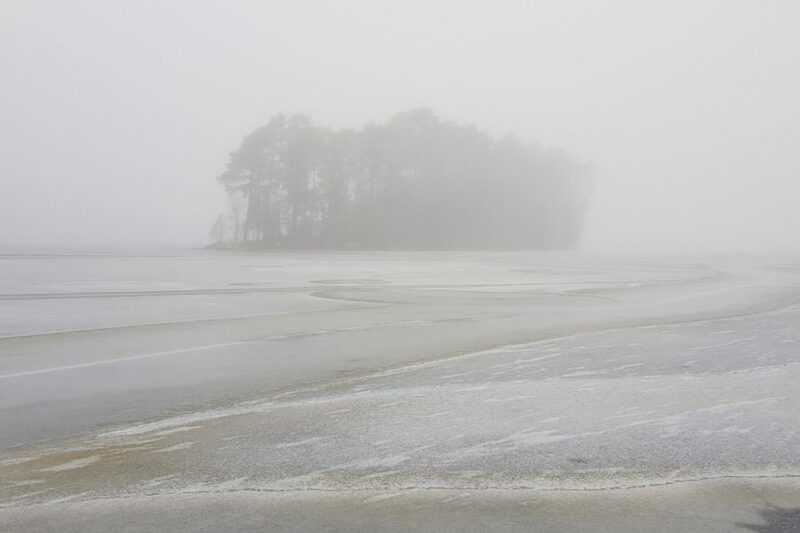 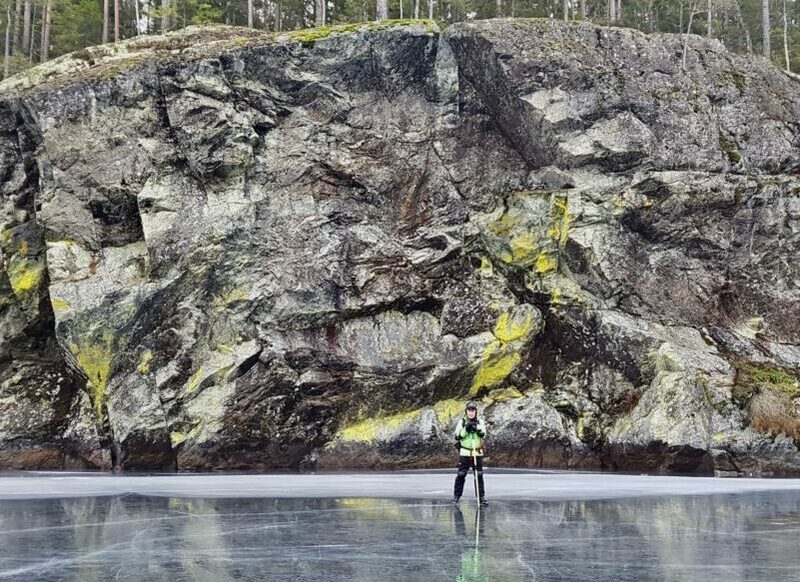 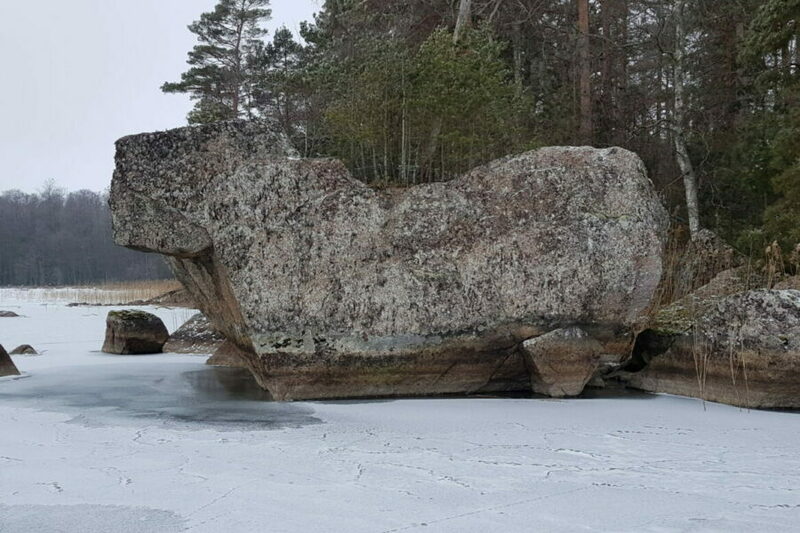 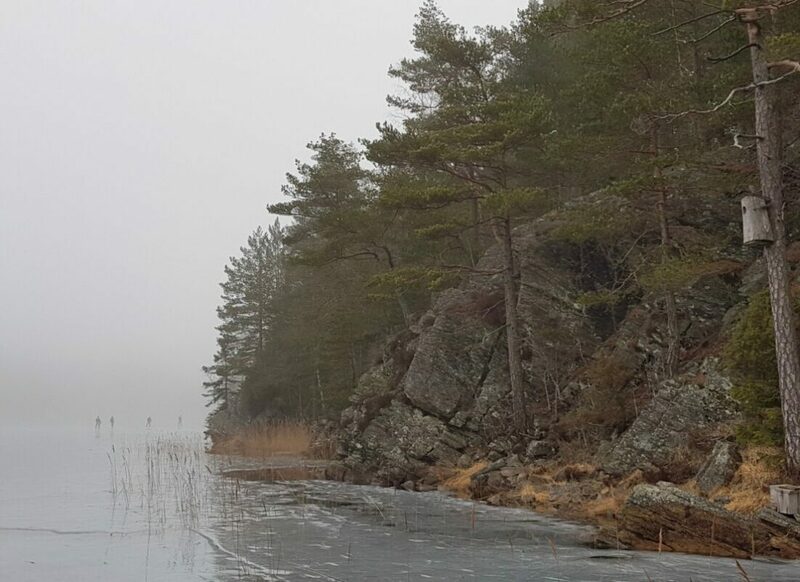 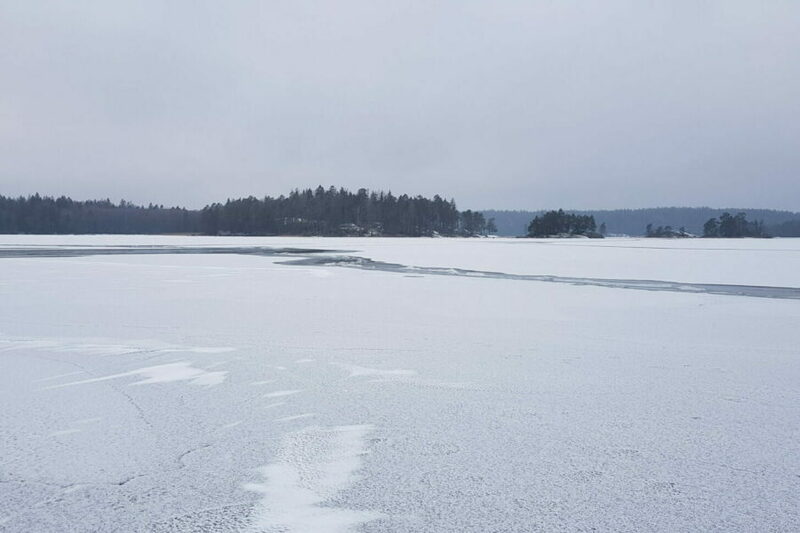 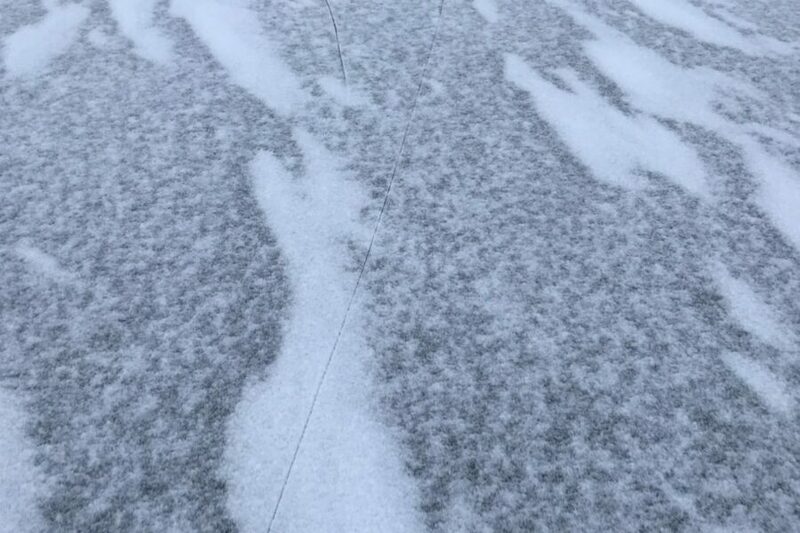 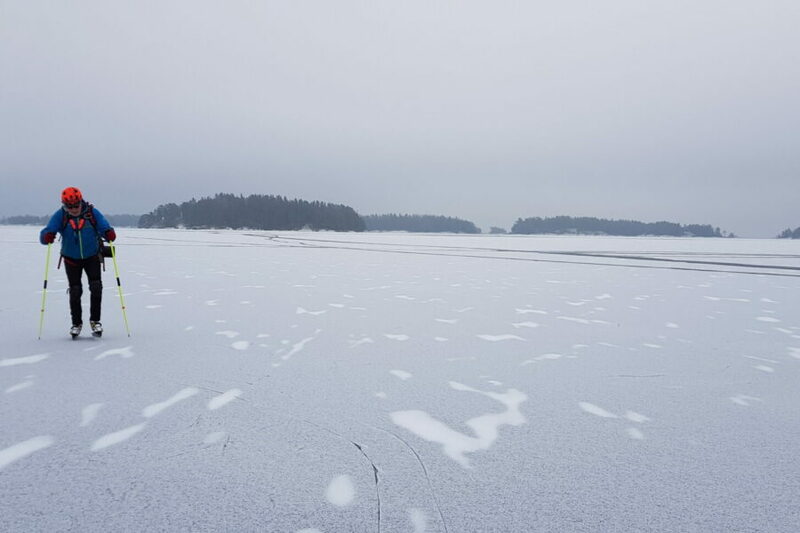 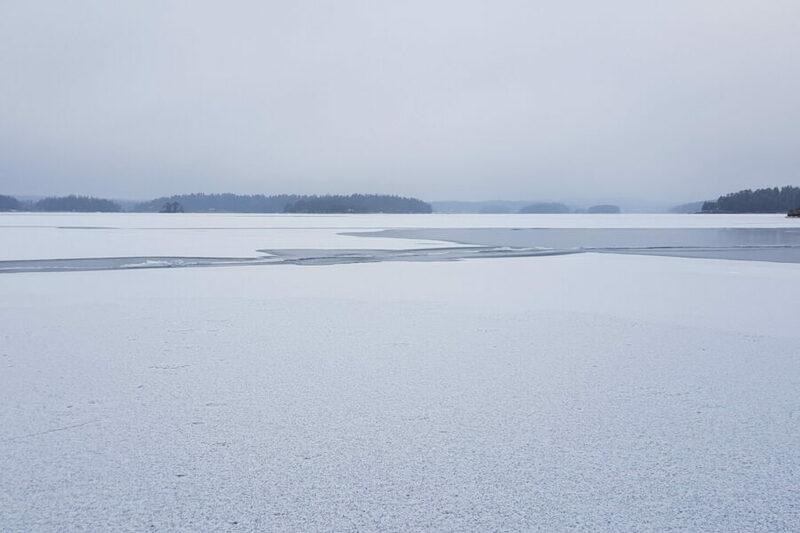 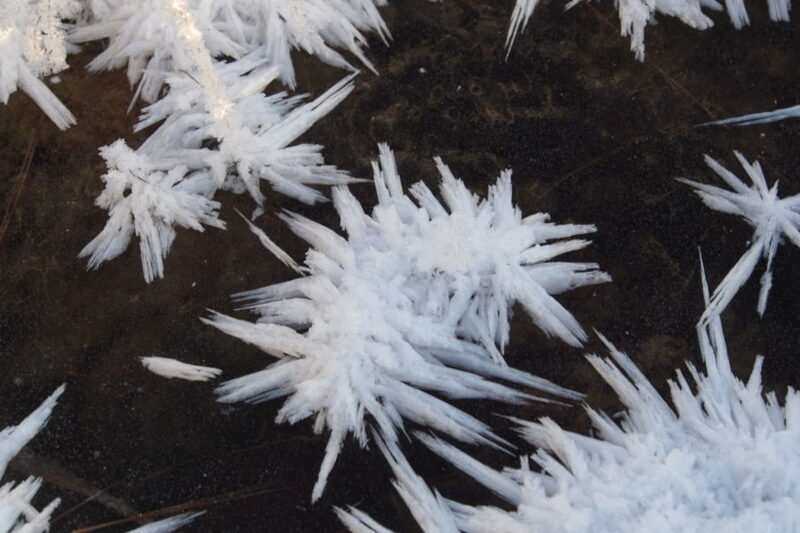 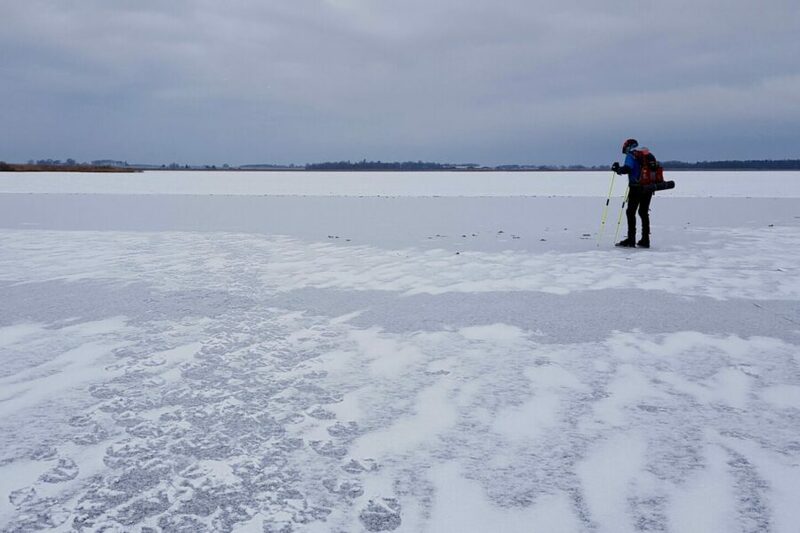 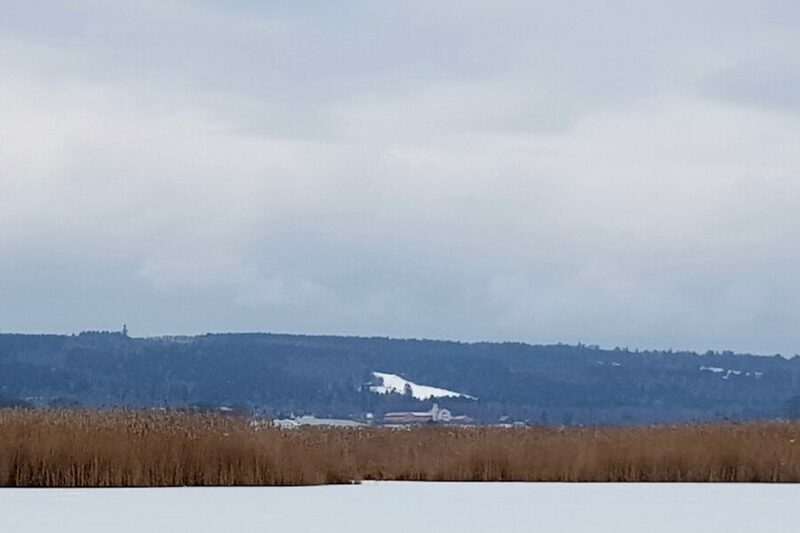 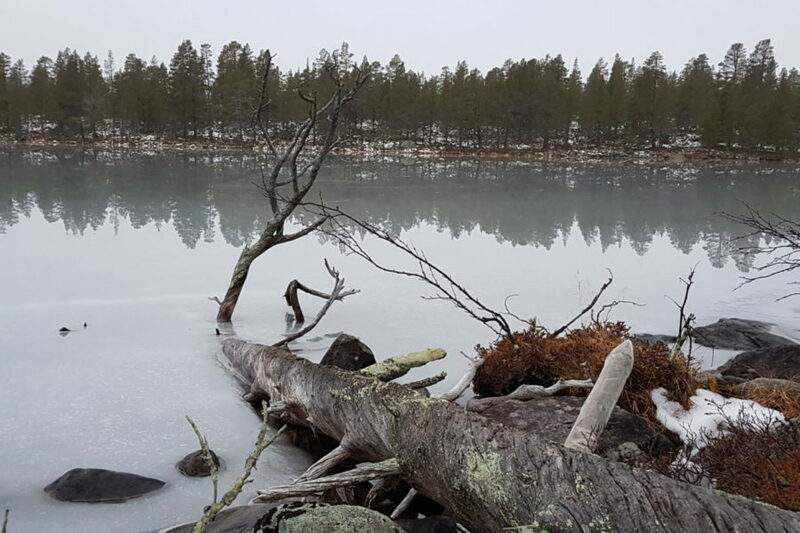 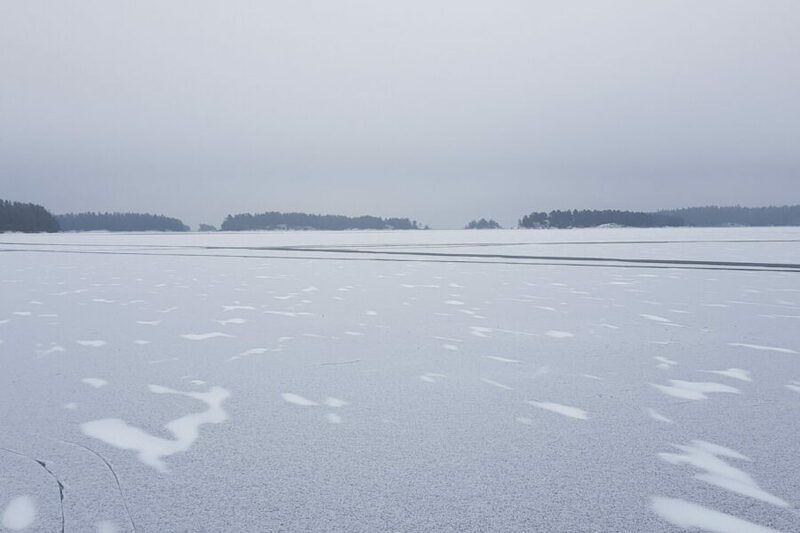 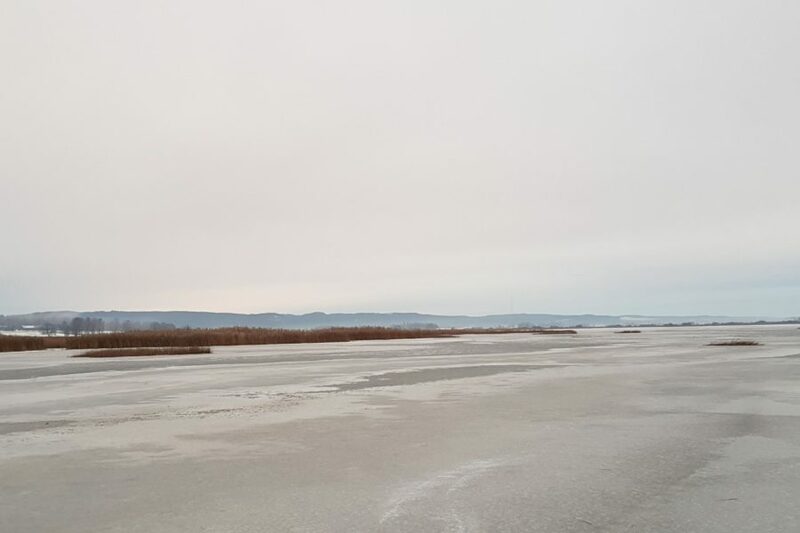 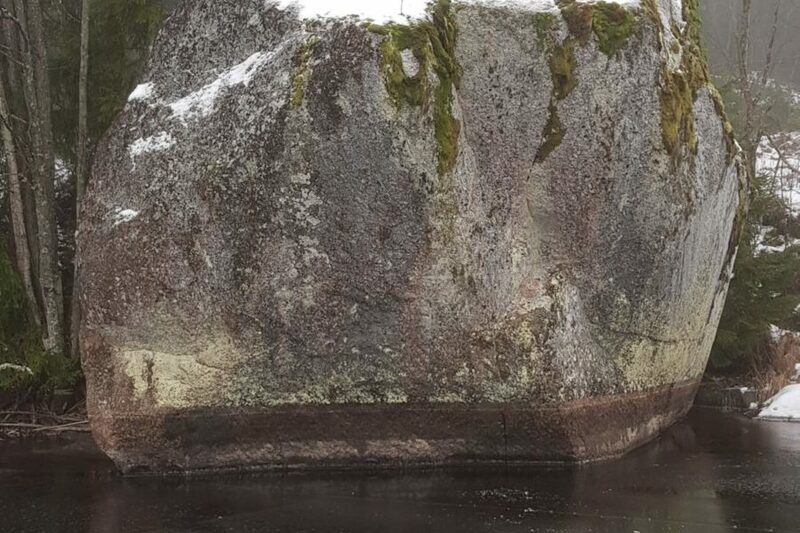 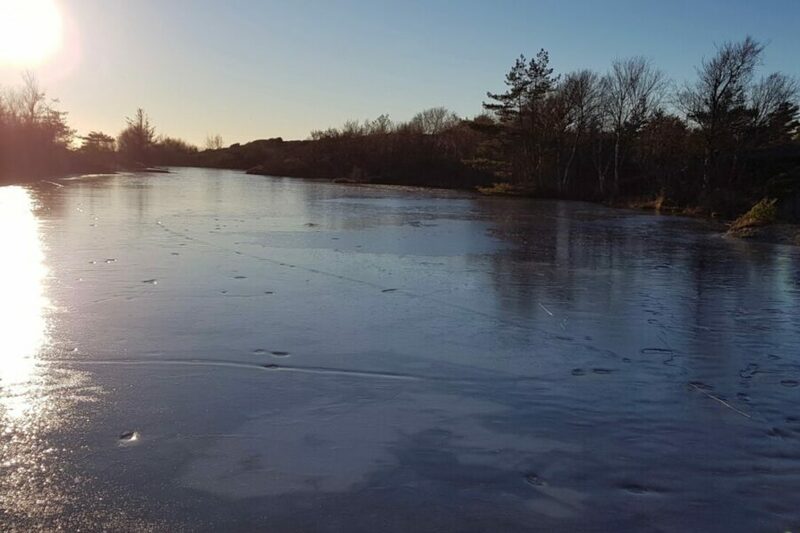 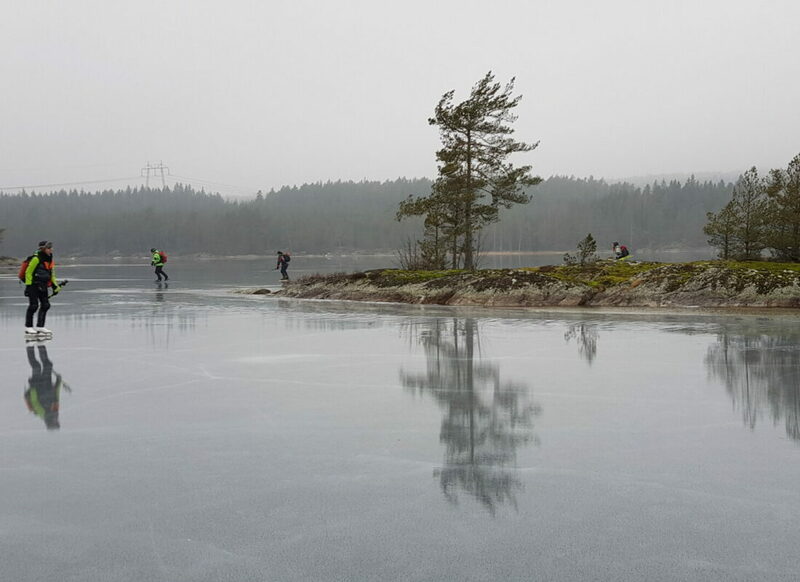 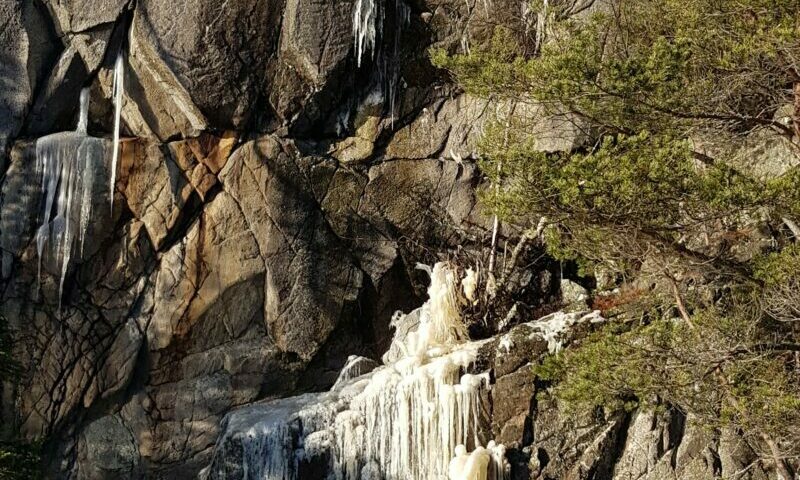 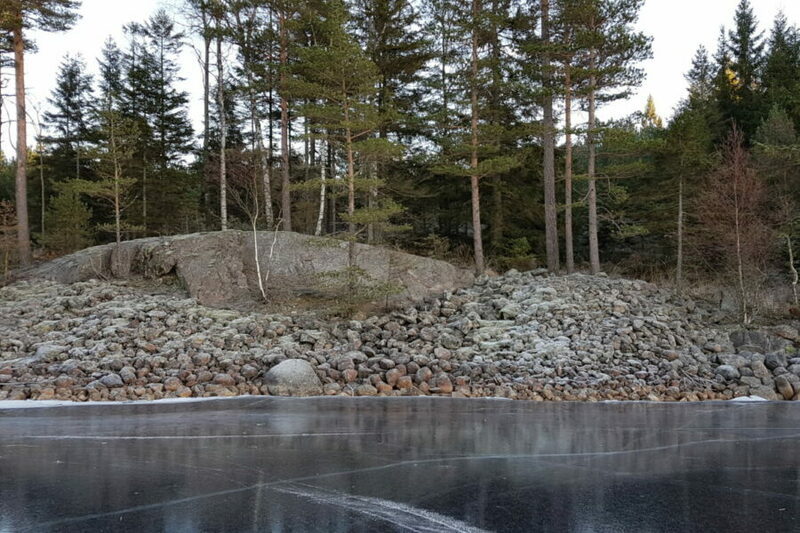 We skated in a landscape formed by the inland ice – a geologist’s dream. 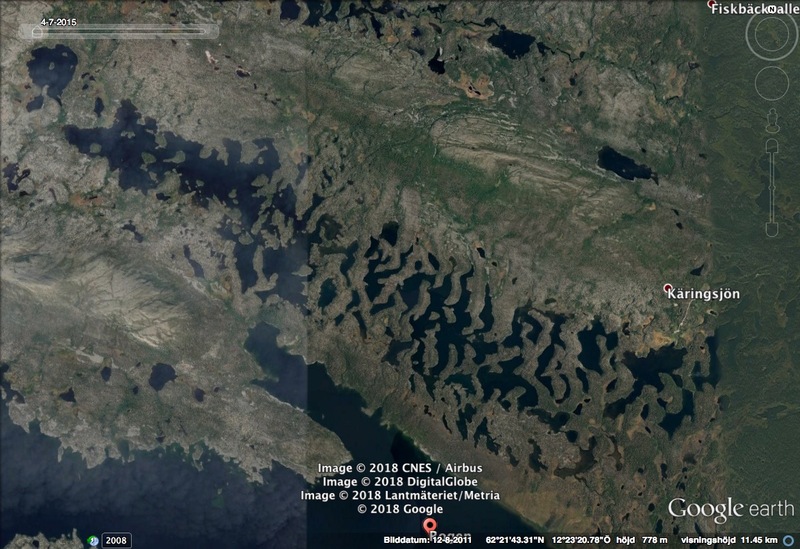 The Rogen moraine consists of stones and gravel in a network of ridges with lakes in between. 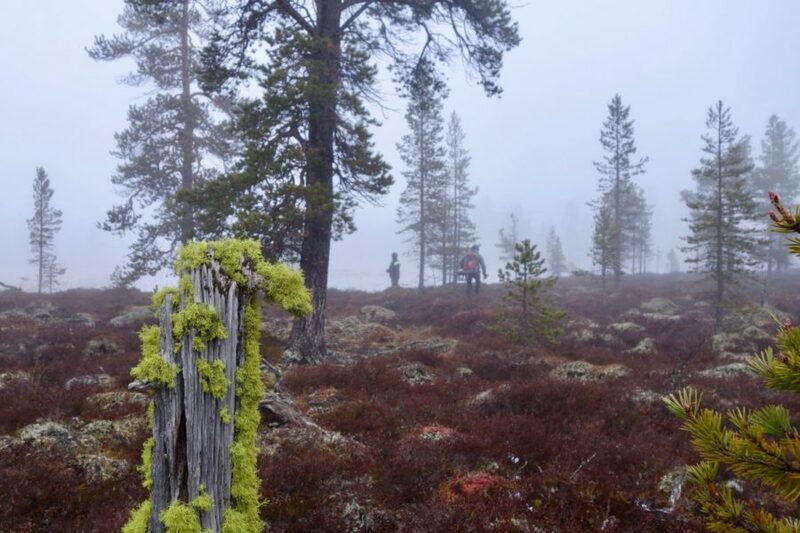 The park ranger Per Roger Wiberg guided us through the magic landscape. 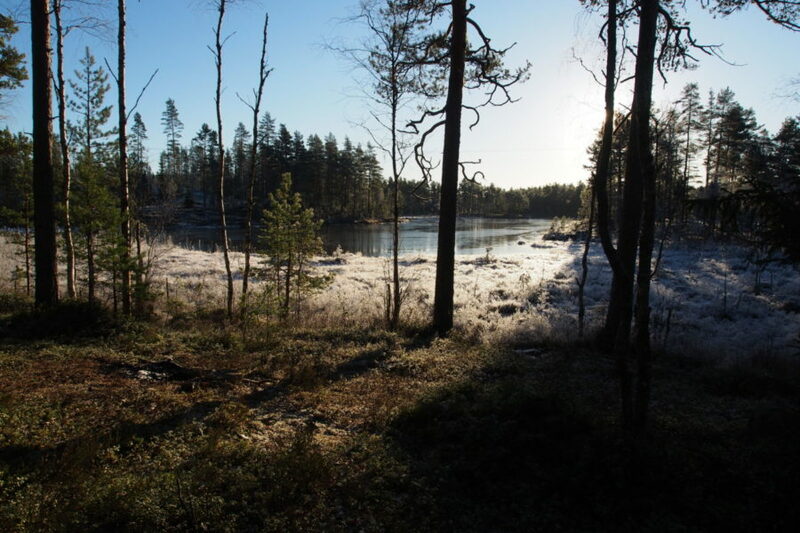 He knows his landscape well and has a lot to tell about wild life, human life and nature in this region. 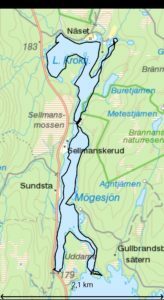 Our starting point was by lake Käringsjön, the childhood home of Per Roger, at the end of the road. 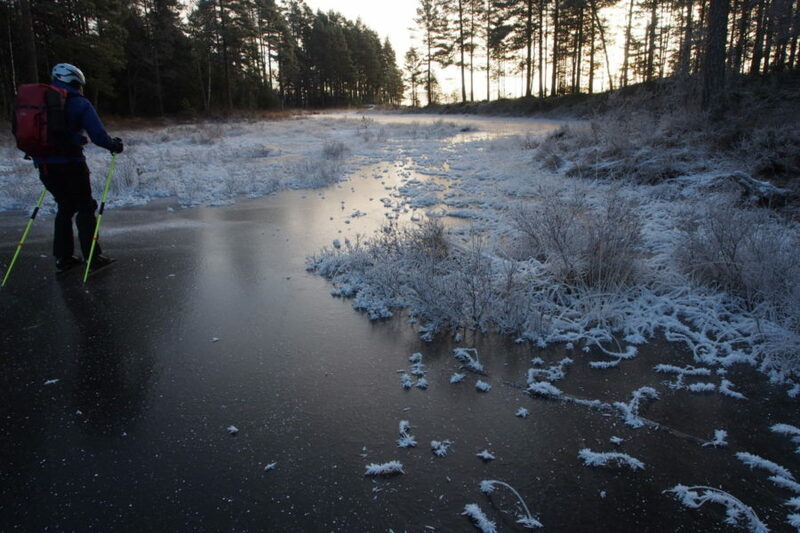 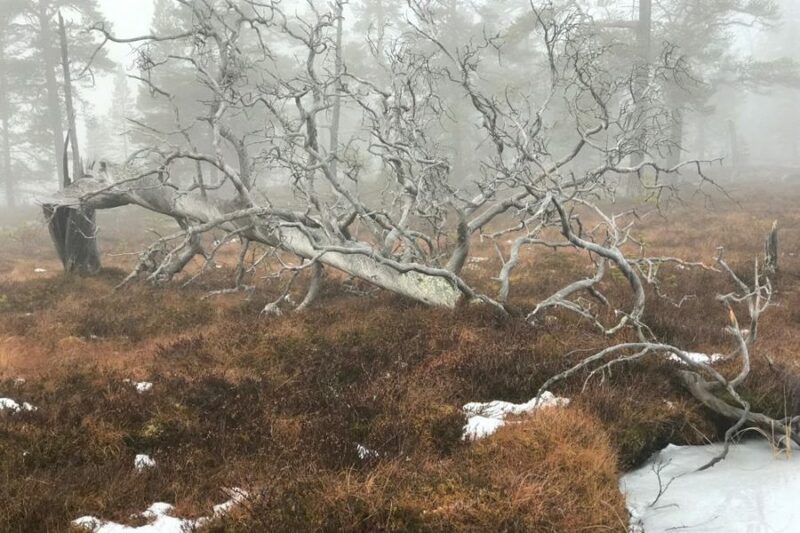 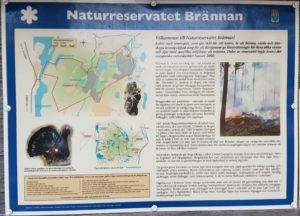 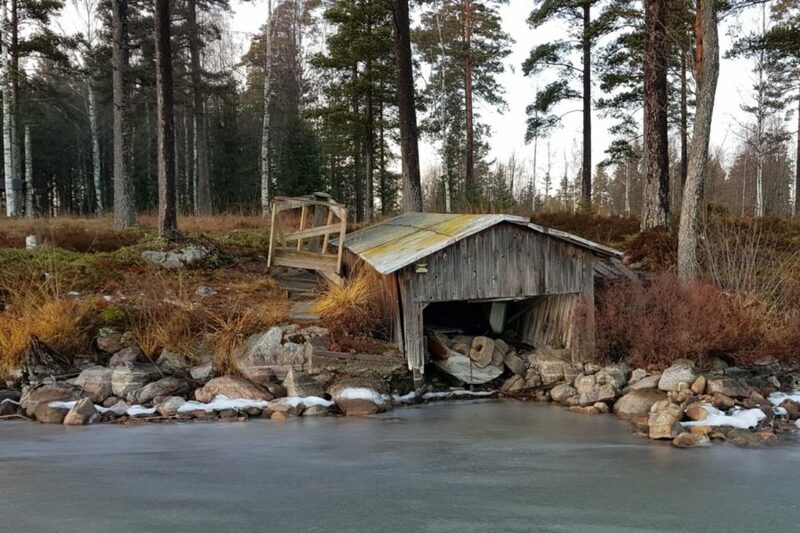 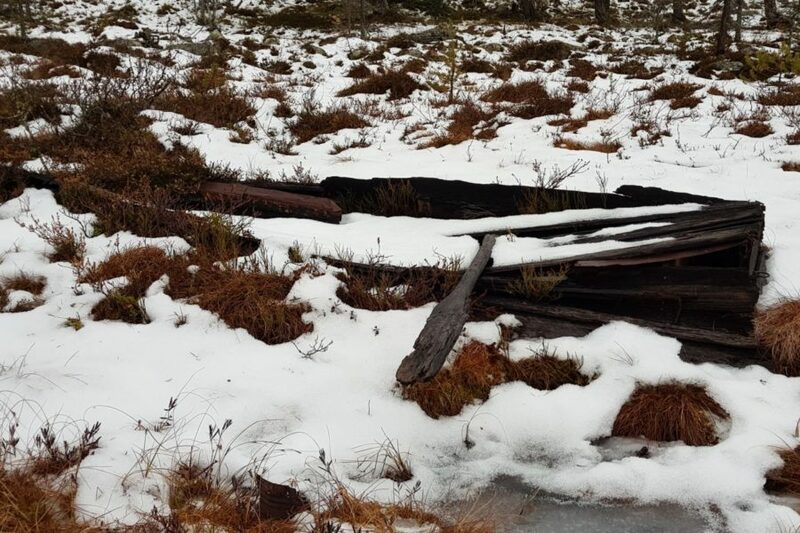 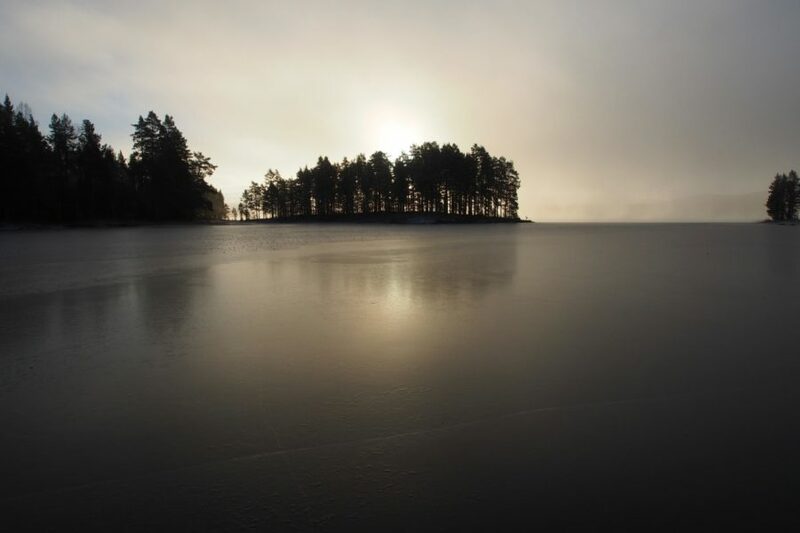 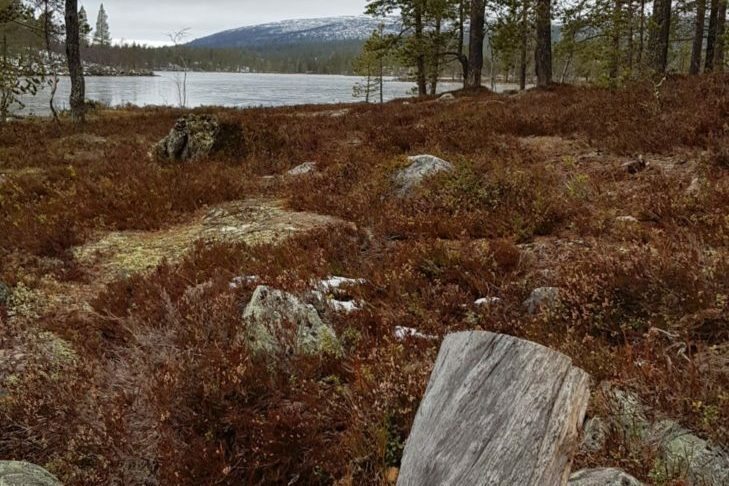 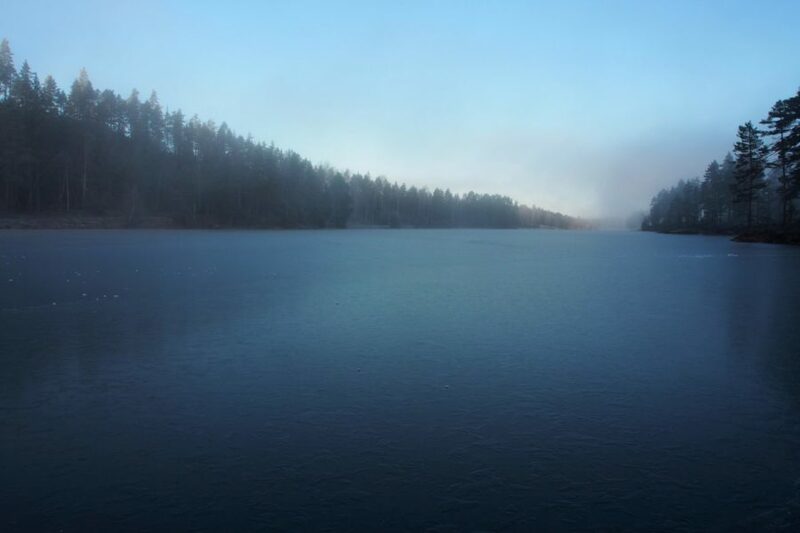 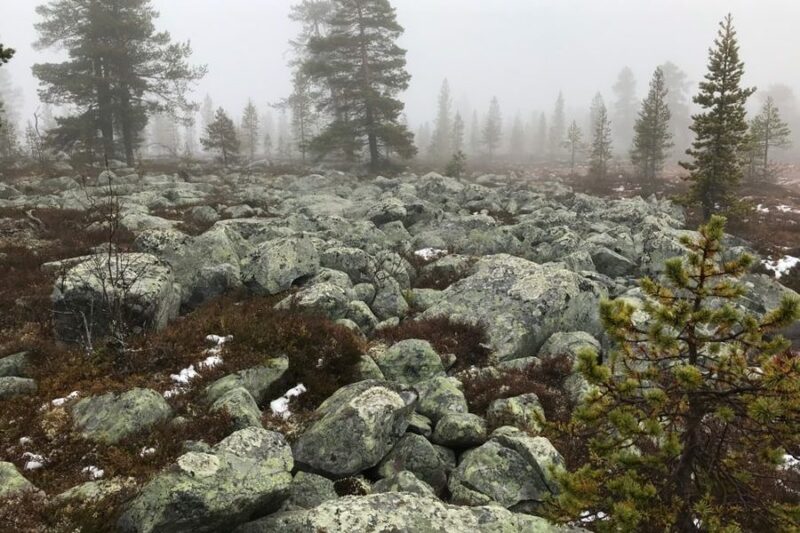 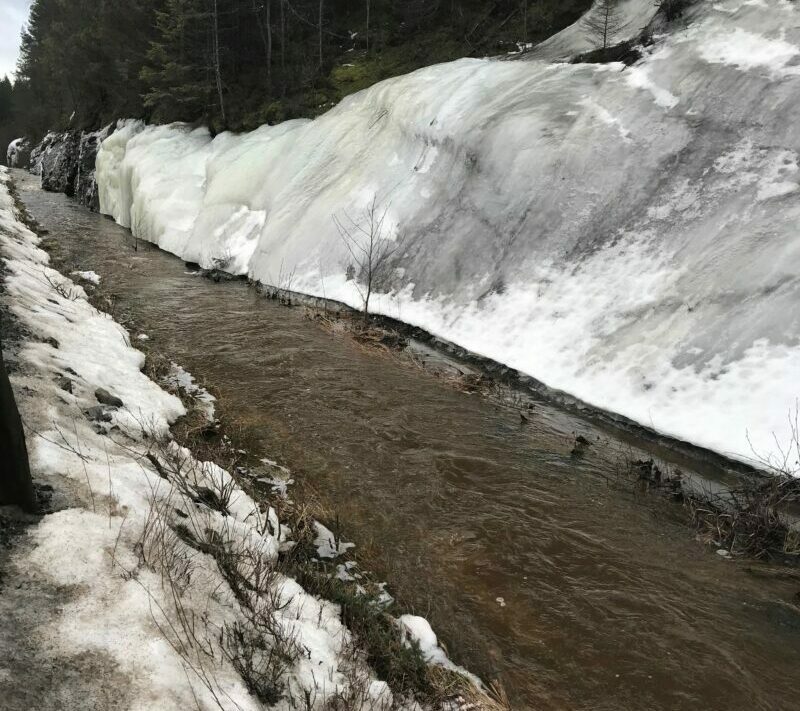 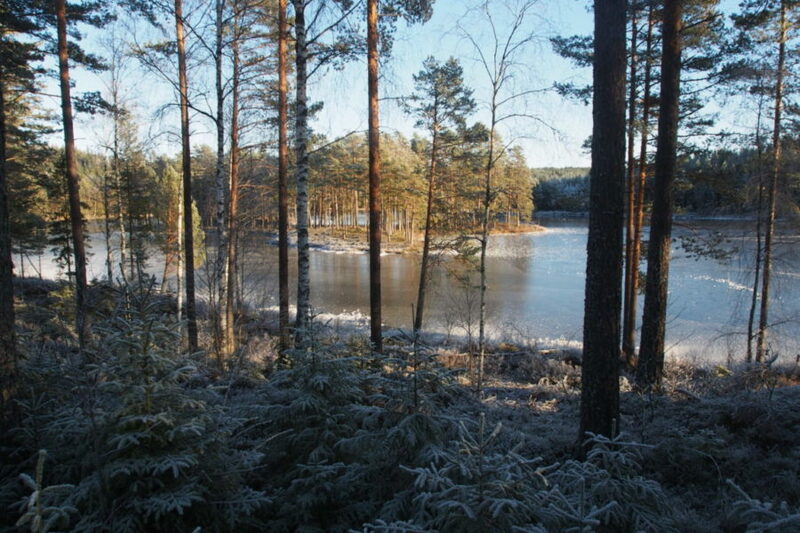 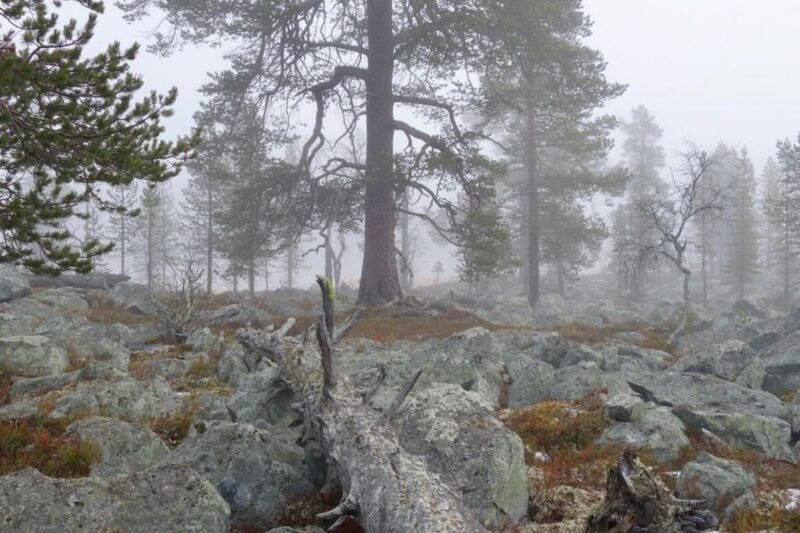 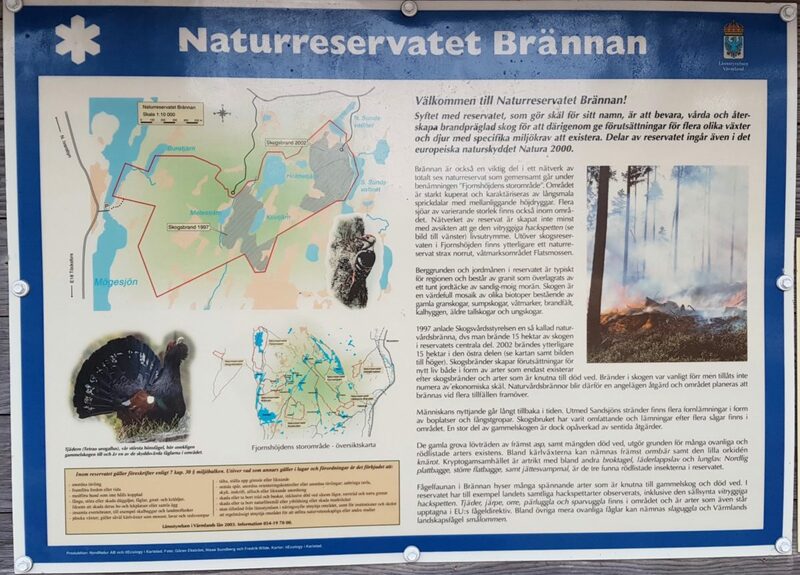 The source of the longest river in Sweden is situated here. 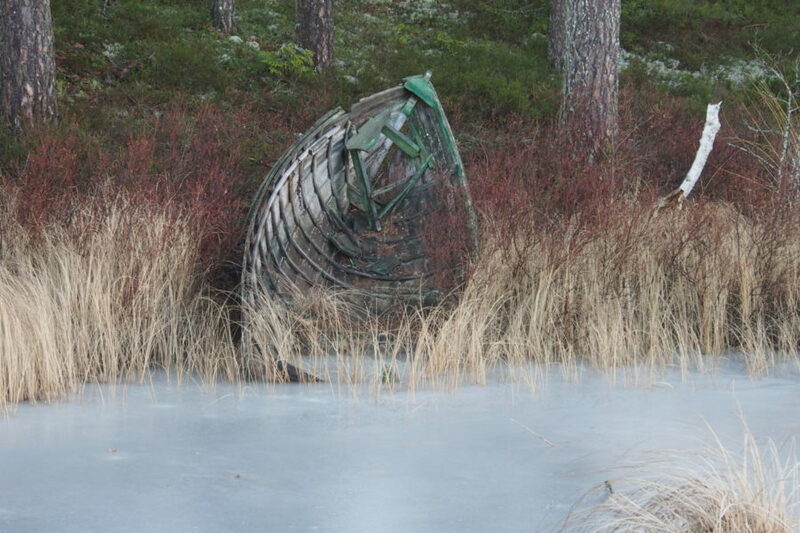 Old twisted pine trees and abandoned rowing boats remind us of times gone by. 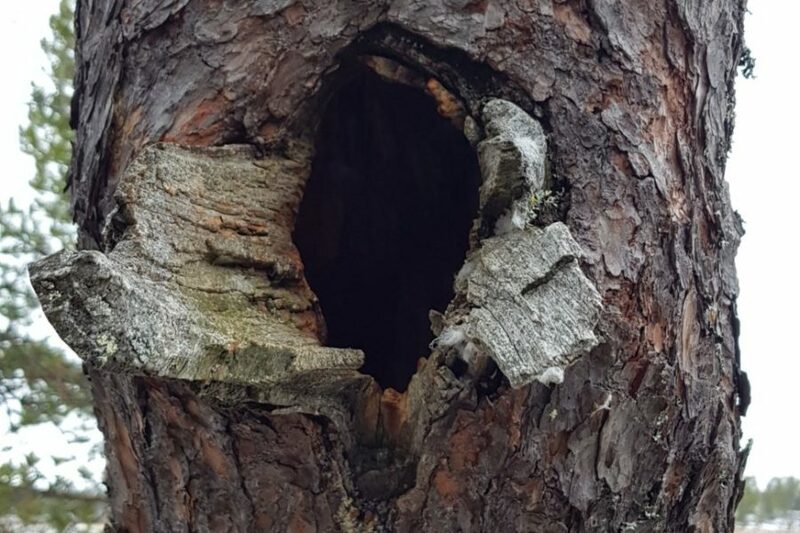 Common Goldeneyes find their nests in holes of pine trees. 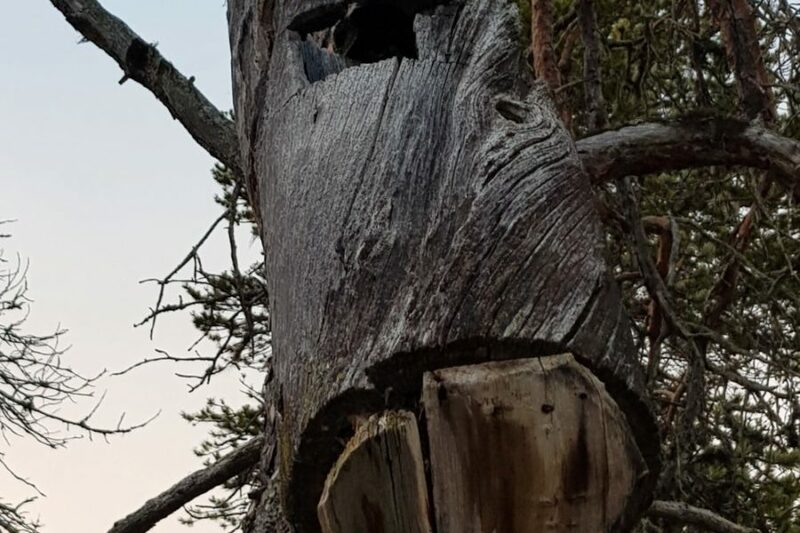 Nest boxes made of old hollow pine trunks are still there showing us how the grandfather of Per Roger got eggs from birds arriving in spring. 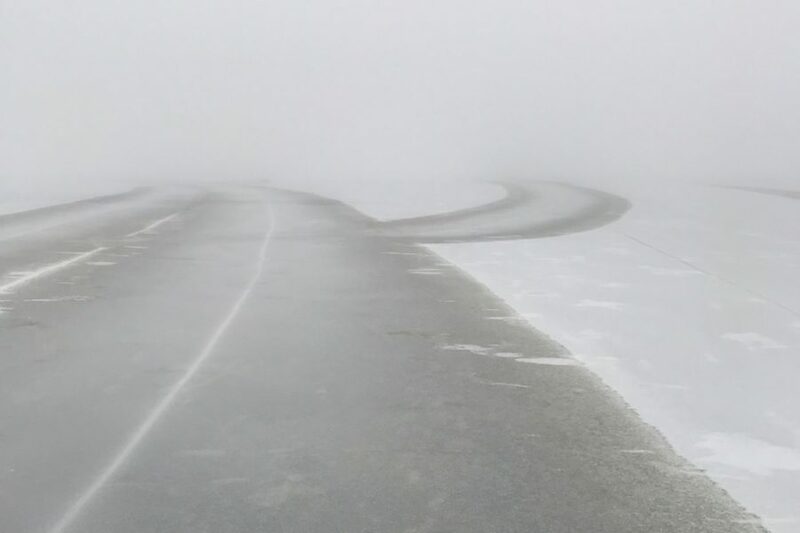 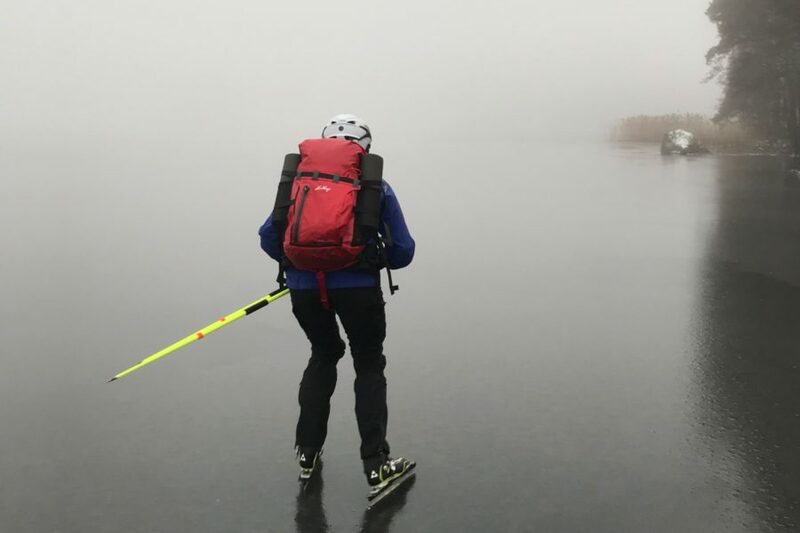 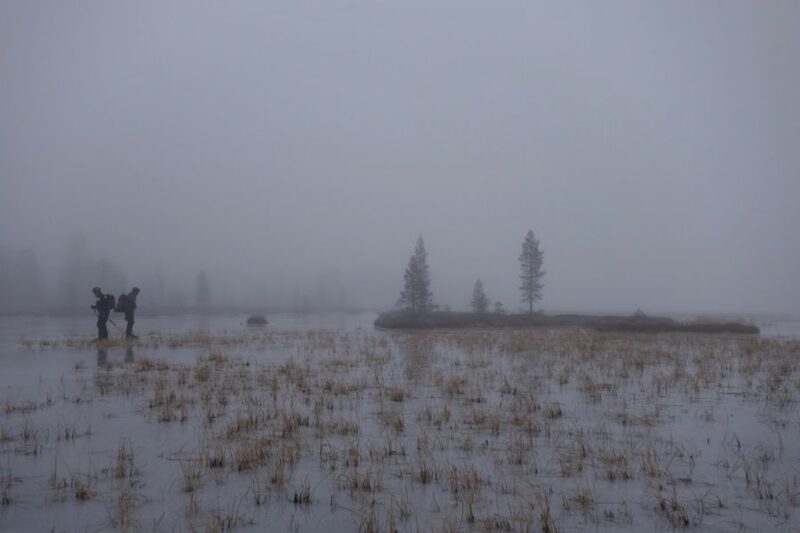 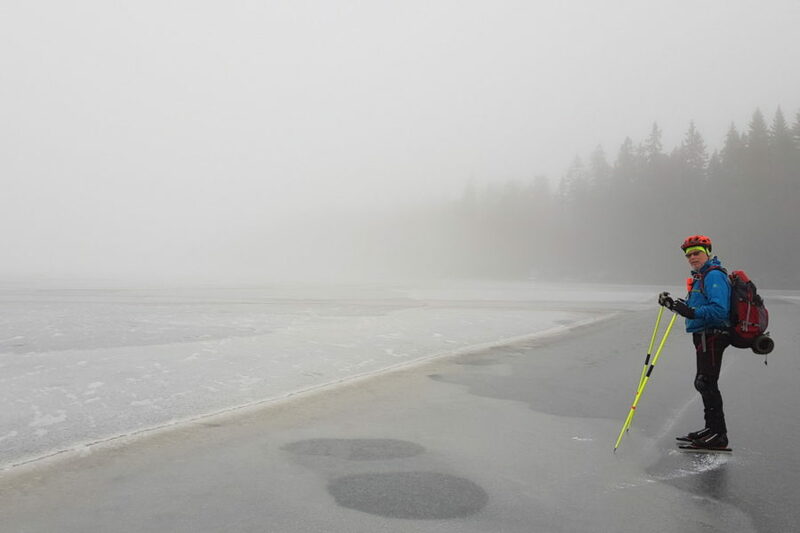 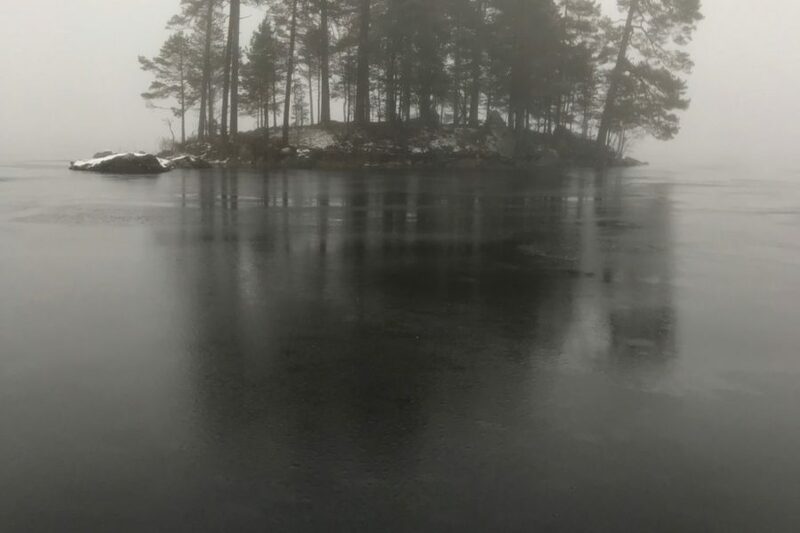 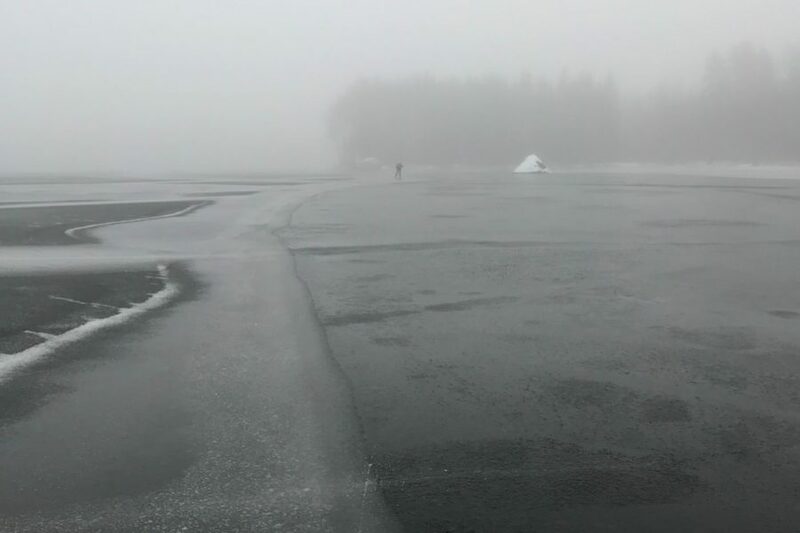 Smooth skating in a foggy environment and walks over low ridges to find new exciting lakes. 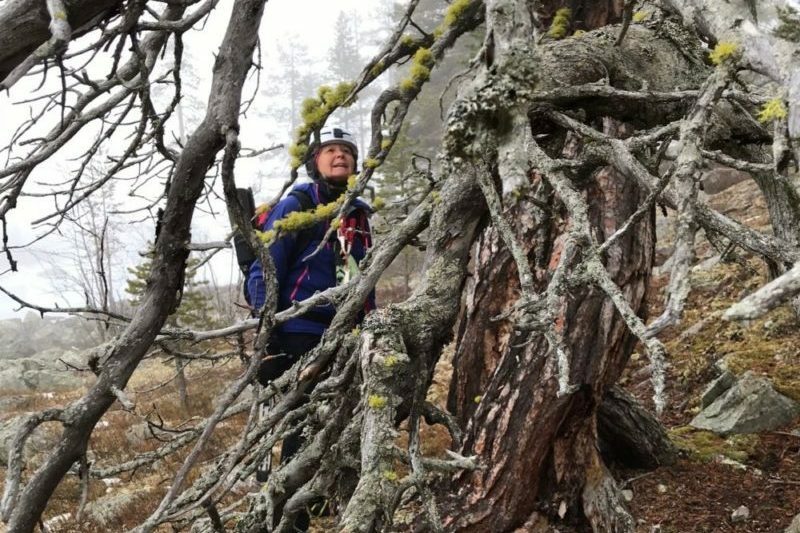 The primeval forest, with pine trees that can be many hundred years old, is impressive and and the lichens light up the landscape. 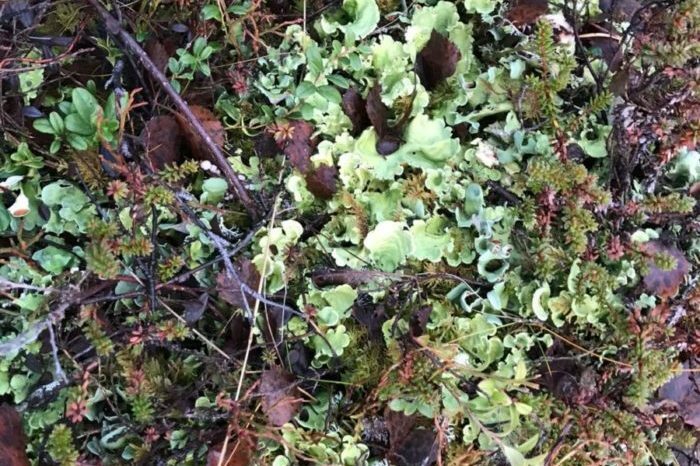 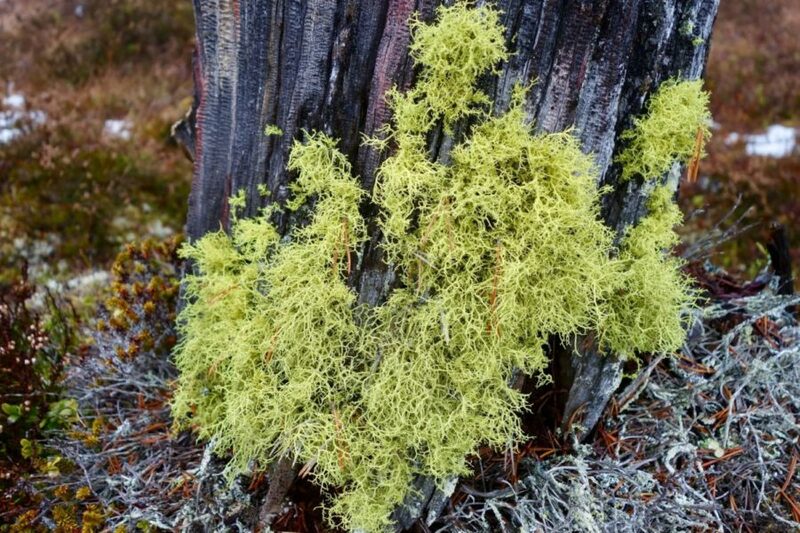 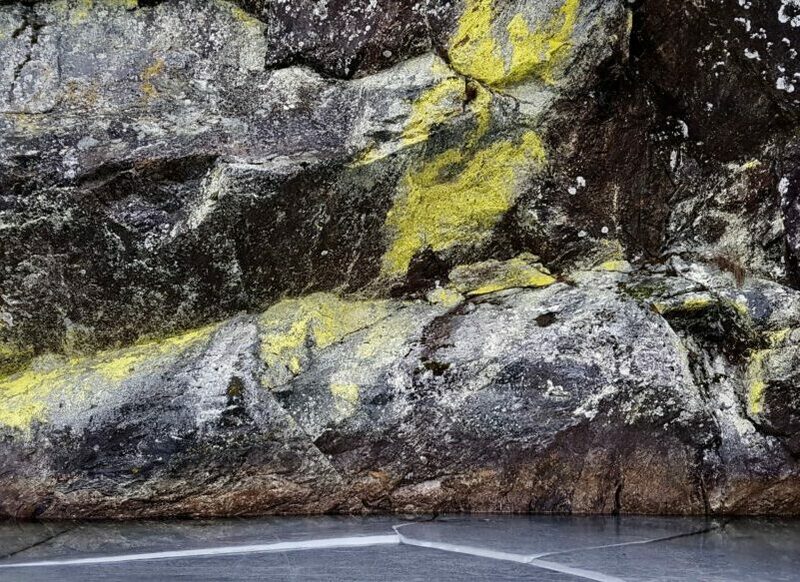 The yellow Wolf Lichen” – Letharia Vulpina – is found in very old forests and not common at all in Sweden nowadays. 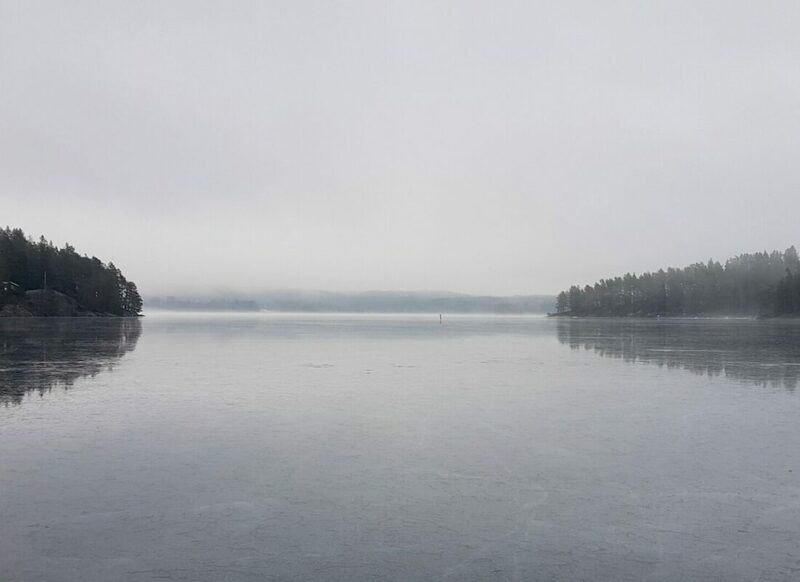 The last day we were lucky to see the sun. 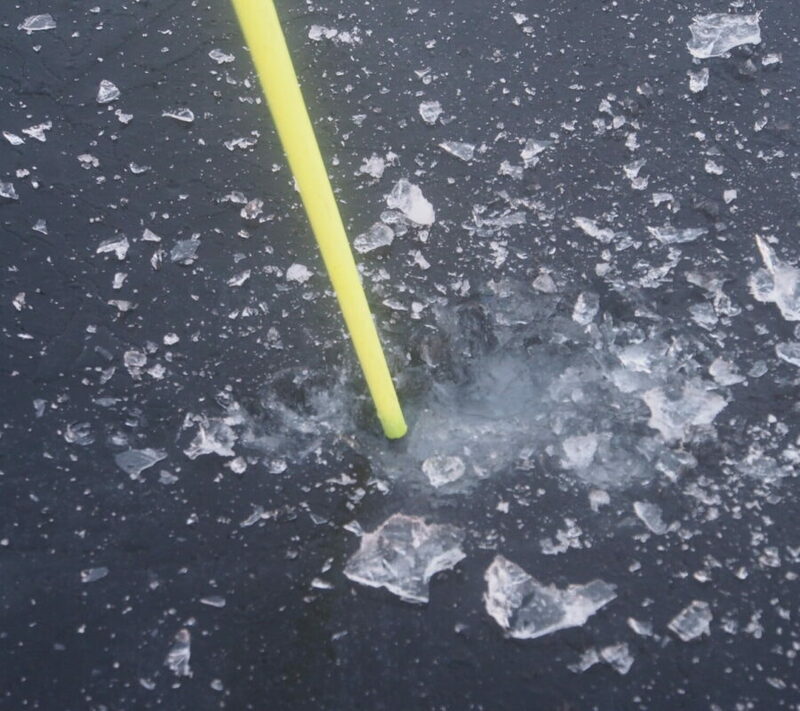 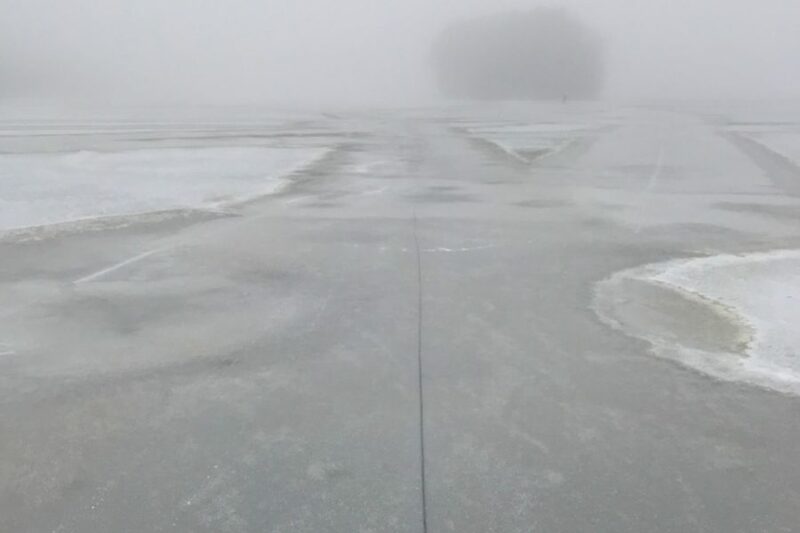 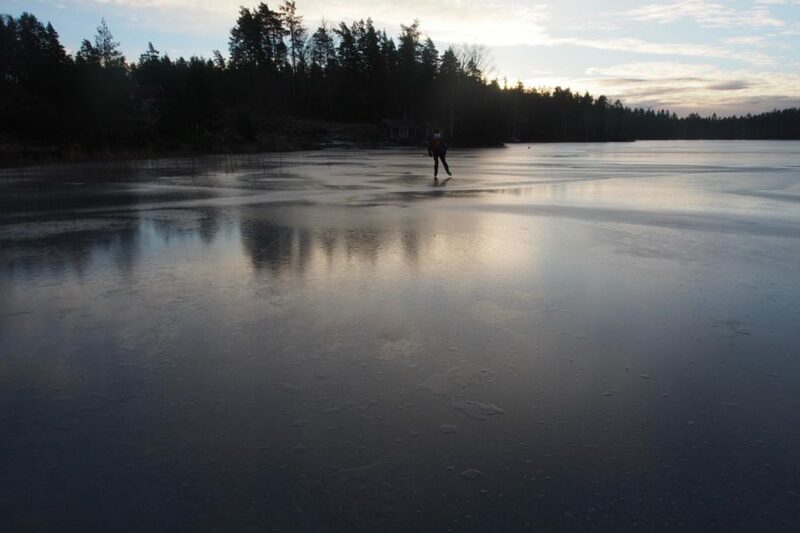 Even if the temperature was a couple of degrees above zero the ice was skatable. 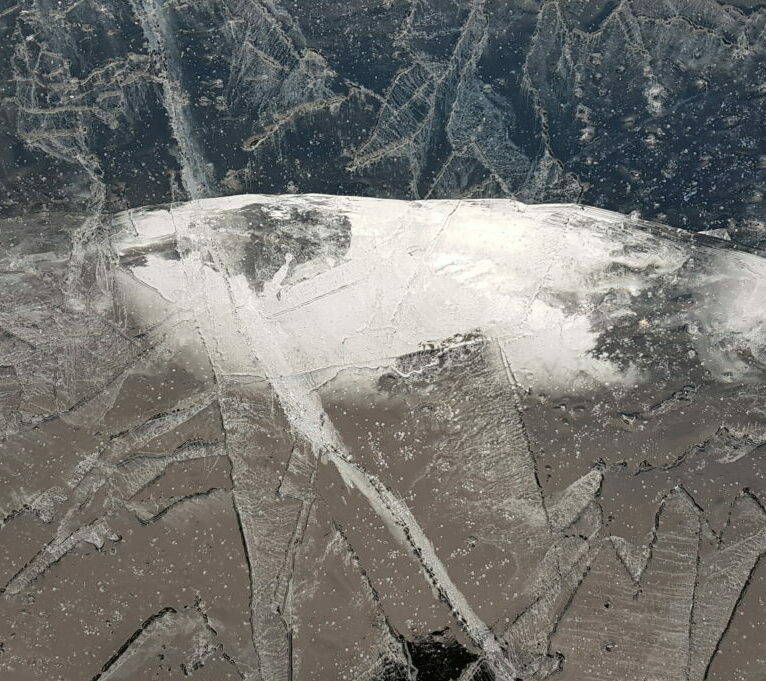 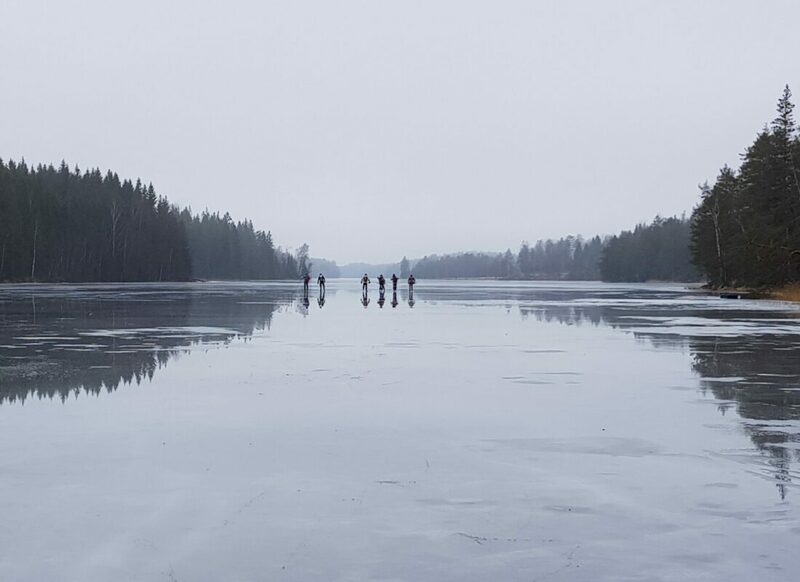 The water on the ice gave gorgeous reflections in all different colours. 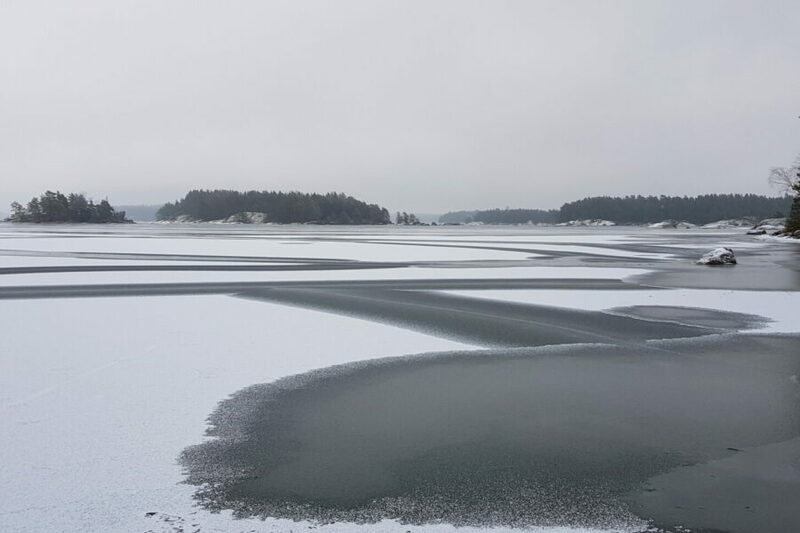 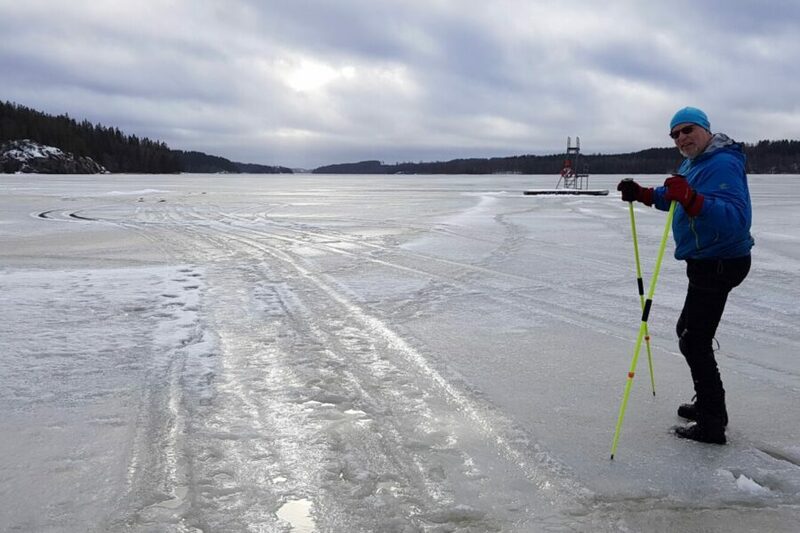 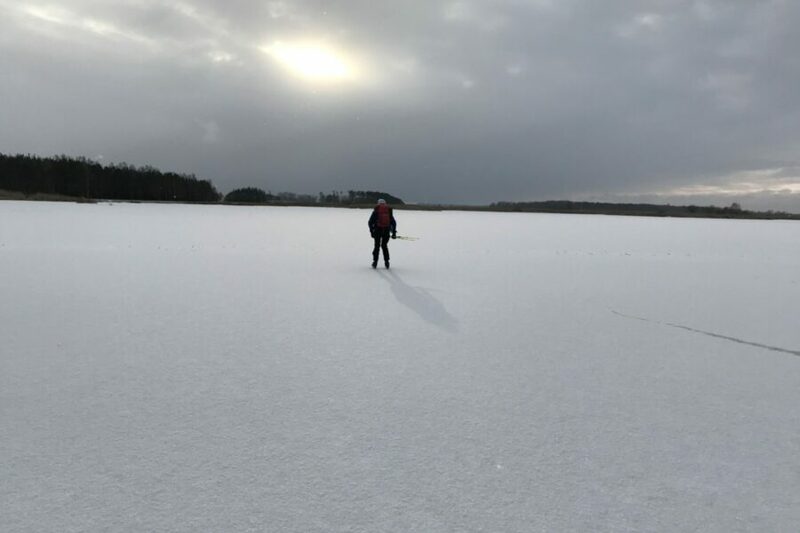 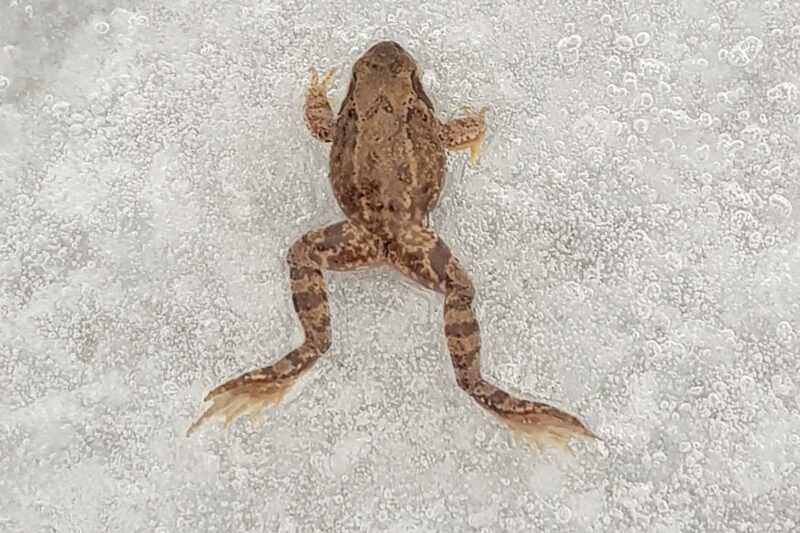 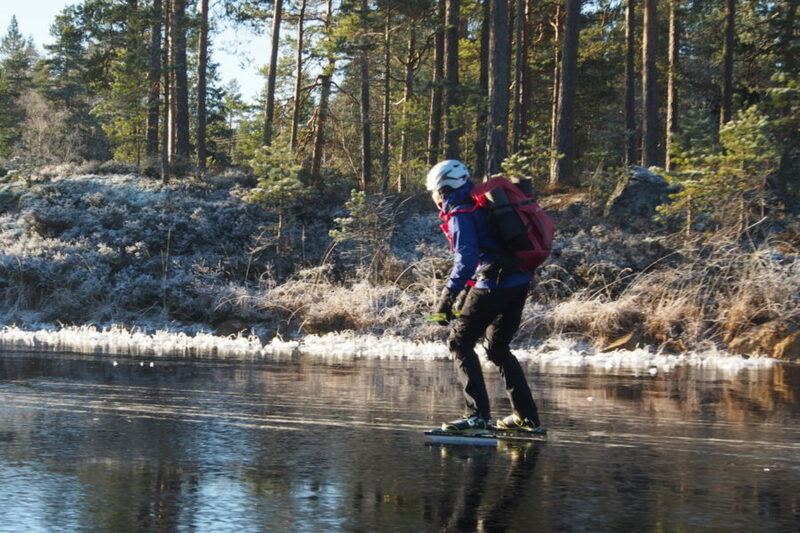 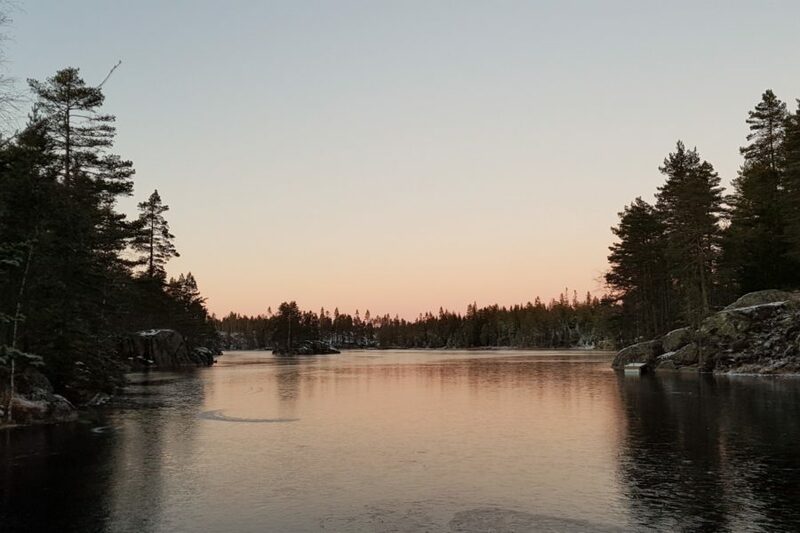 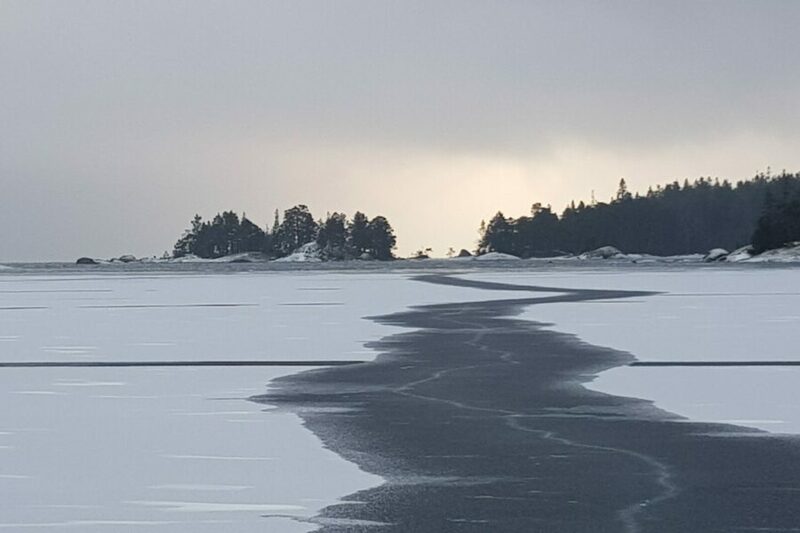 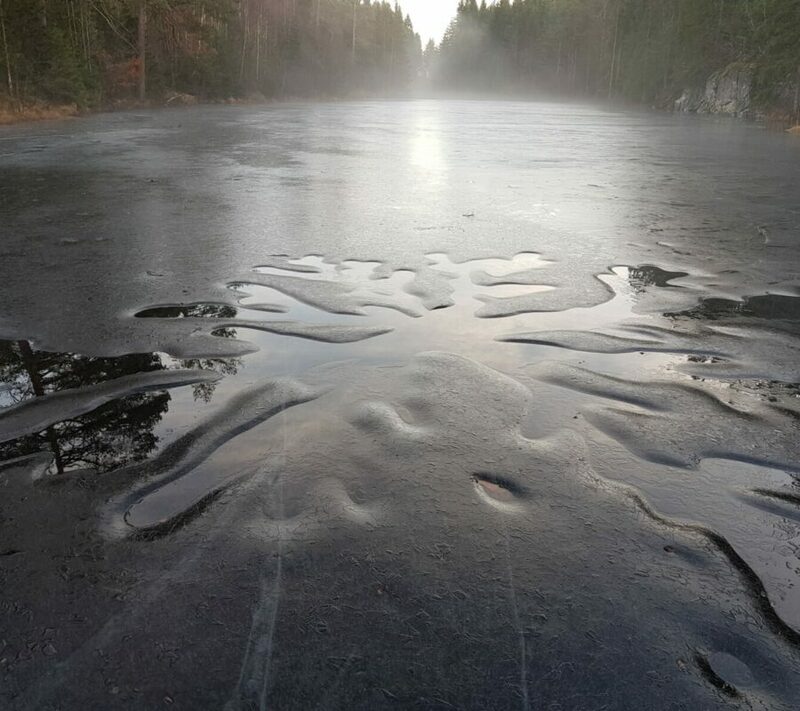 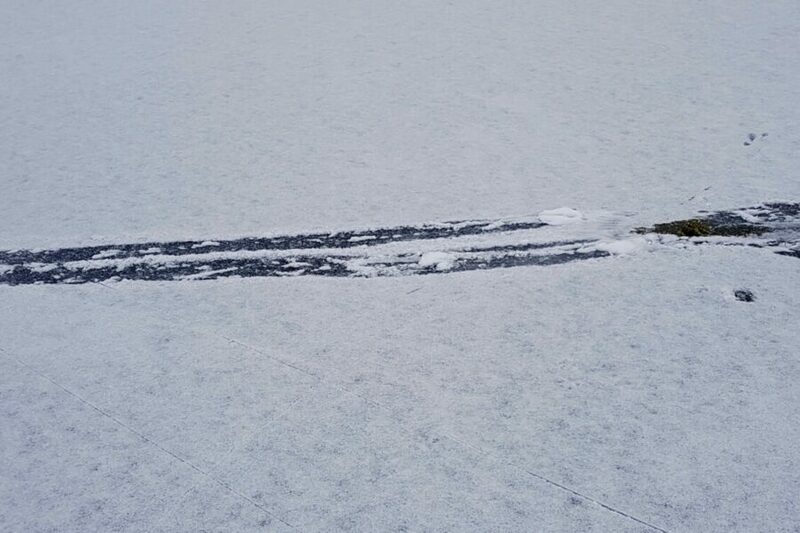 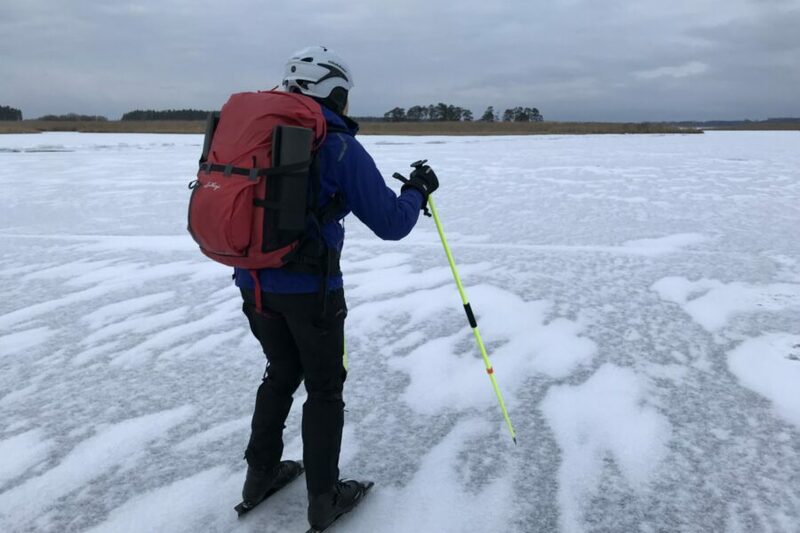 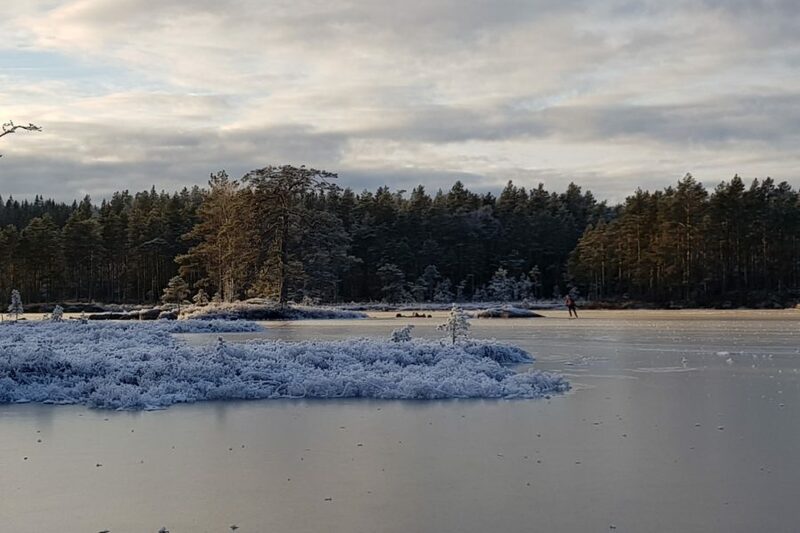 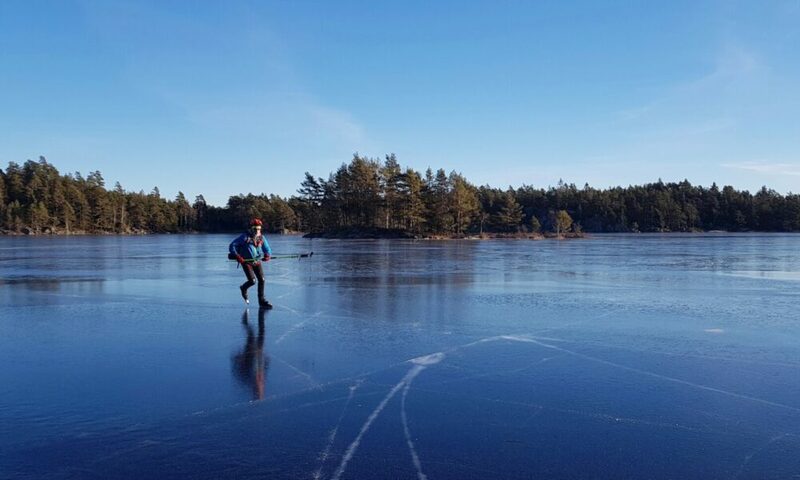 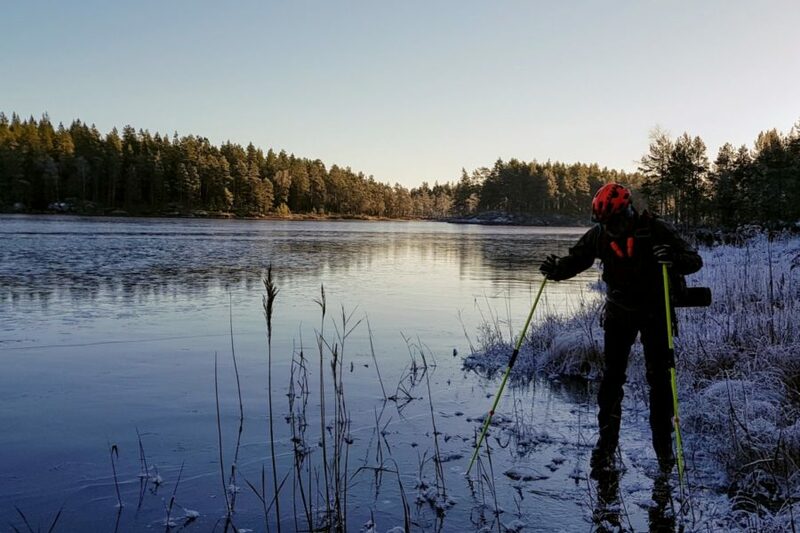 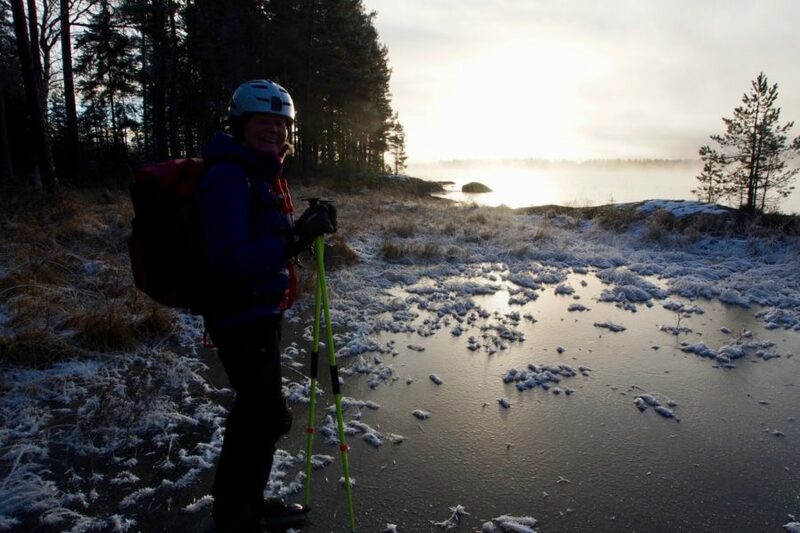 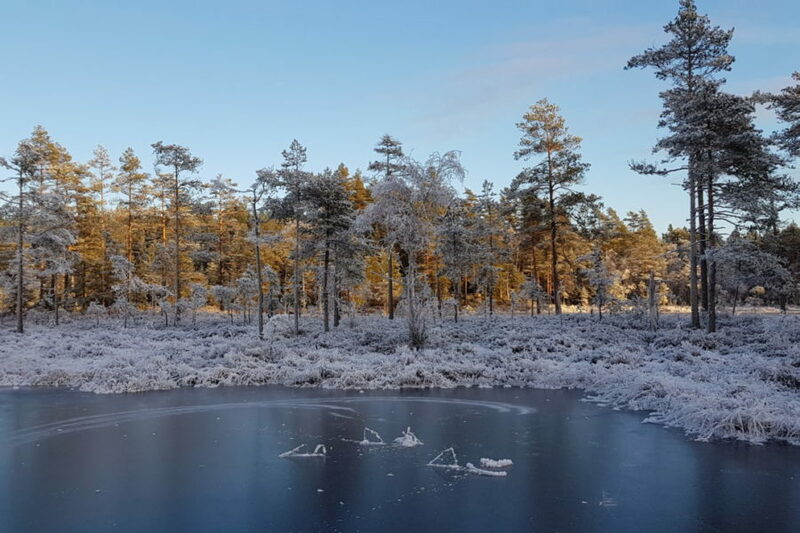 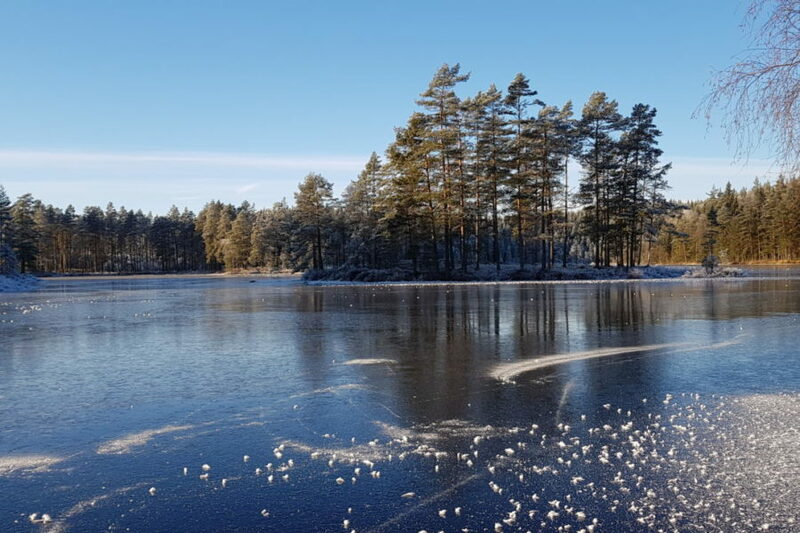 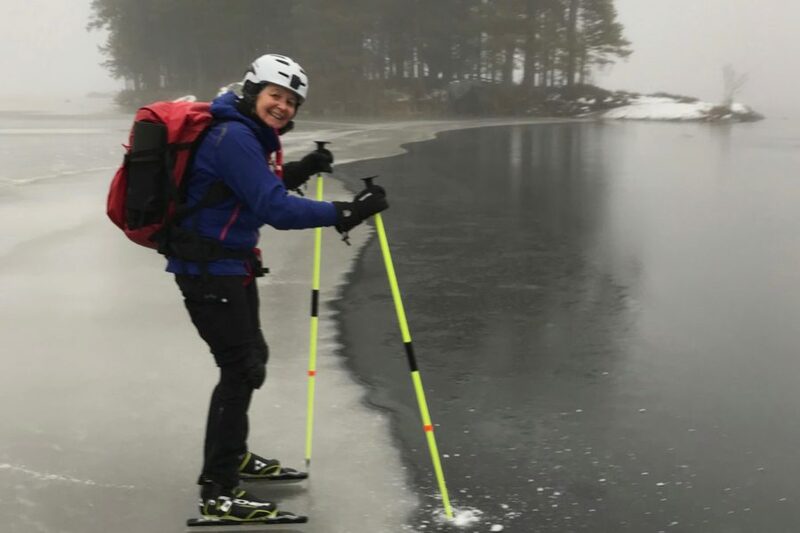 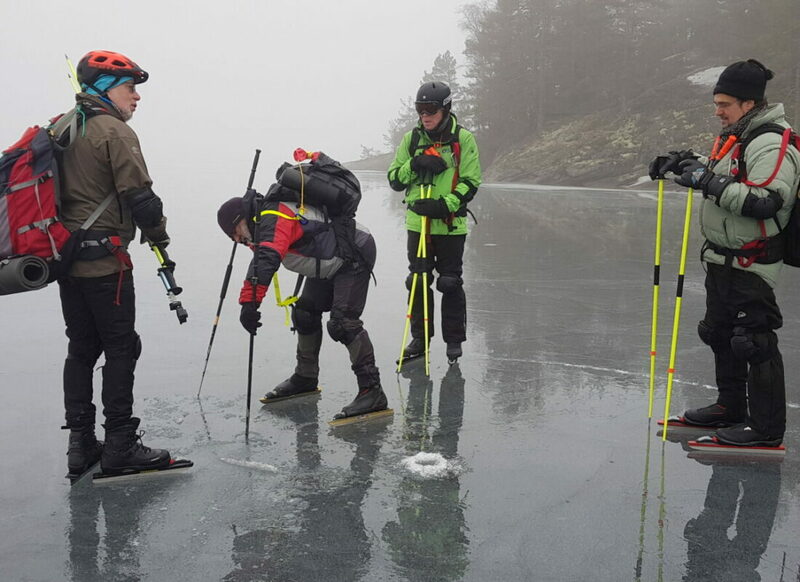 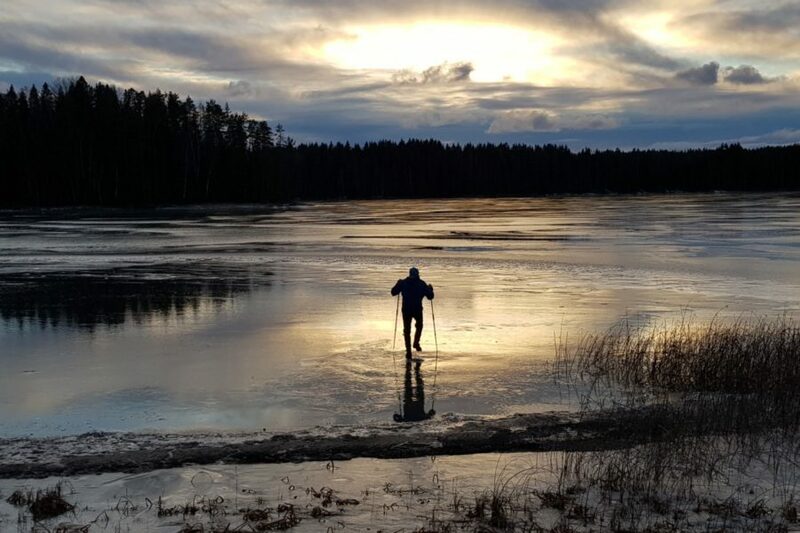 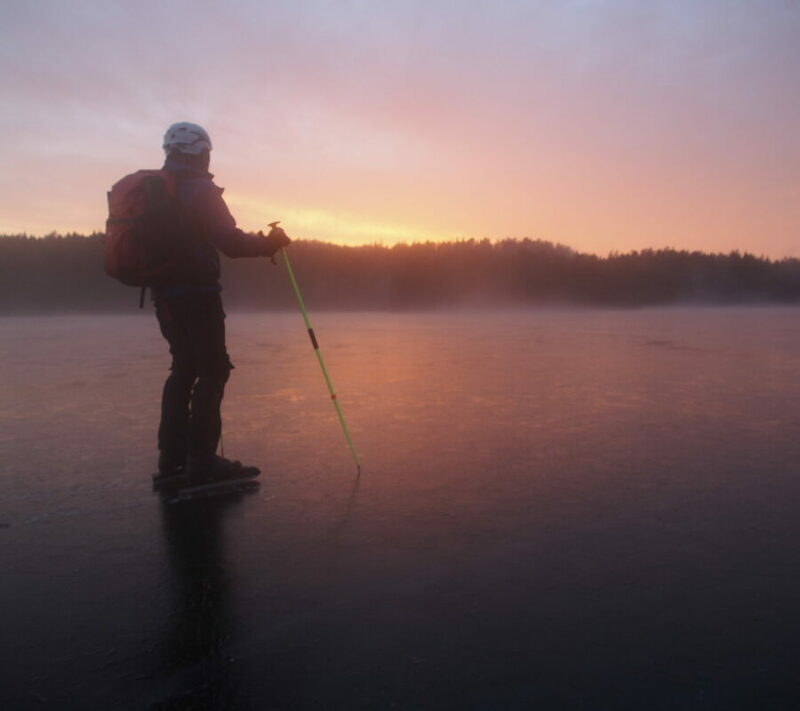 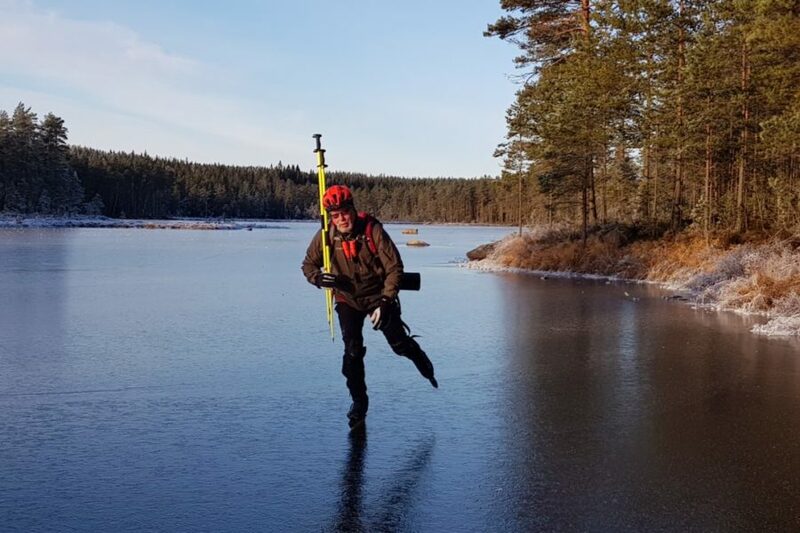 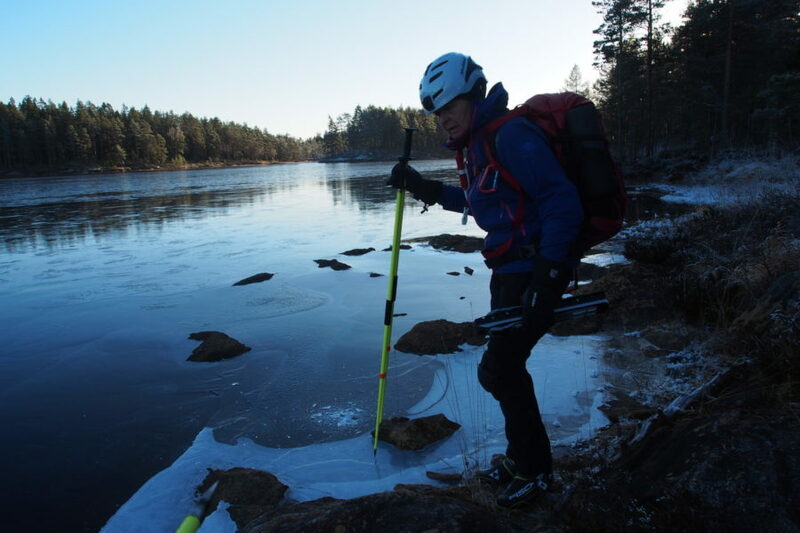 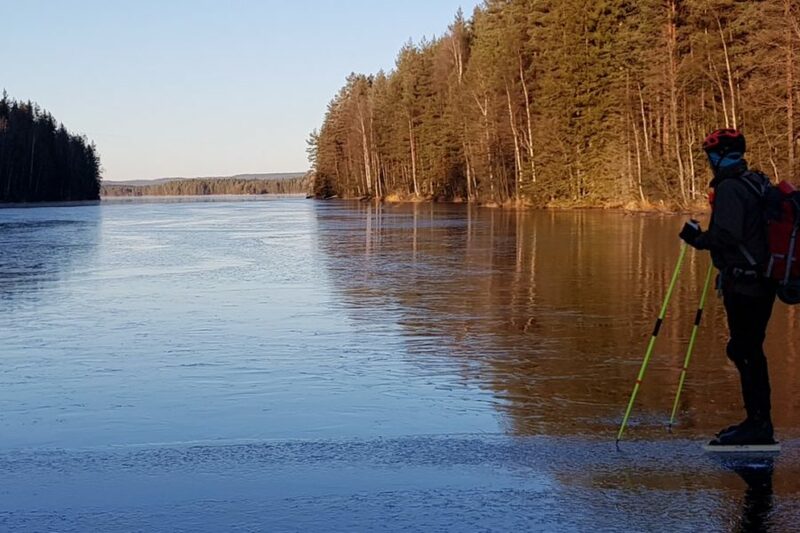 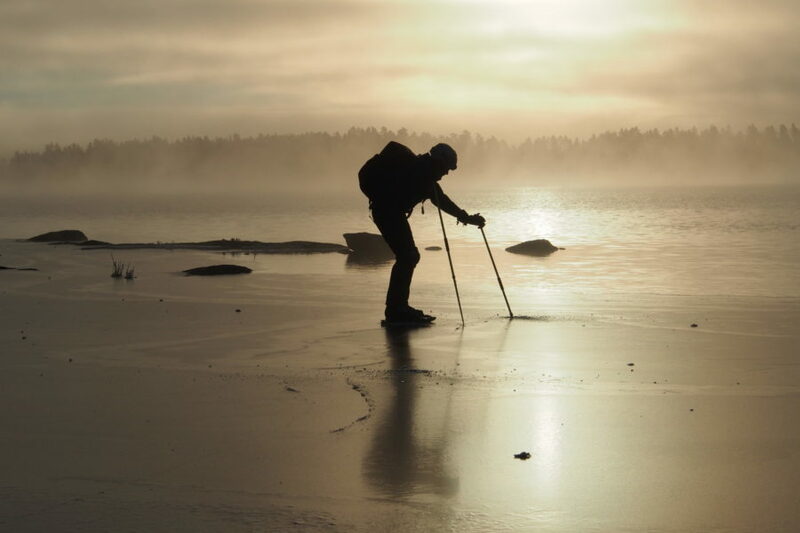 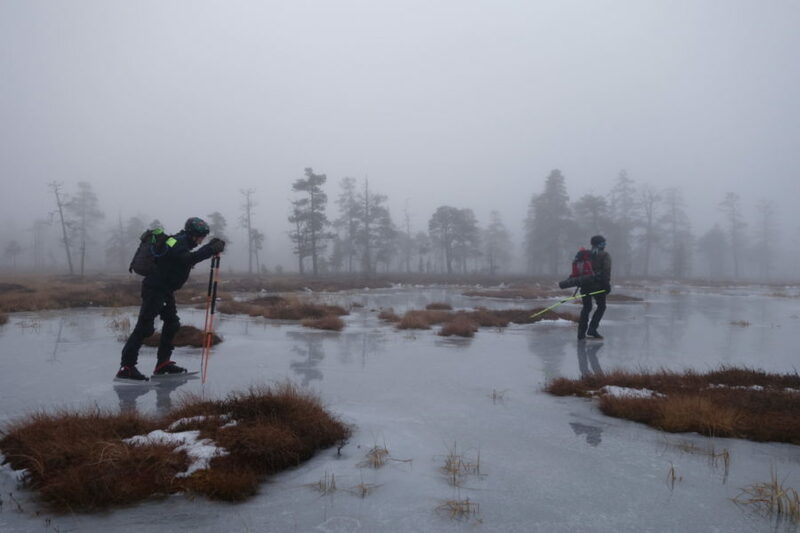 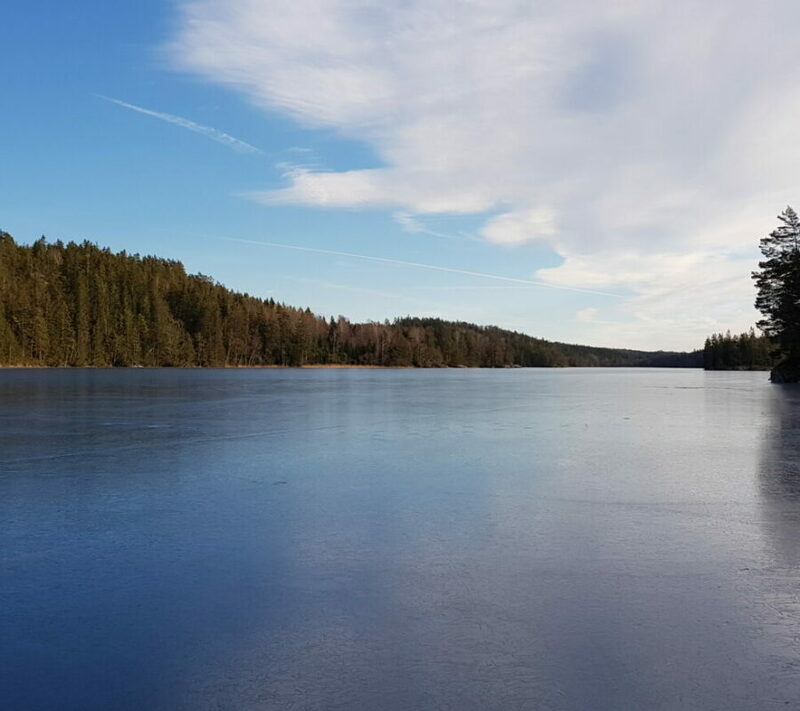 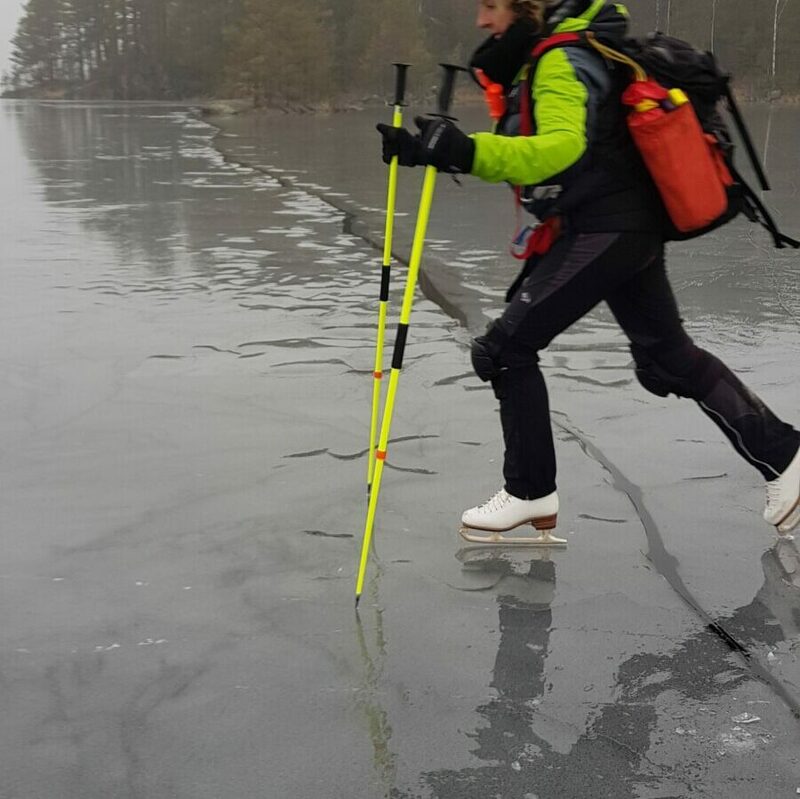 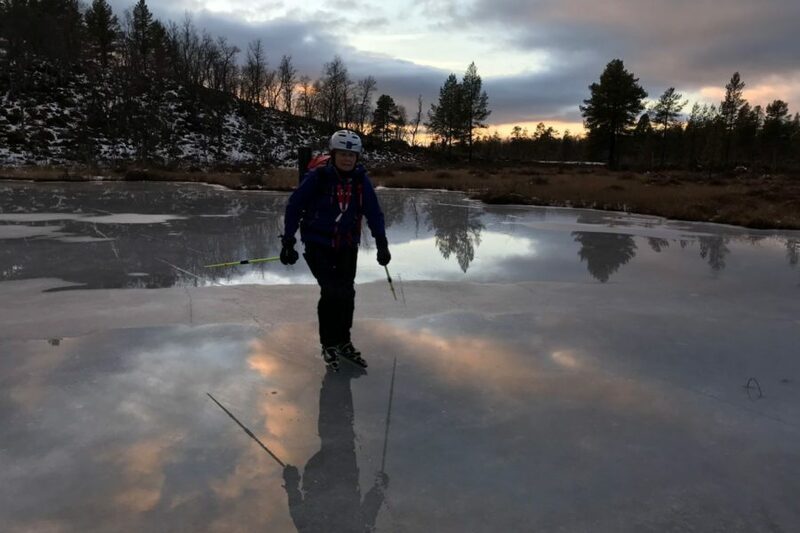 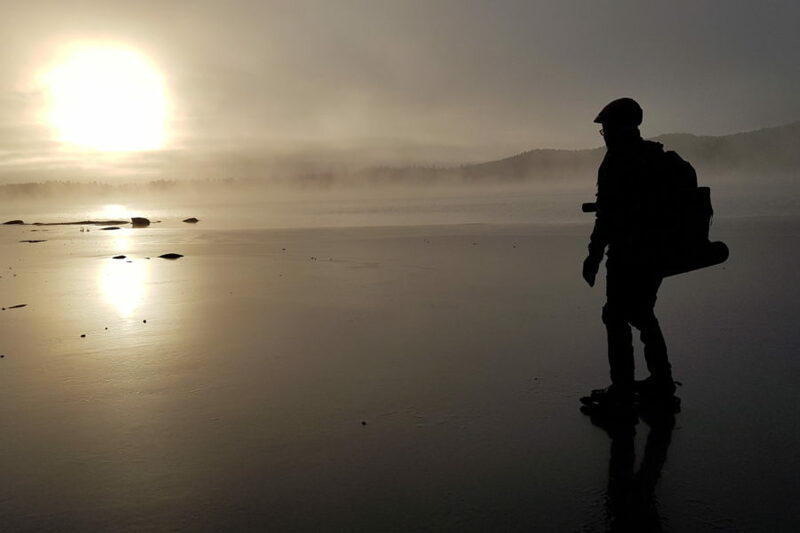 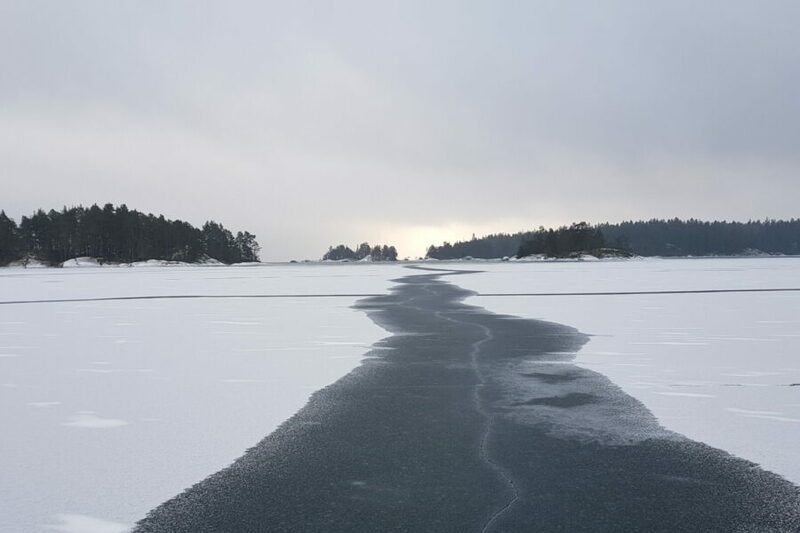 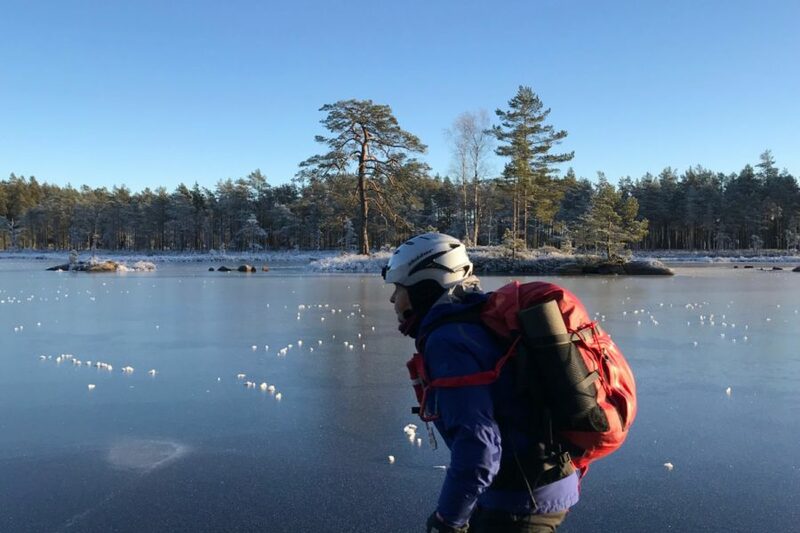 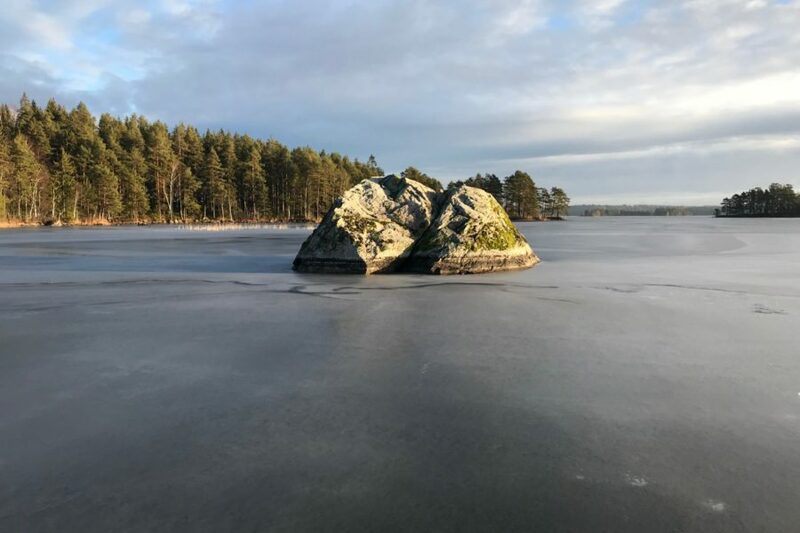 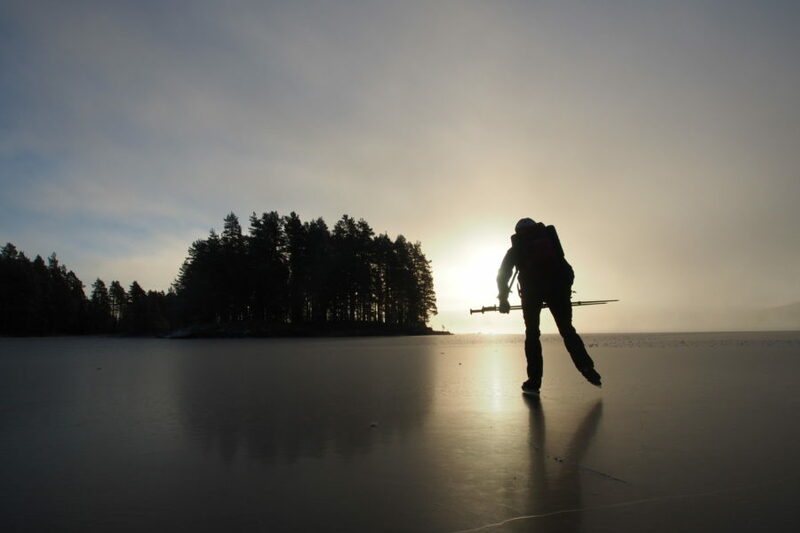 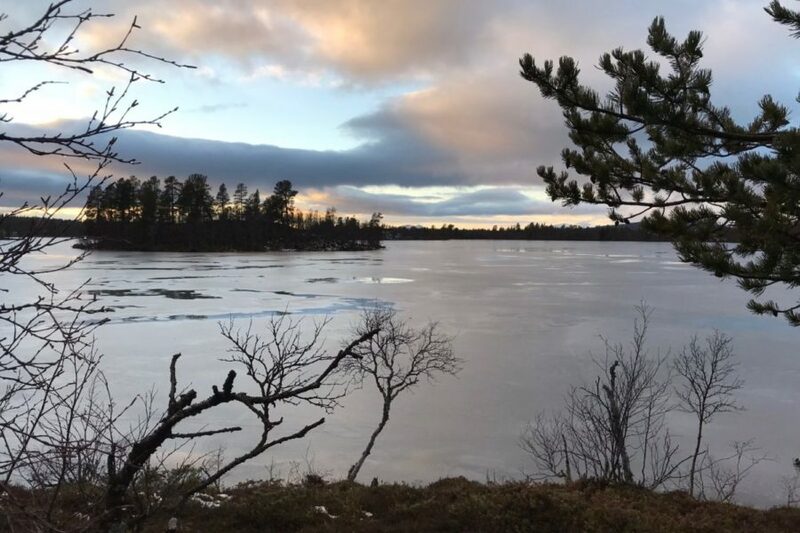 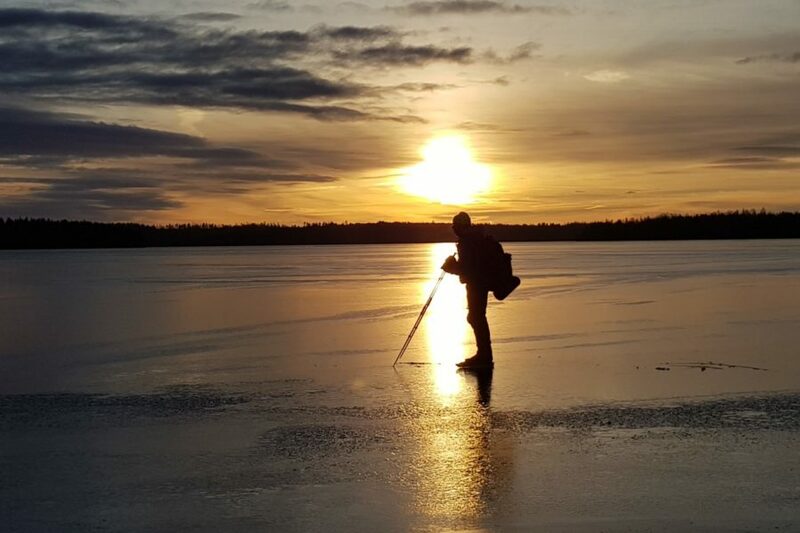 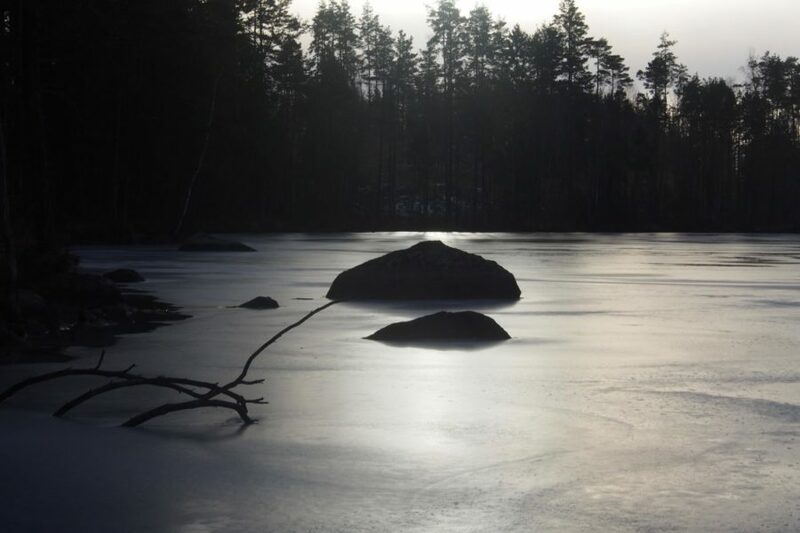 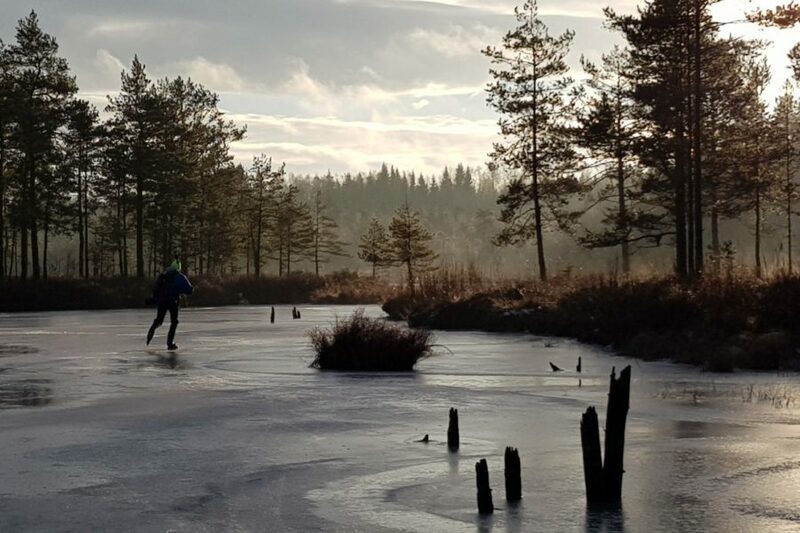 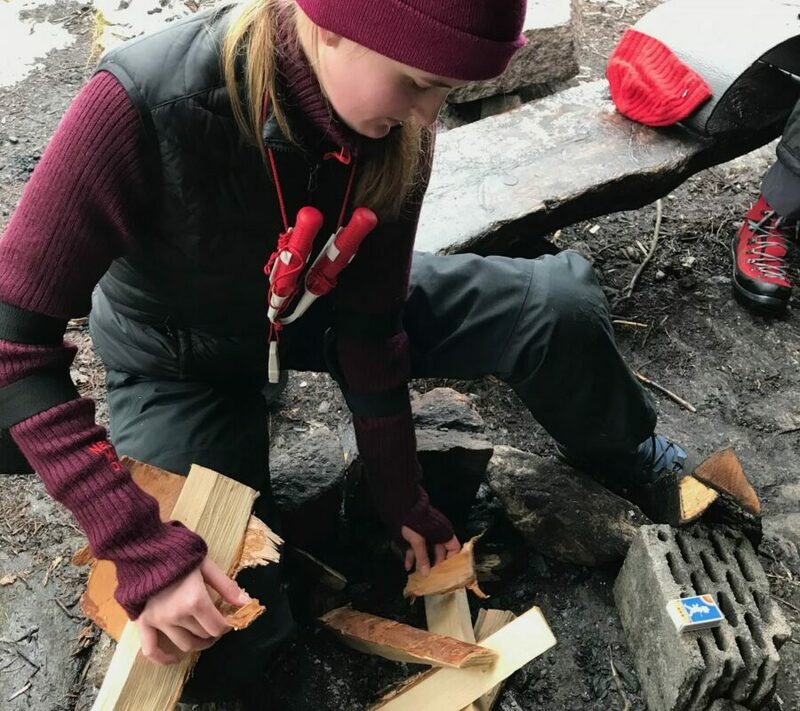 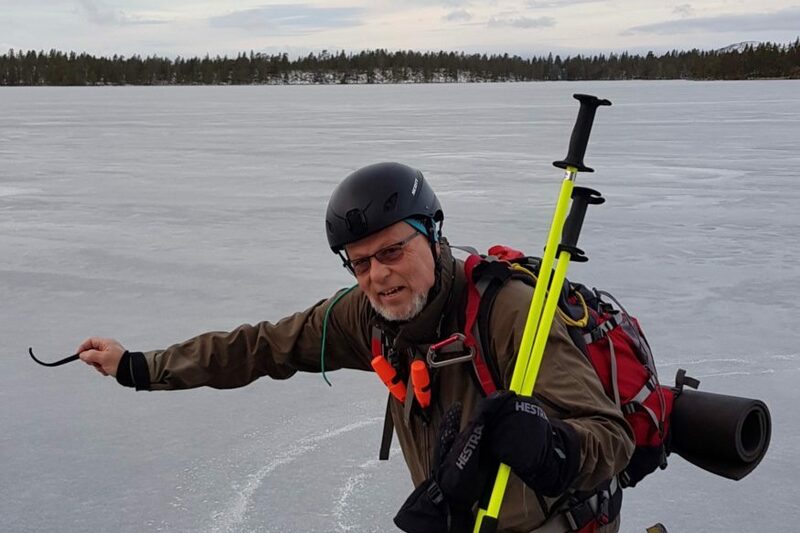 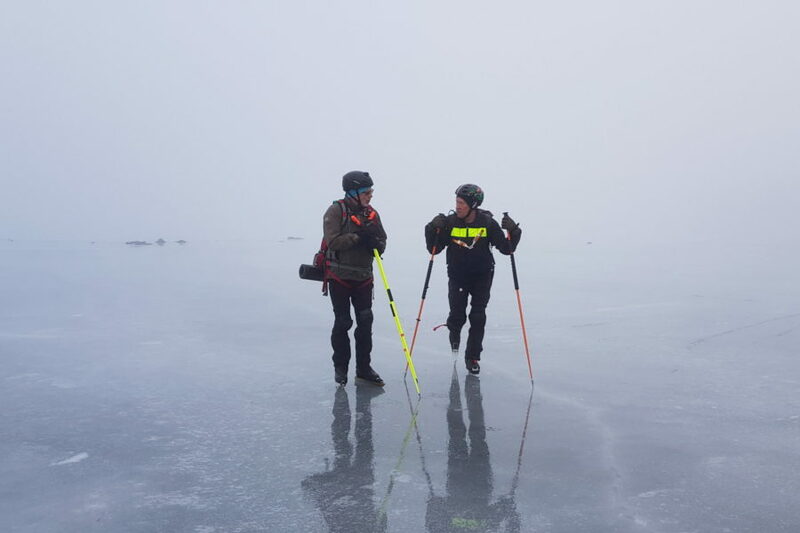 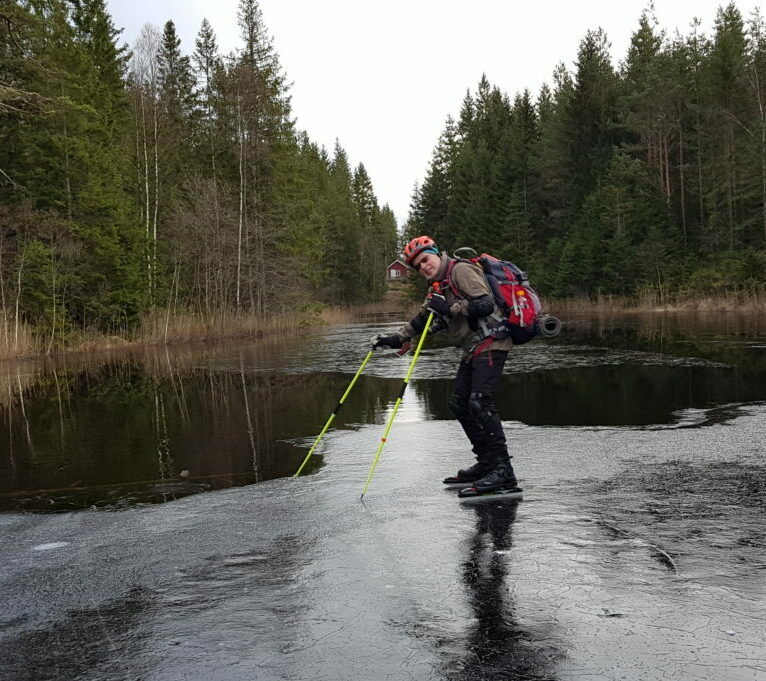 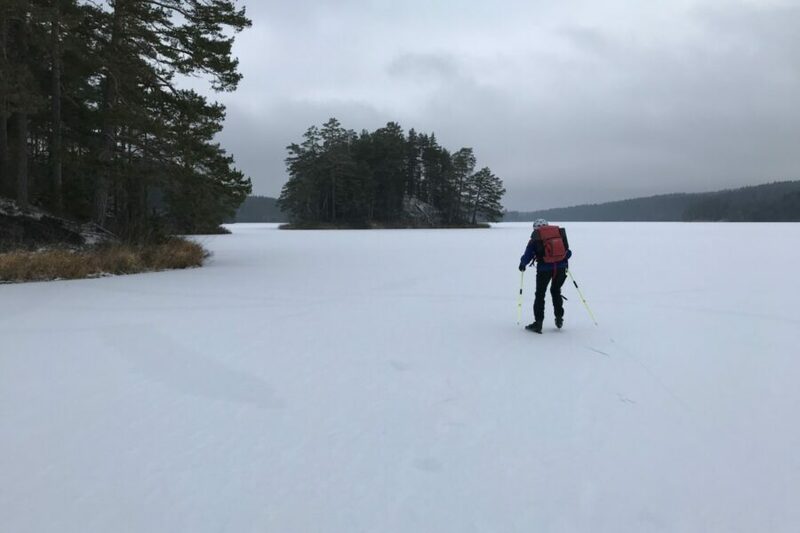 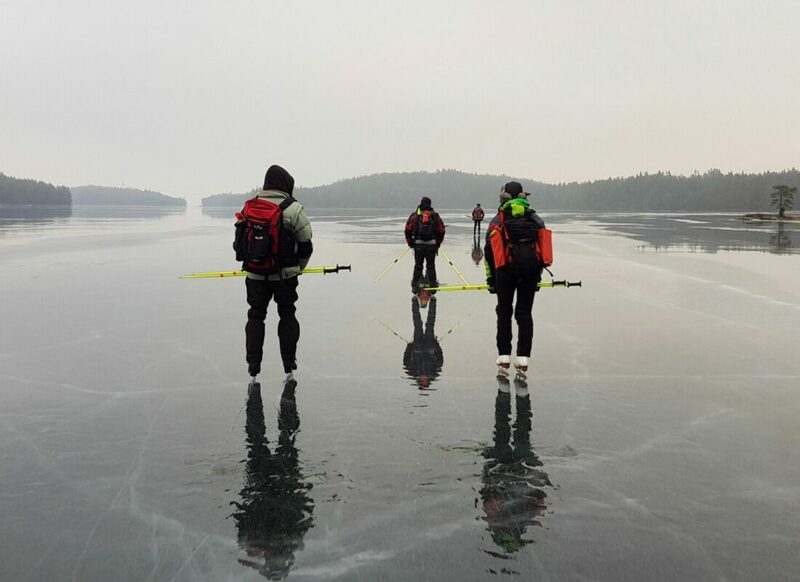 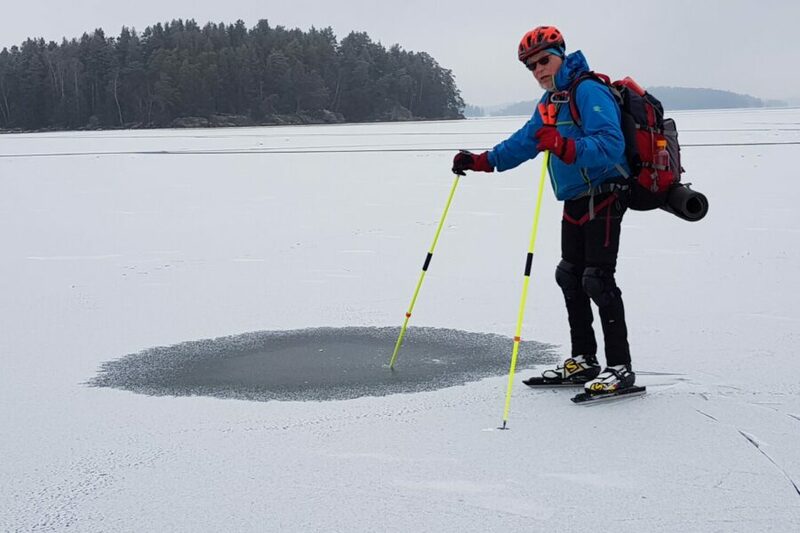 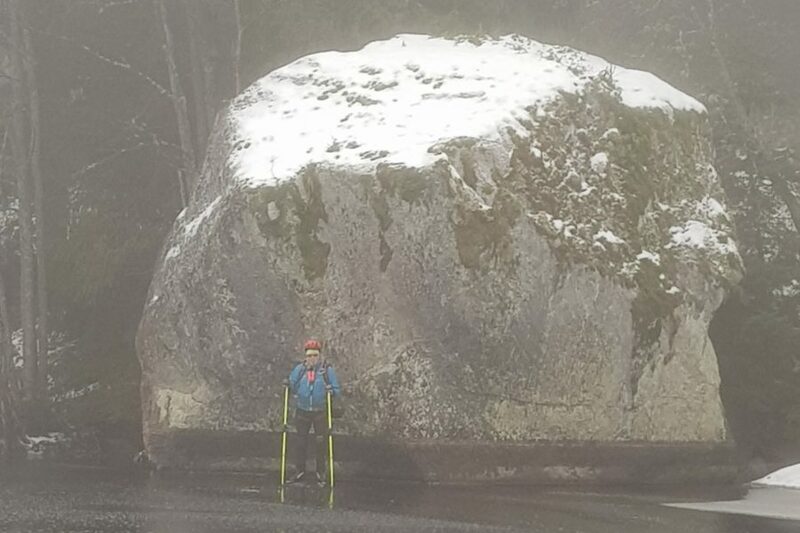 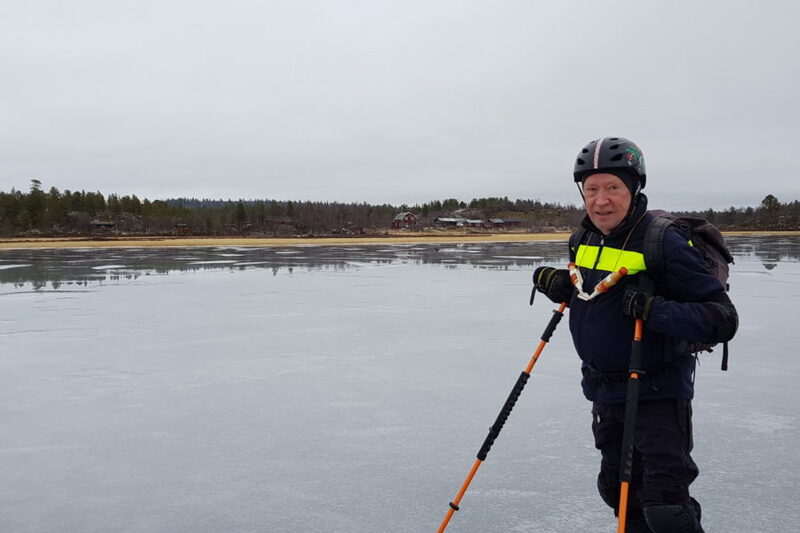 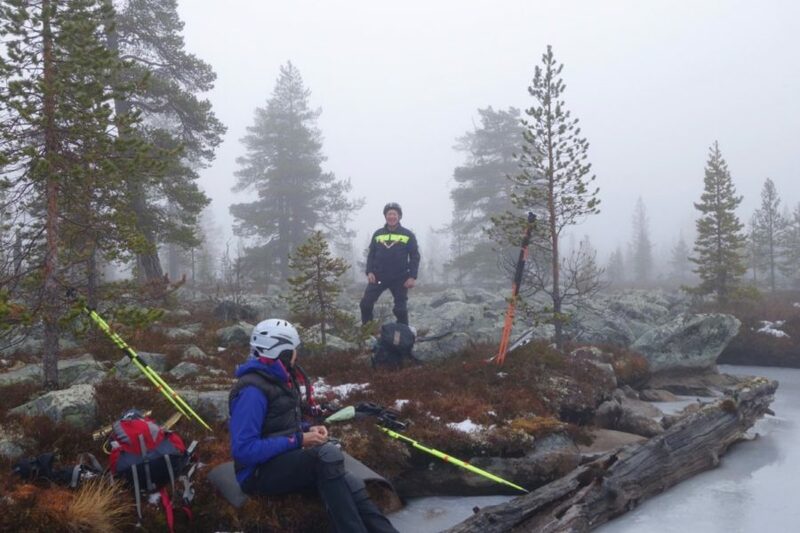 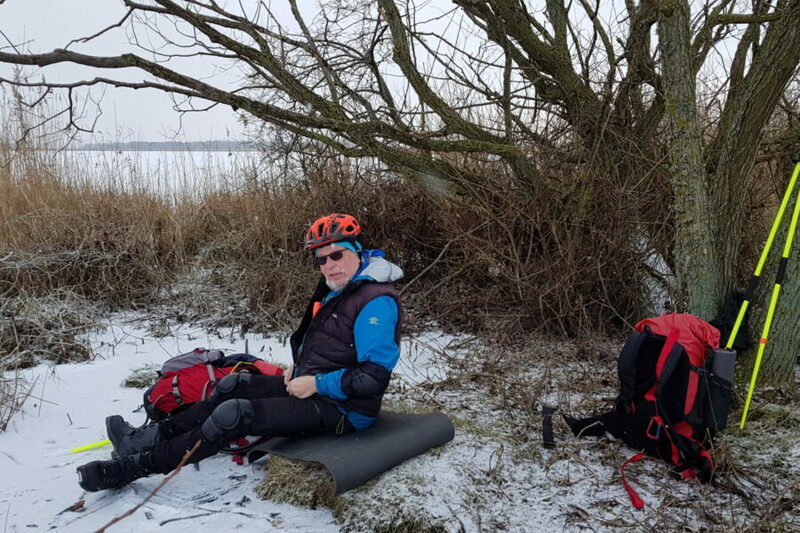 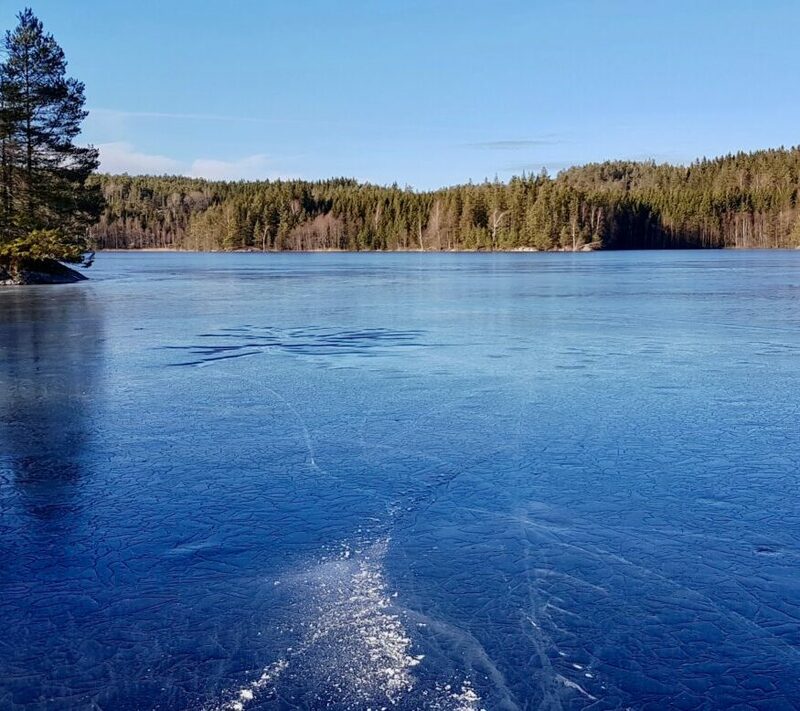 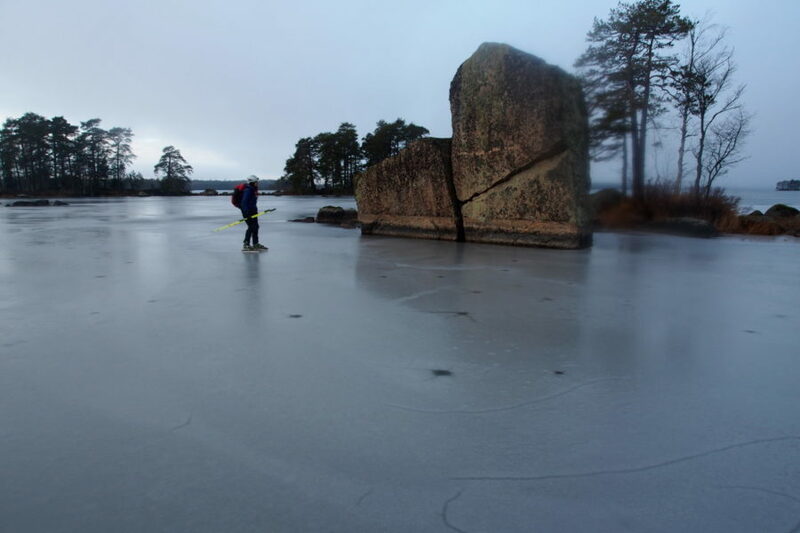 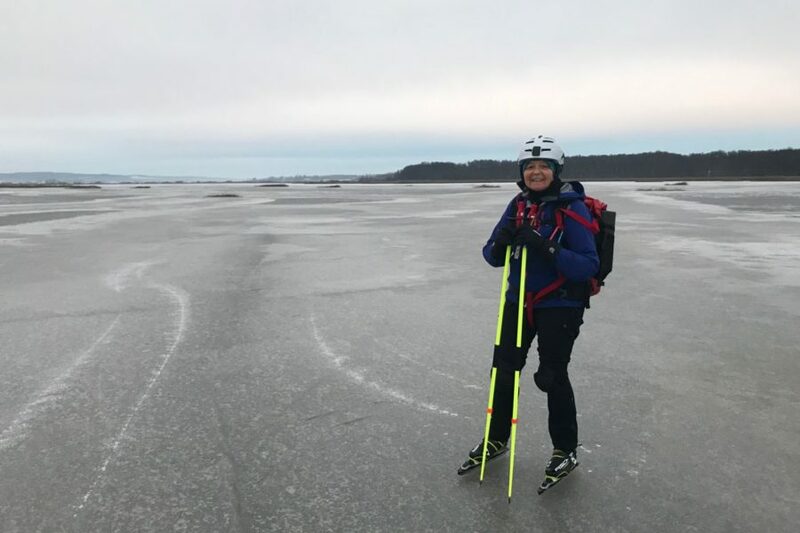 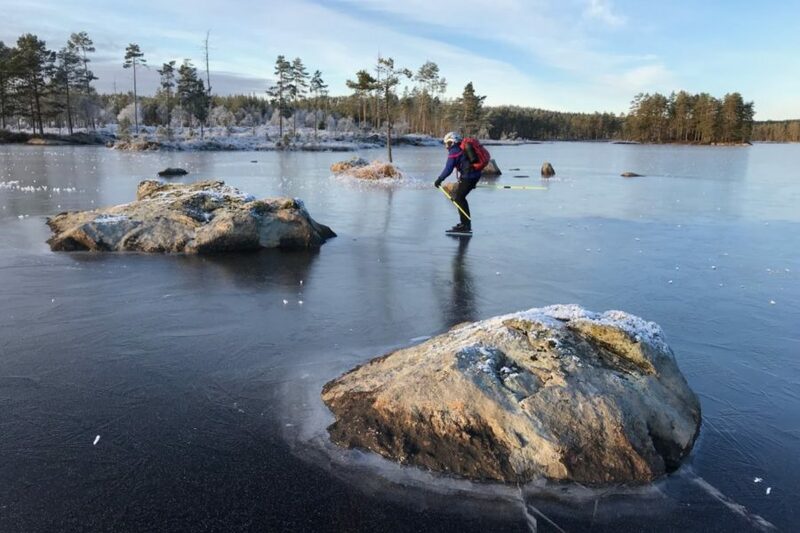 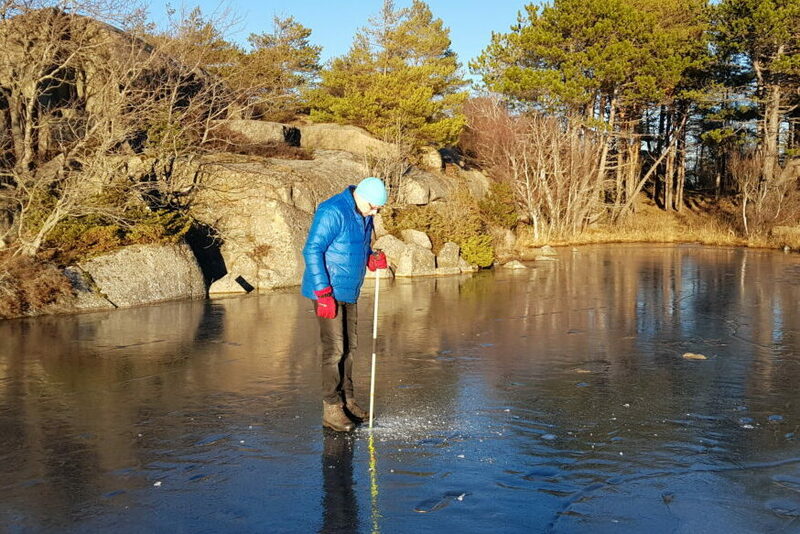 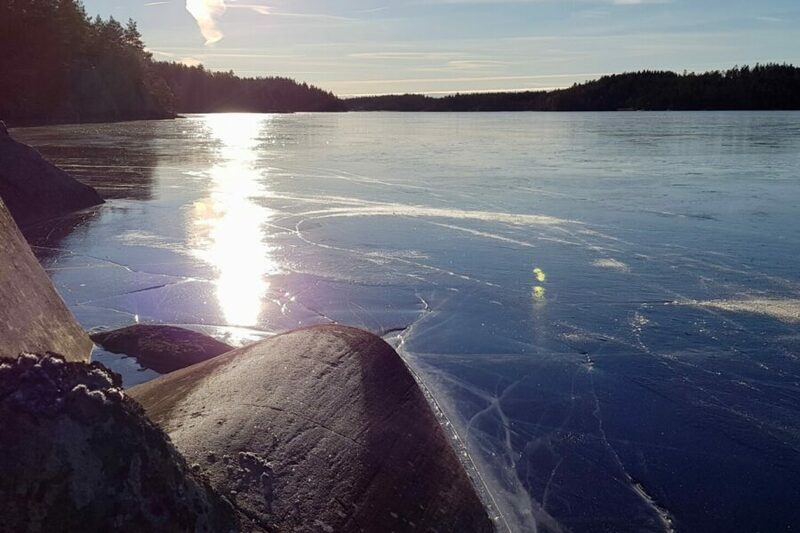 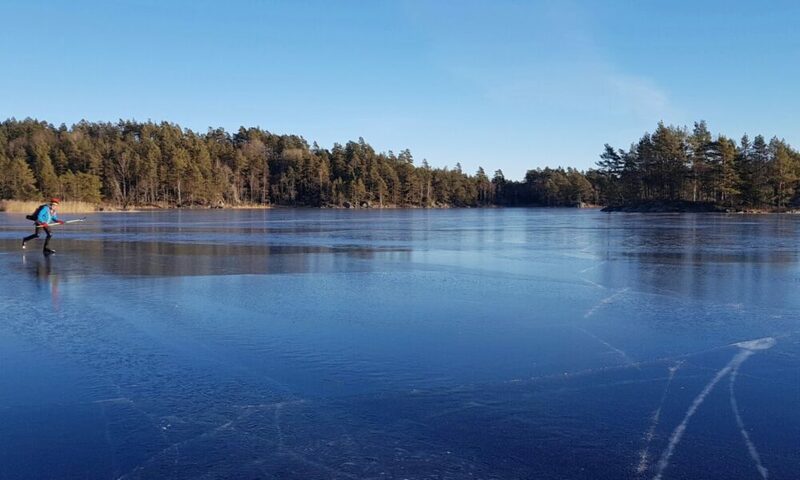 Nordic Skating is a wonderful way to experience new environments, nature and wildlife. 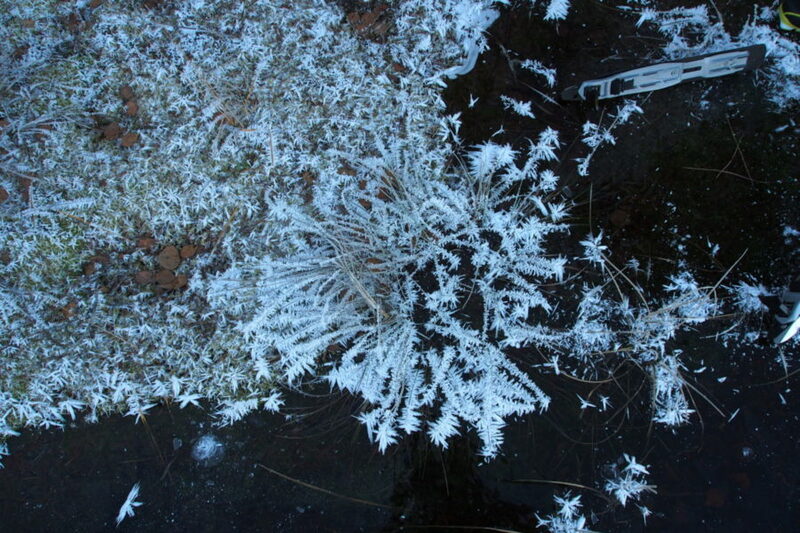 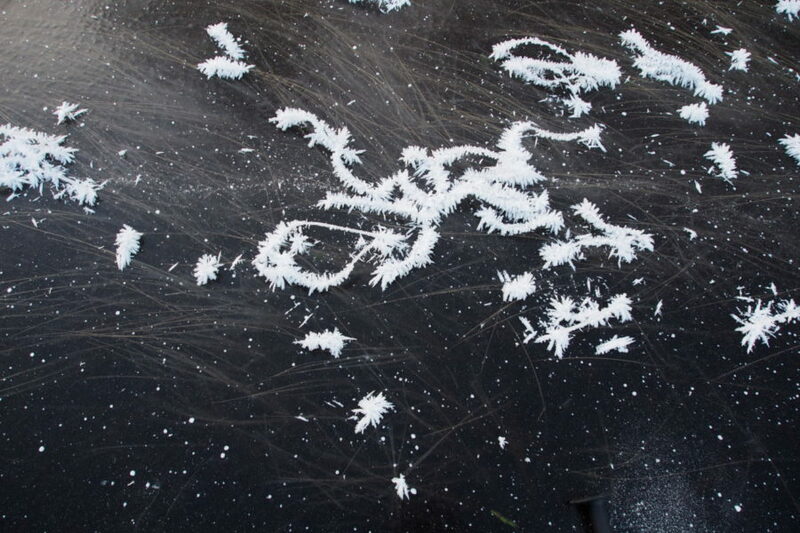 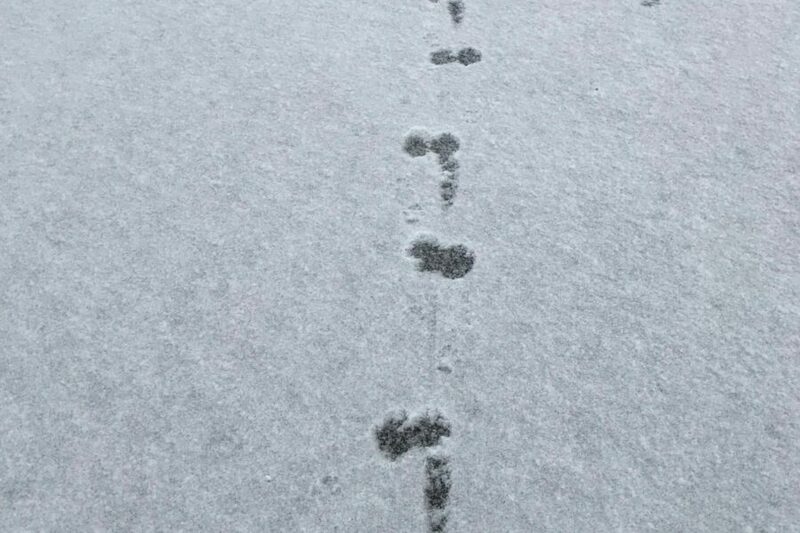 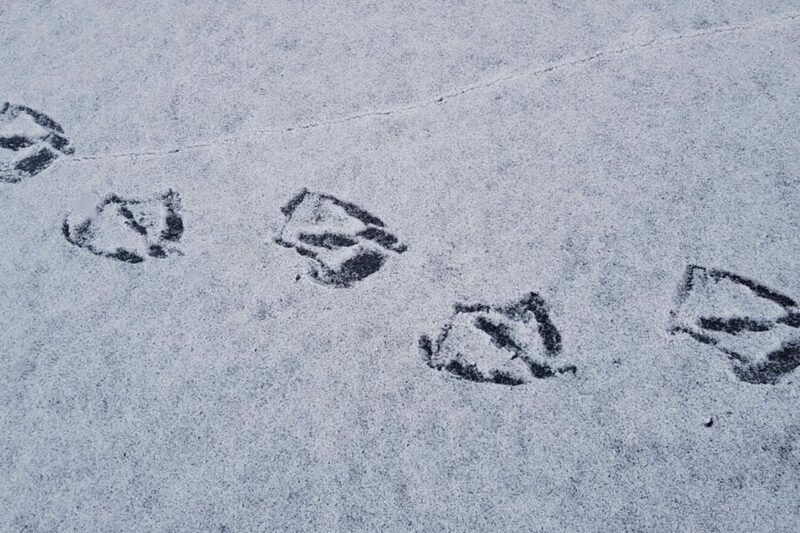 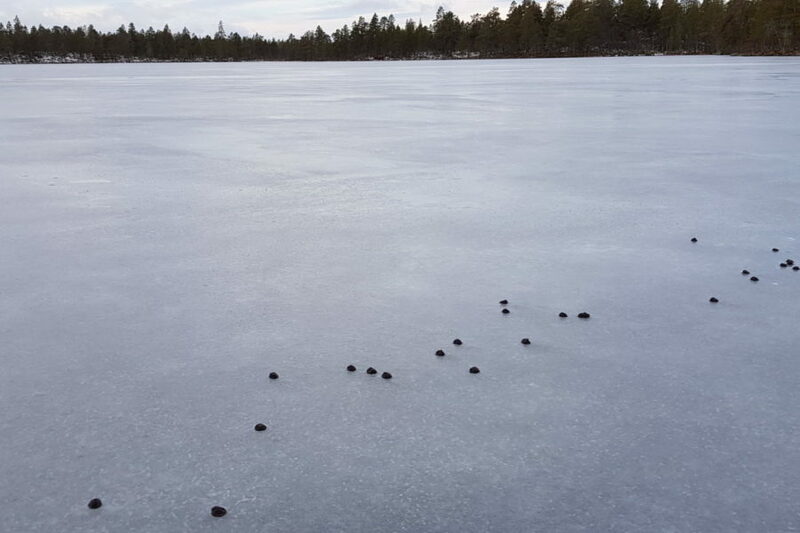 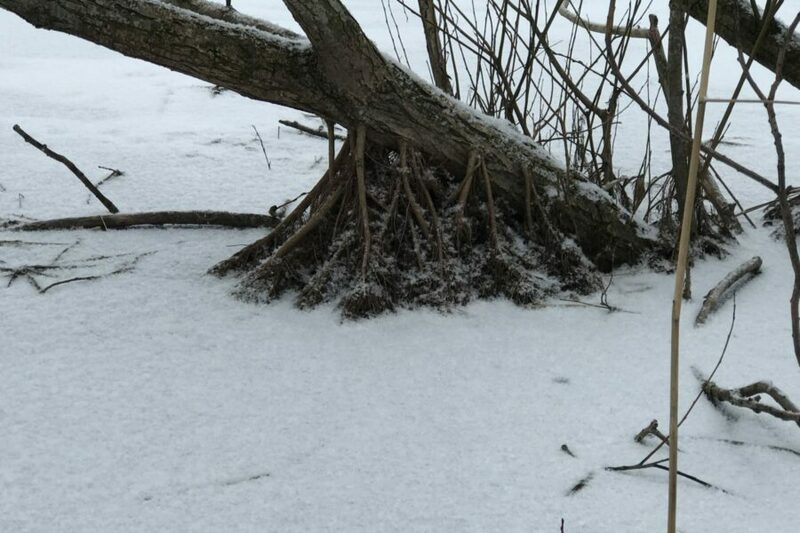 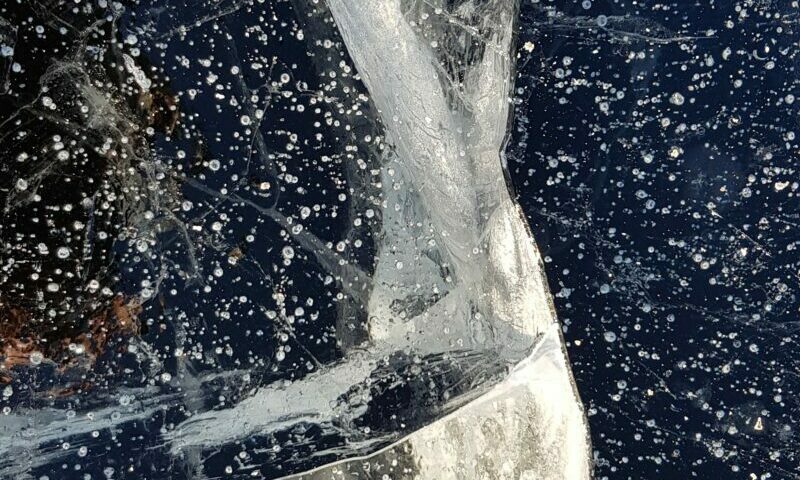 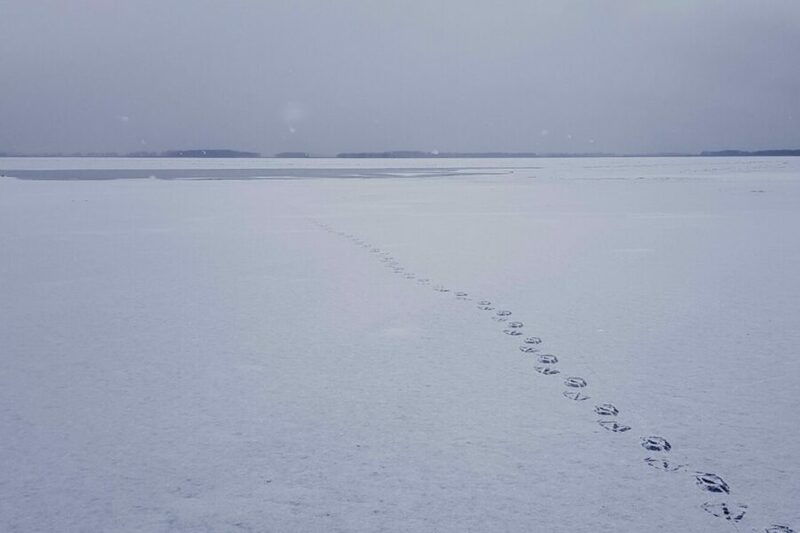 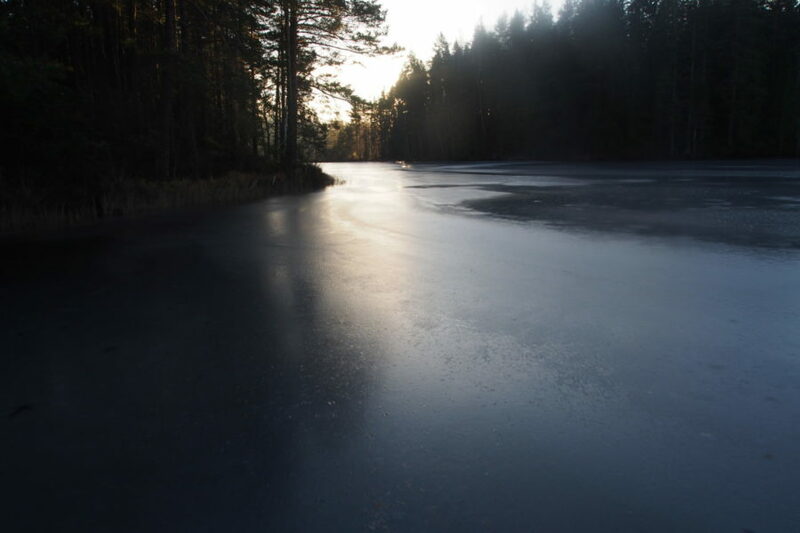 We met some Capercailles, grouses, a frozen frog and found droppings of reindeer on the ice. 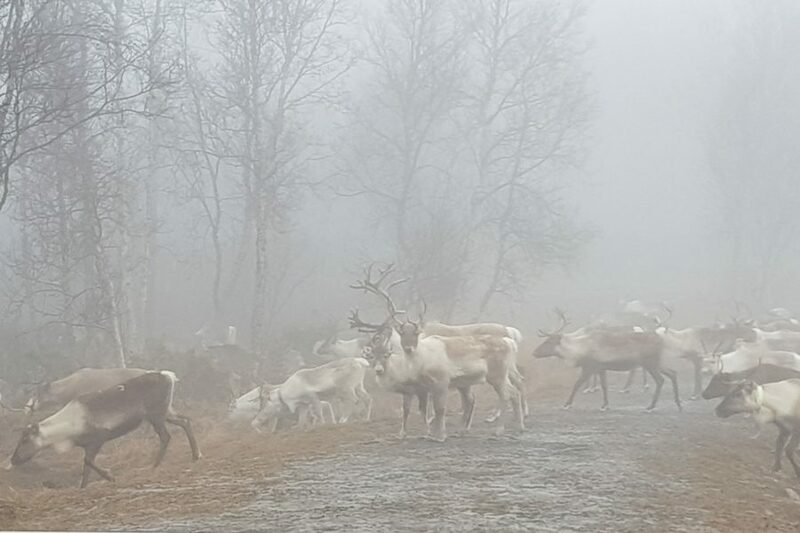 Eventually – on our way home – we met hundreds of reindeers. 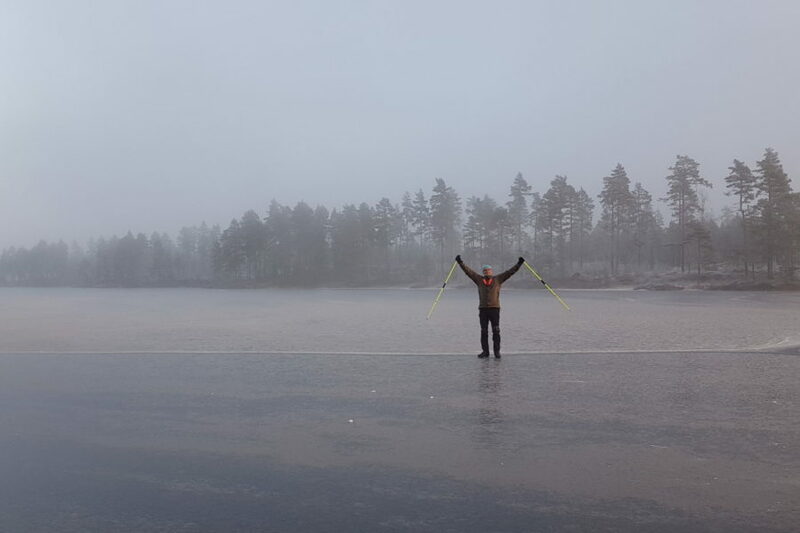 What a start of this season! 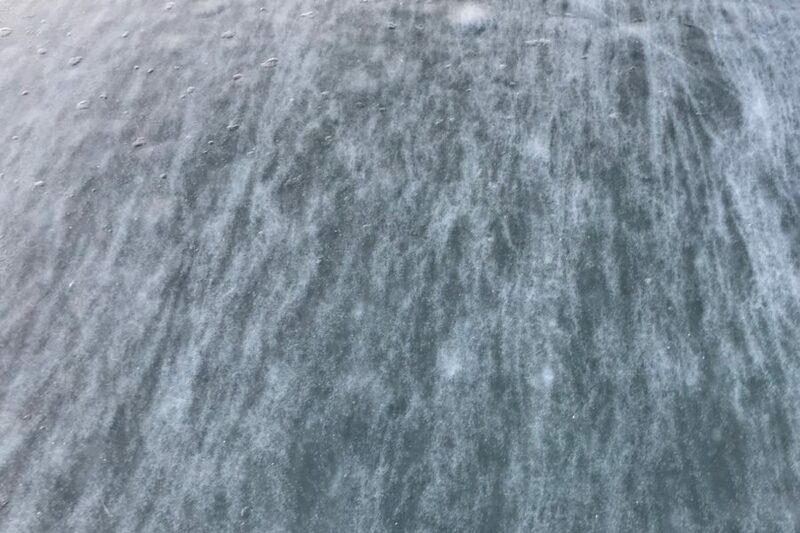 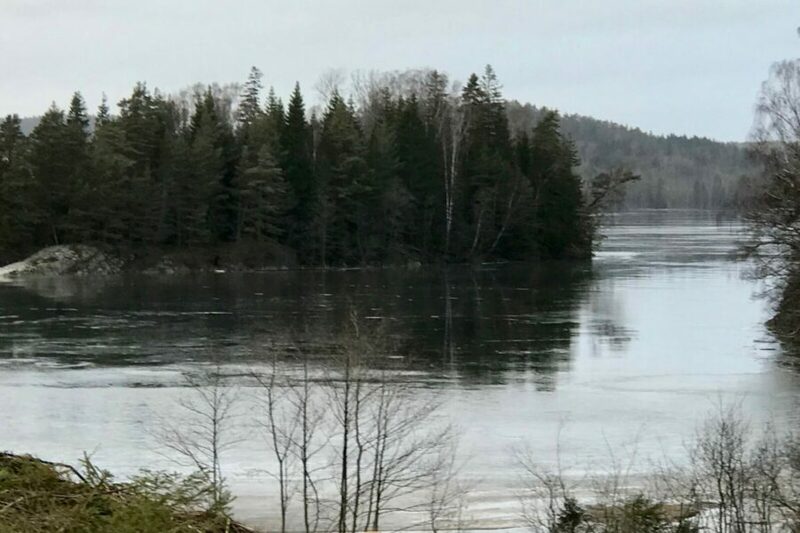 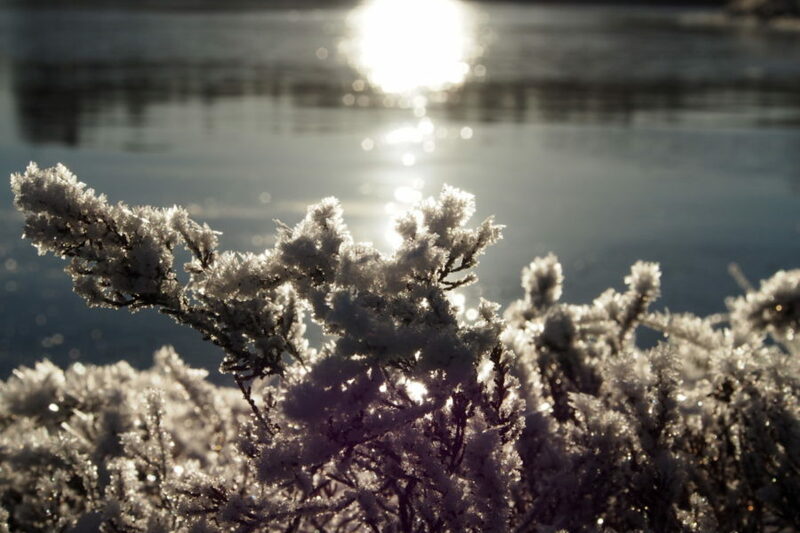 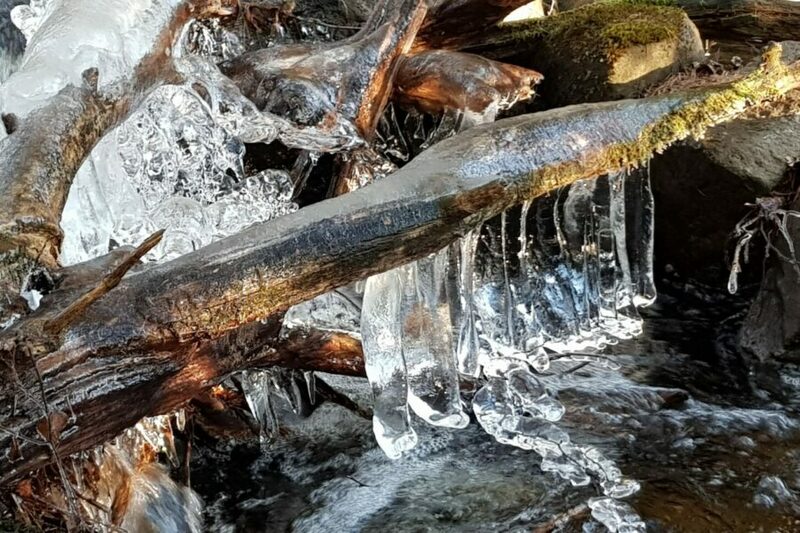 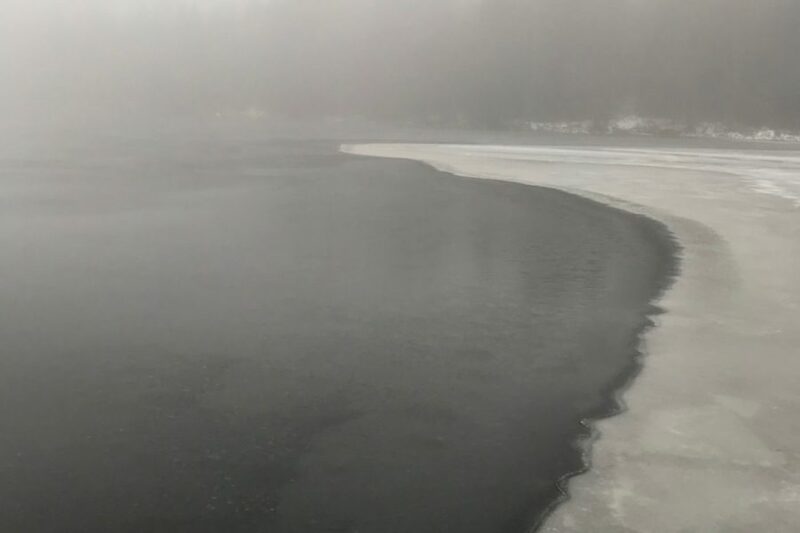 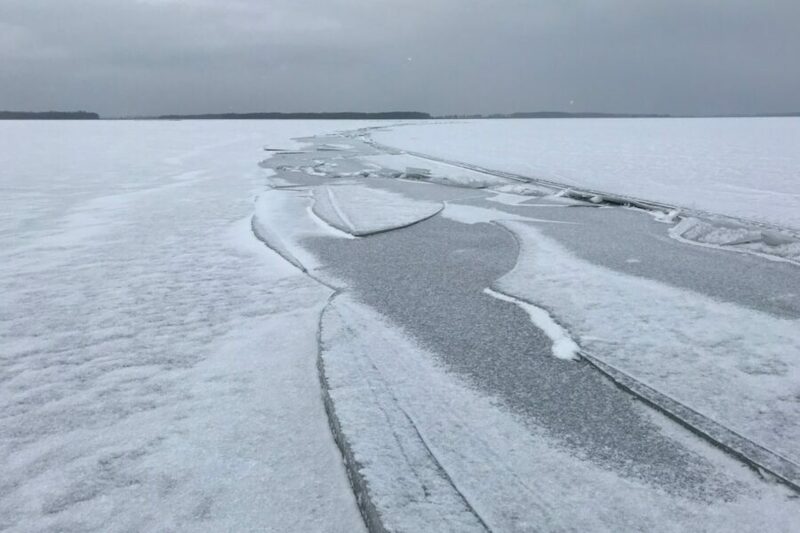 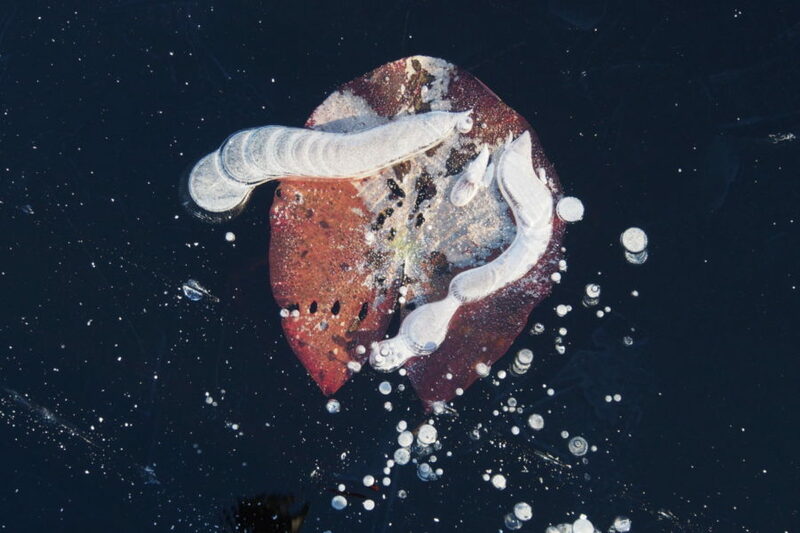 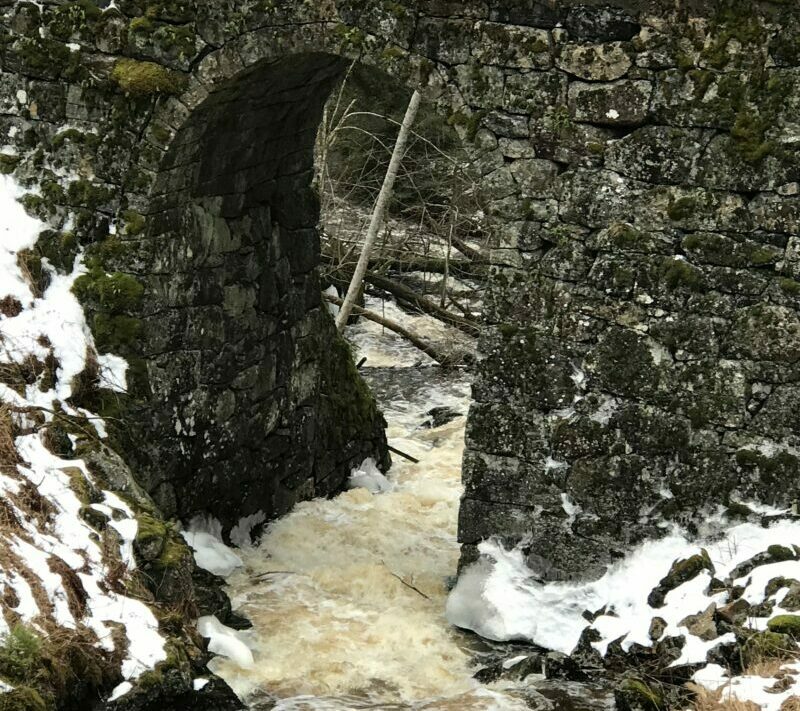 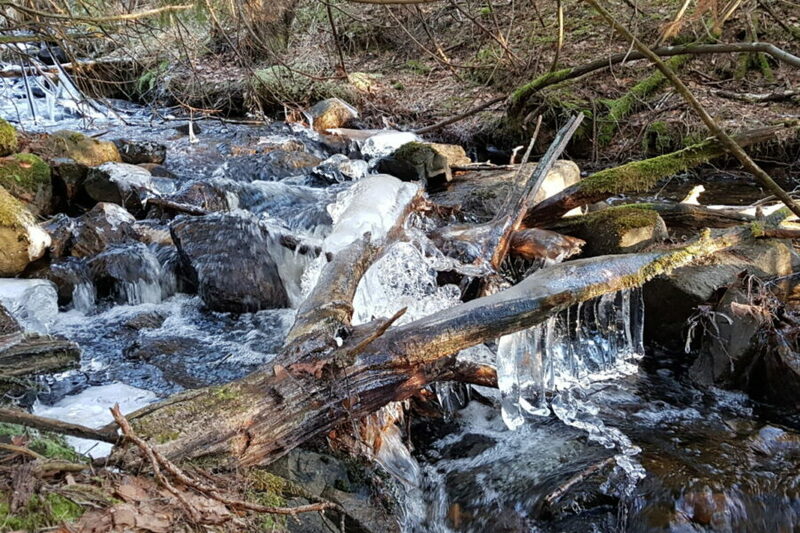 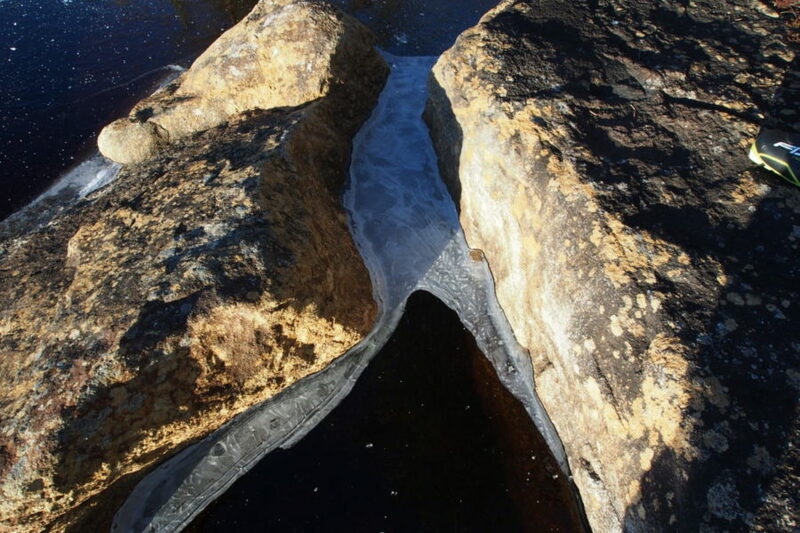 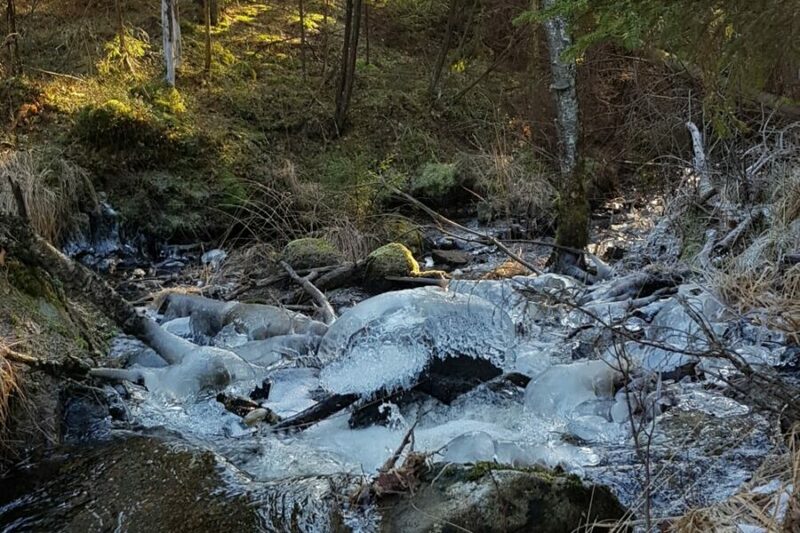 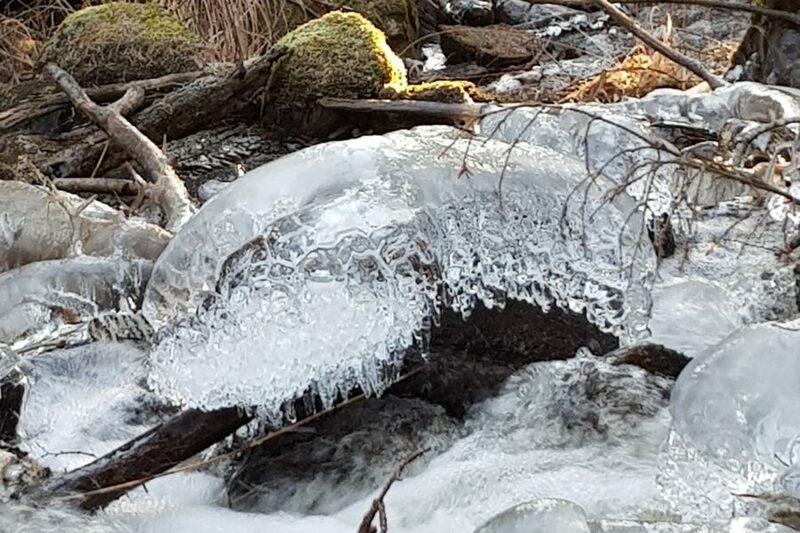 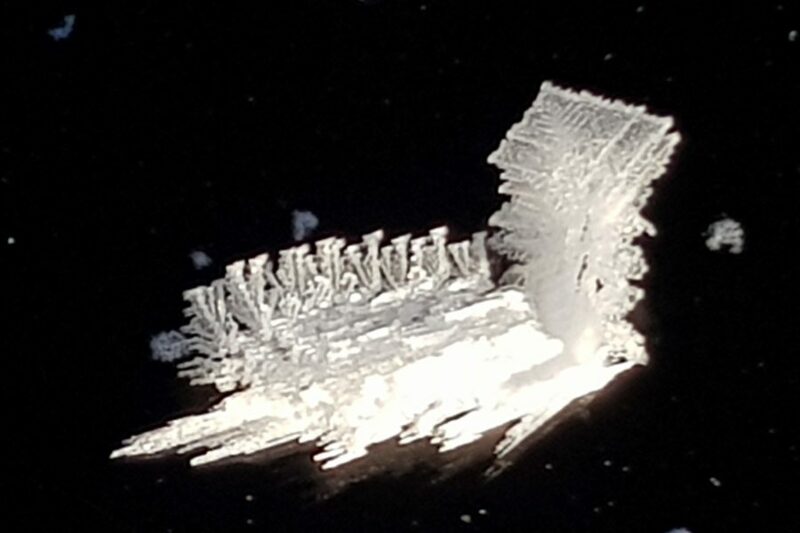 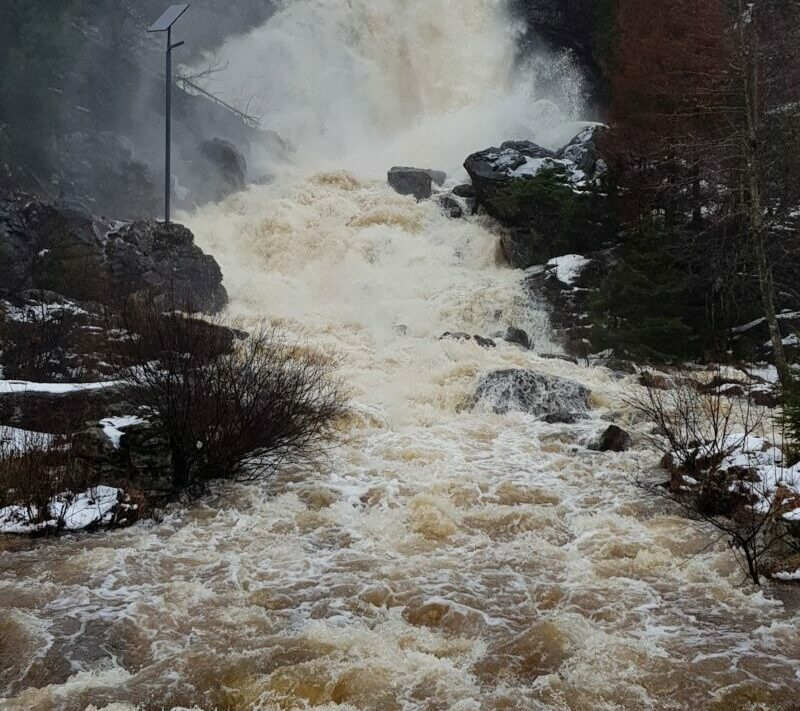 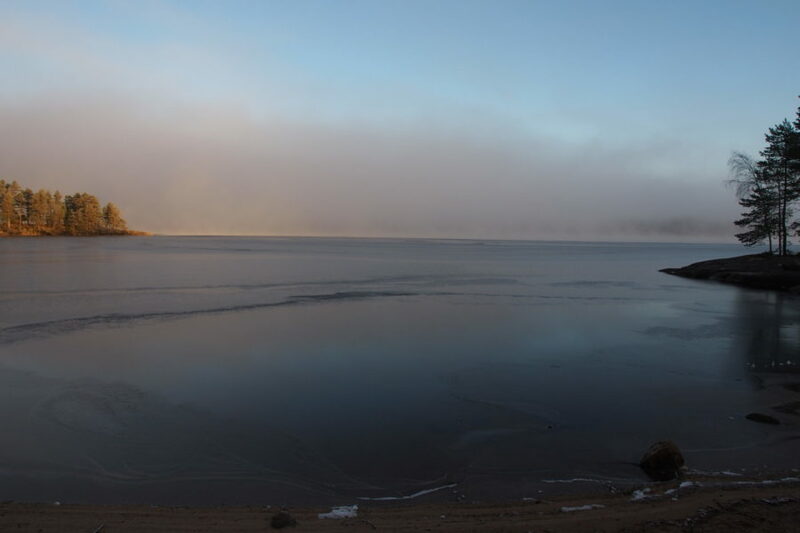 This entry was posted in In water and on ice on November 12, 2018 by BiTh. 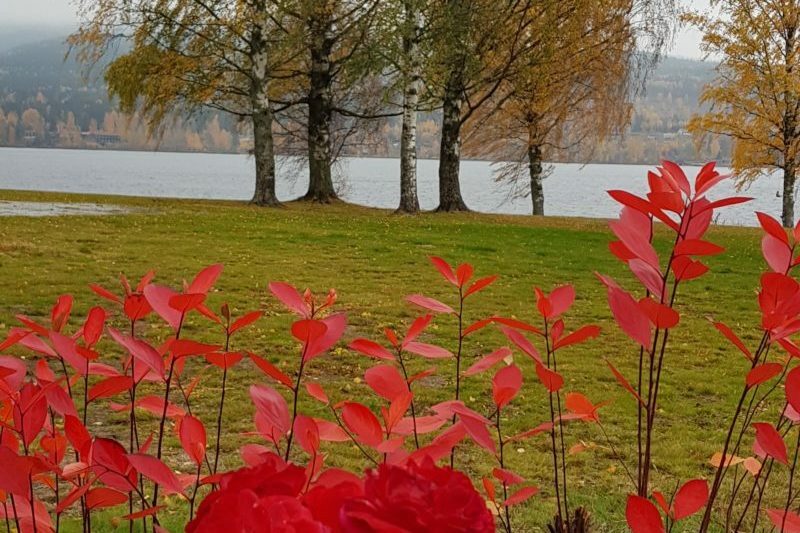 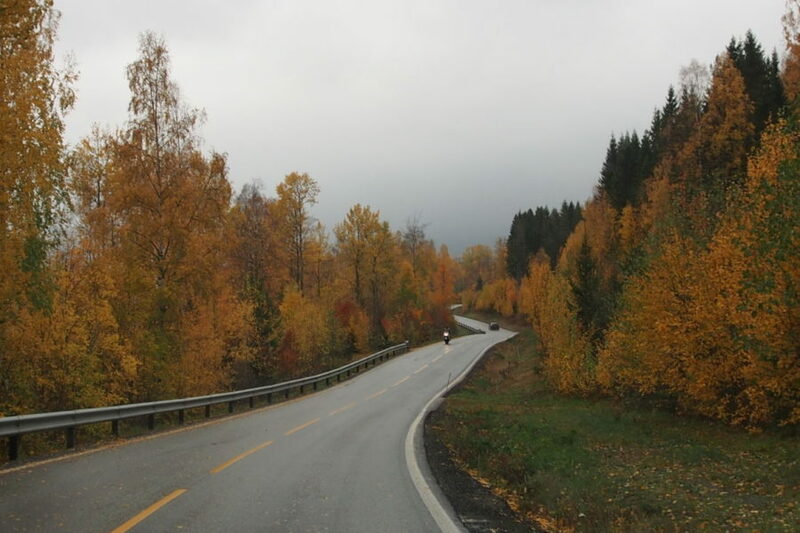 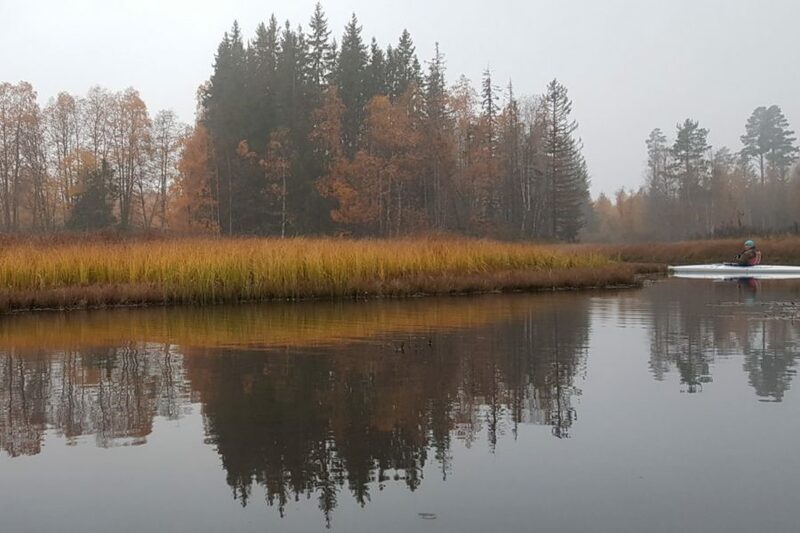 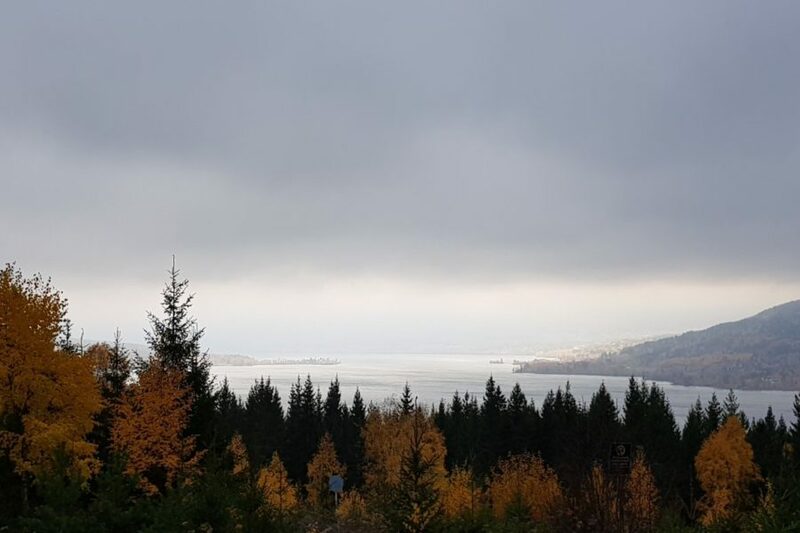 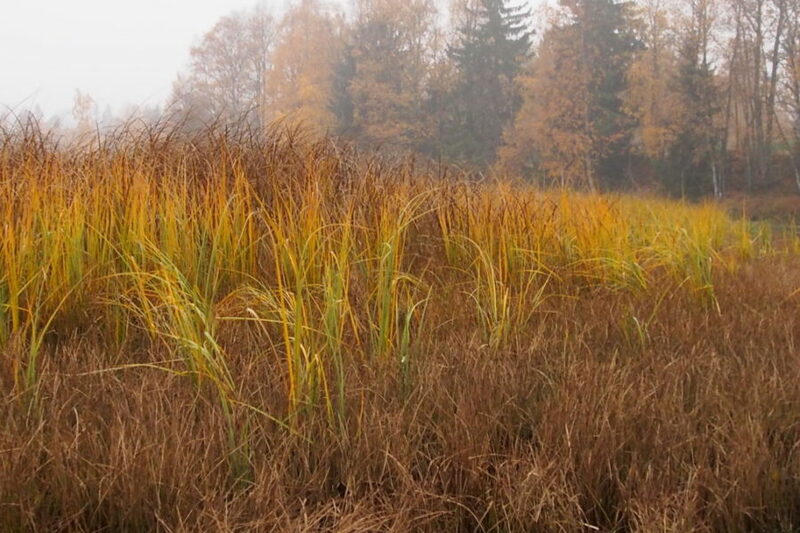 Our collaboration with partners in Norway led us to Hotel Hurdalsjøen in splendid autumn colours. 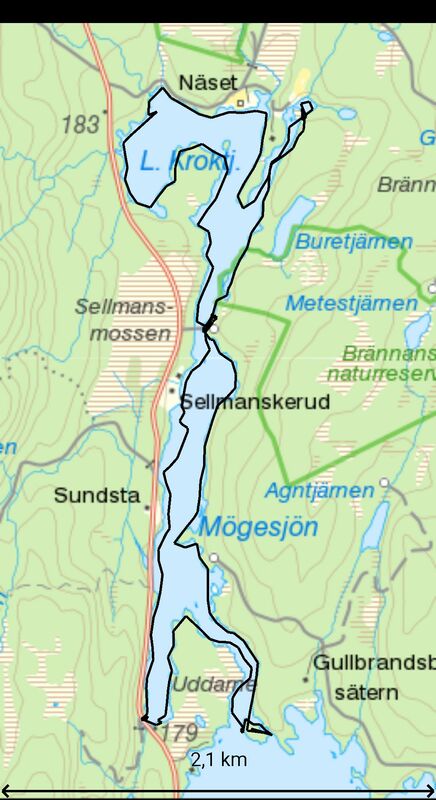 The hotel is situated on a cape, by the shore of Lake Hurdalsjøen, with high mountains around. 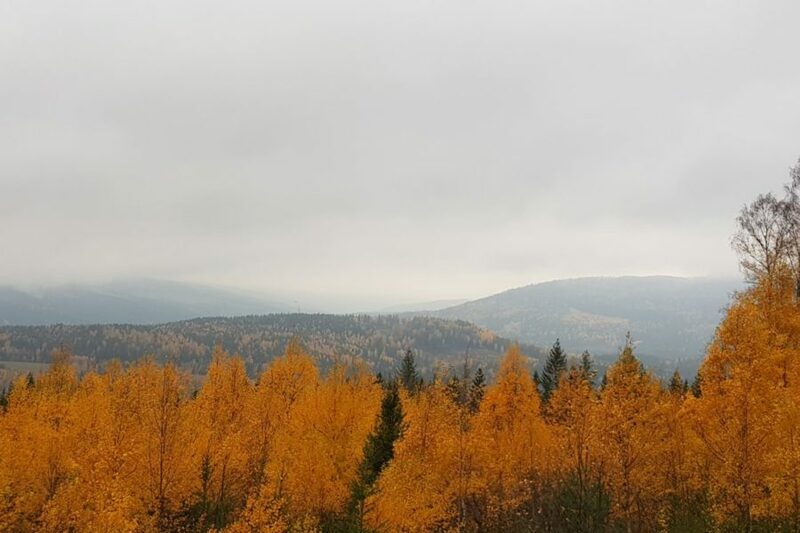 The view is very spectacular, especially in autumn colours when the birches and aspen trees are glowing like fire among the conifers. 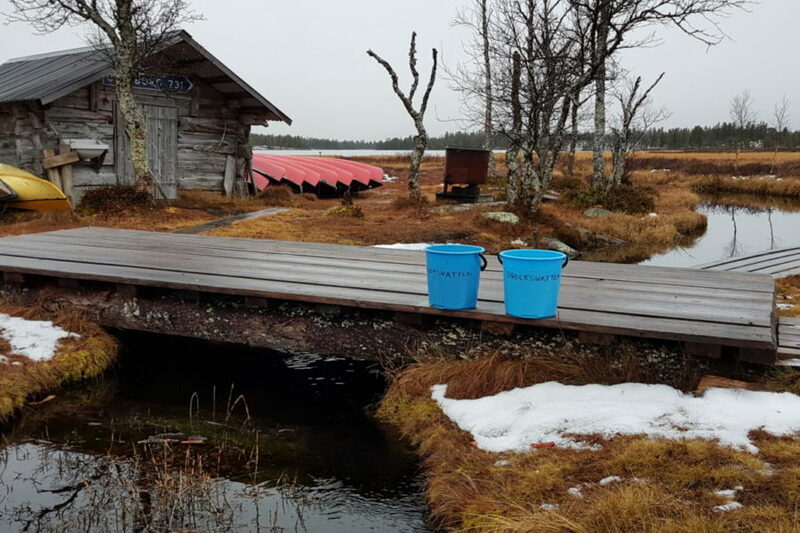 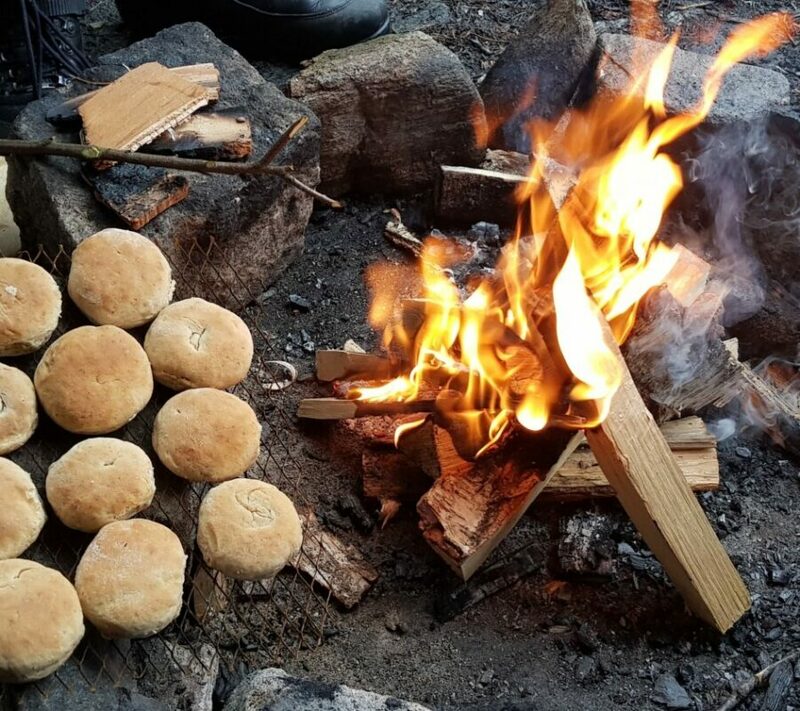 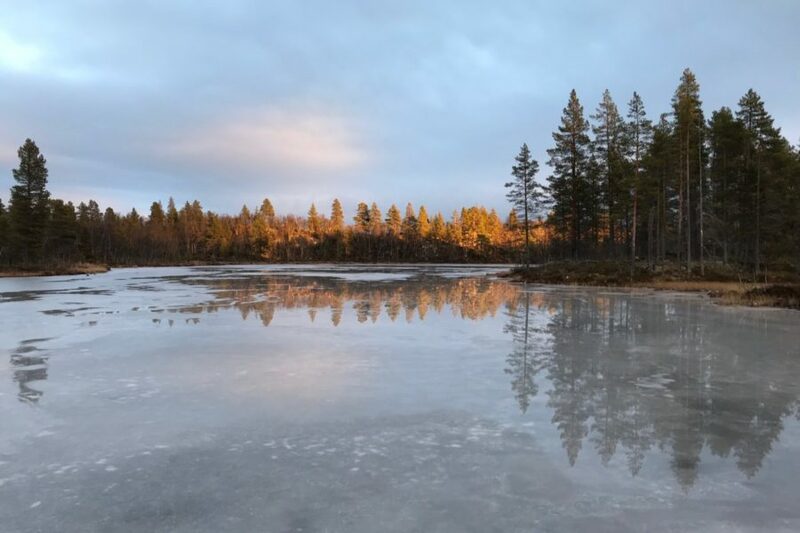 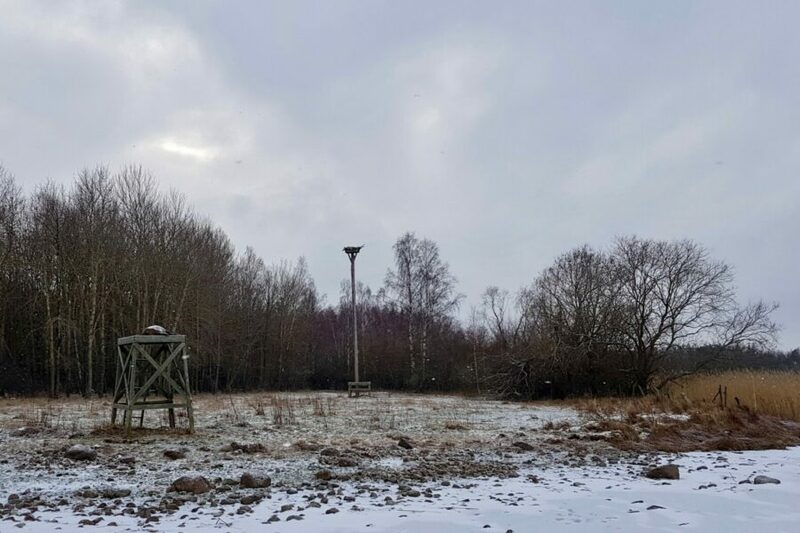 If you want to experience the Scandinavian trend – nature, tranquility, outdoor activities and last but not least the Scandinavian kitchen – this is a perfect location. 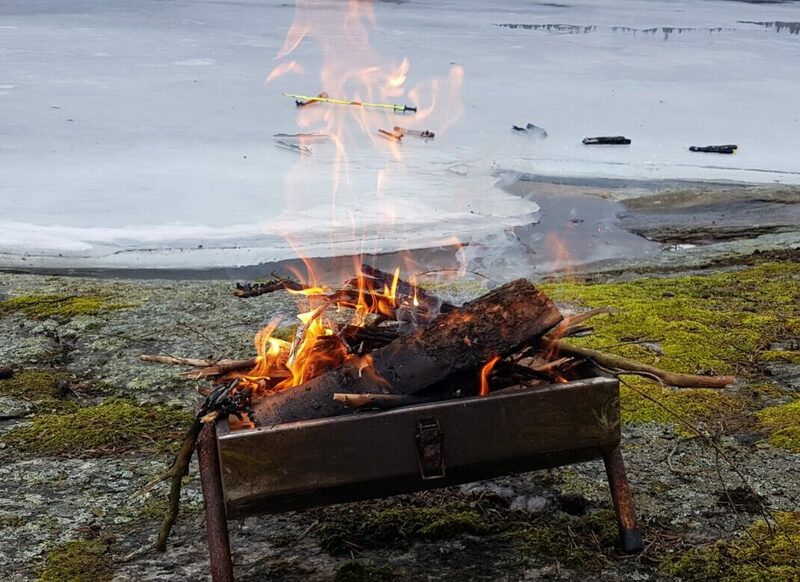 The atmosphere in the hotel is very welcoming with an open fire and a big lobby with stylish furniture. 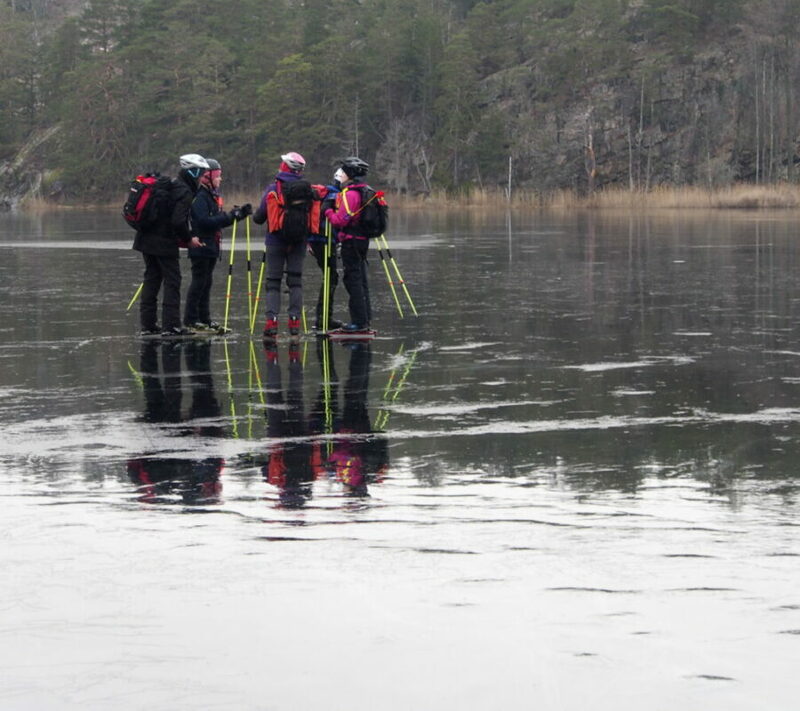 After a tasty lunch and a guided tour in and around the hotel we were ready to discover the northern part of the lake. 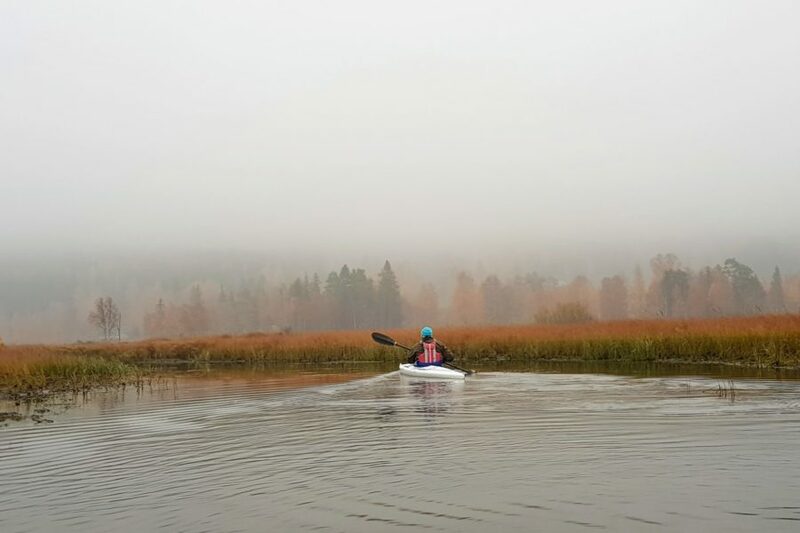 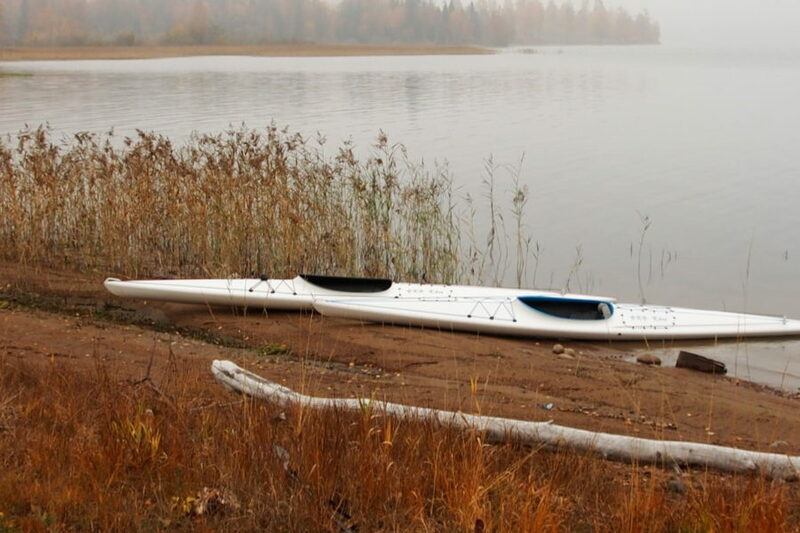 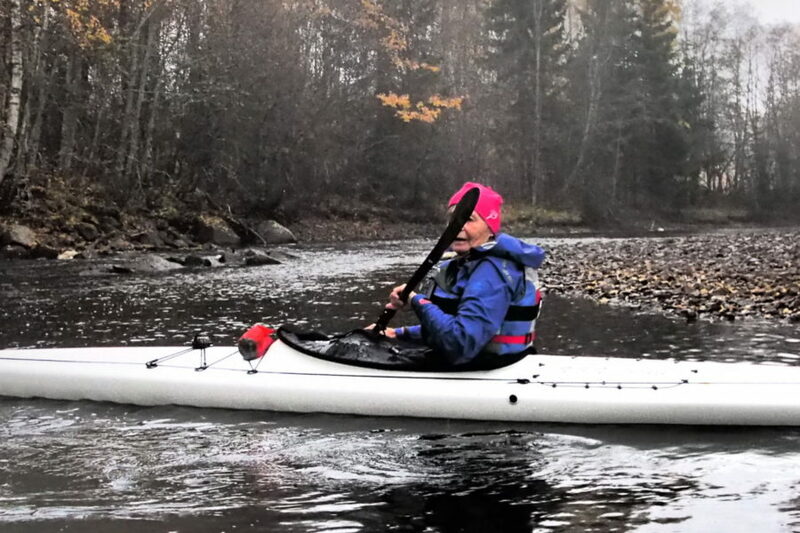 Almost always you wish sunny weather, but it is a very special feeling to paddle in mist lightened by autumn colours. 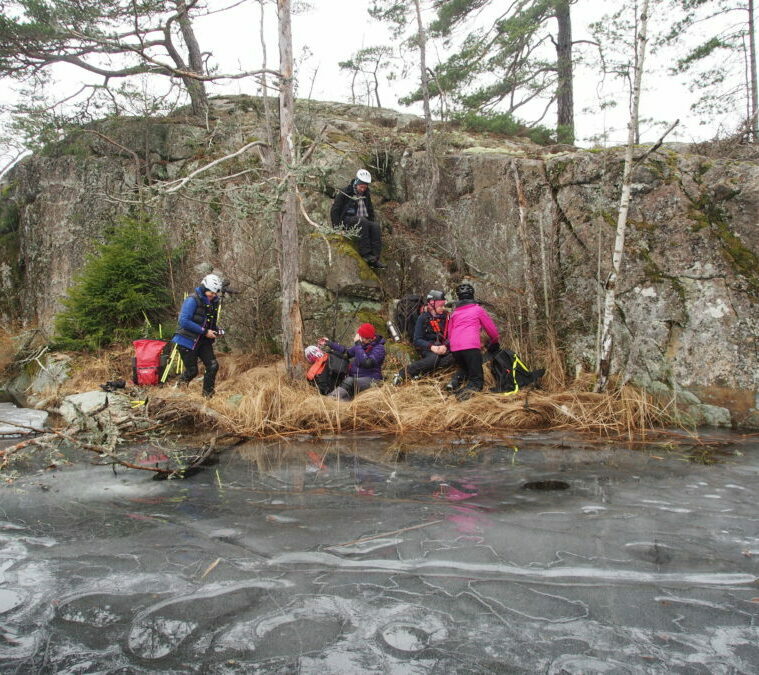 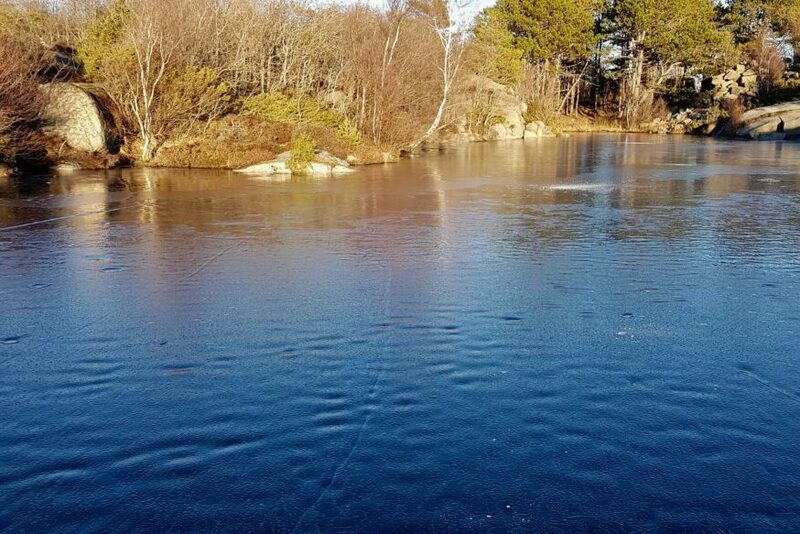 Our goal was the inlet in the northern part of the lake. 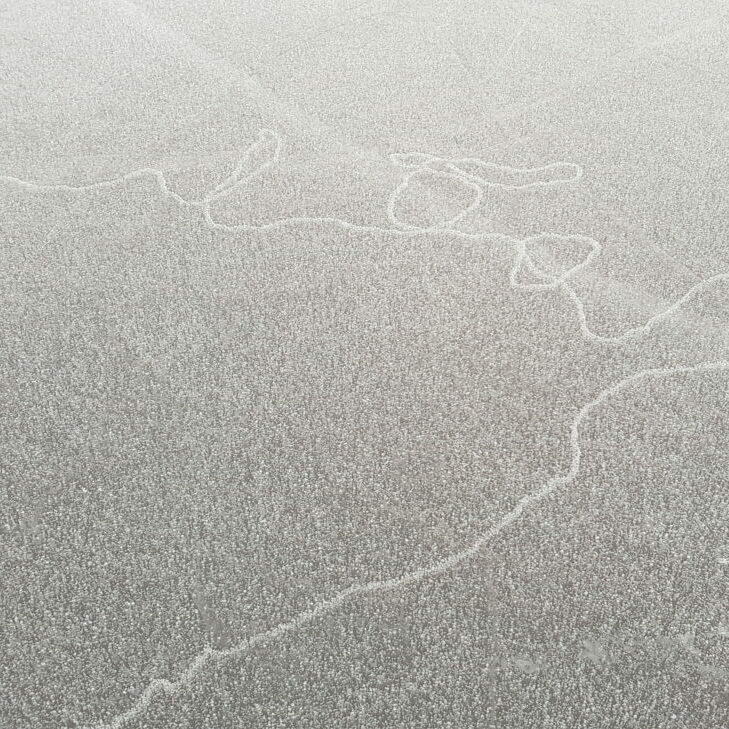 Finally we found our way in the estuary. 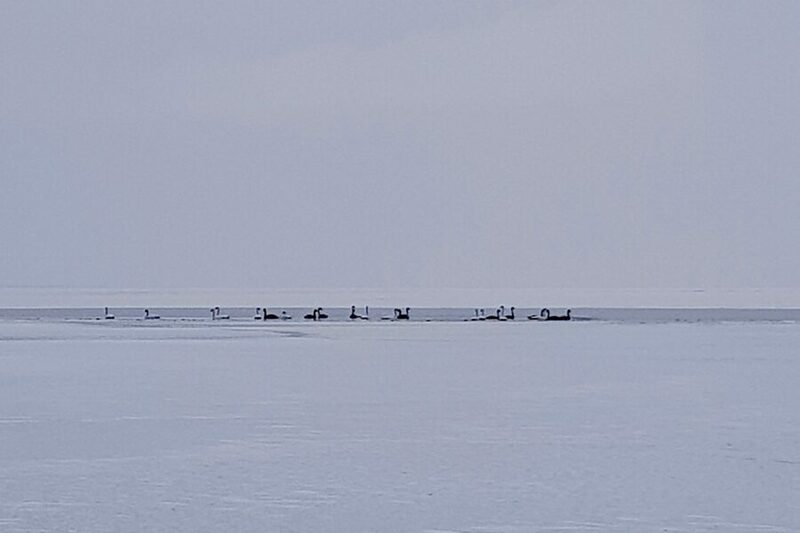 There was almost no birdlife this evening, just some gulls and mallards. 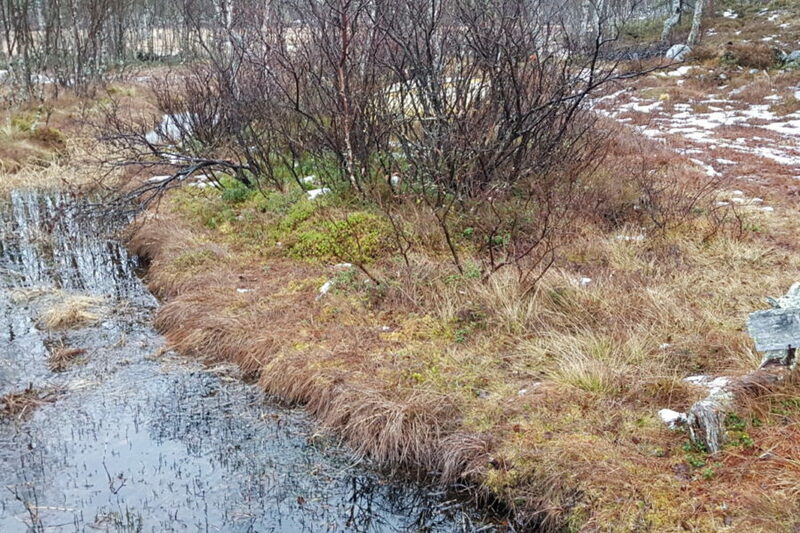 We saw signs of beavers but unfortunately no real ones. 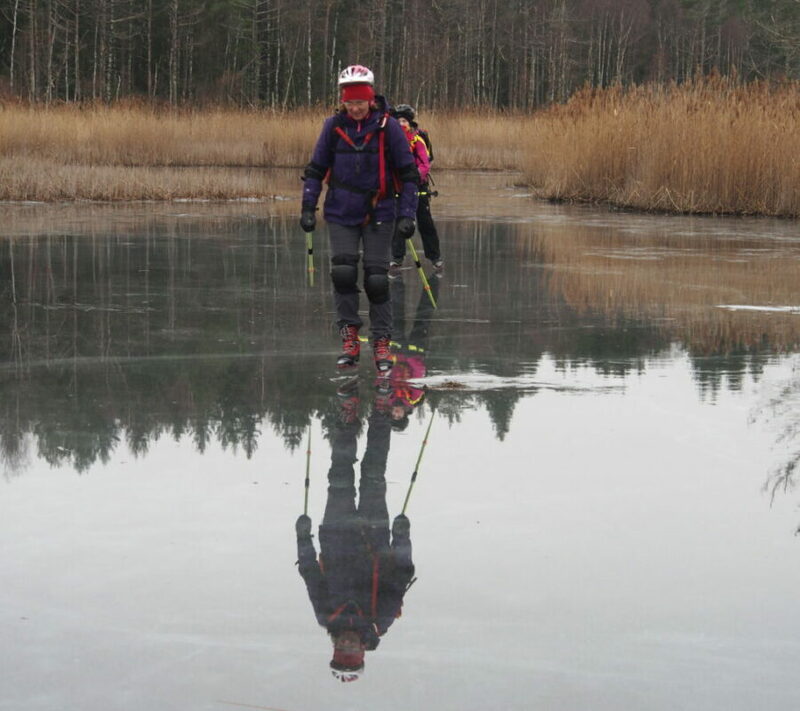 The water level was very low, and after paddling about 5 km we had to turn around and head back again. 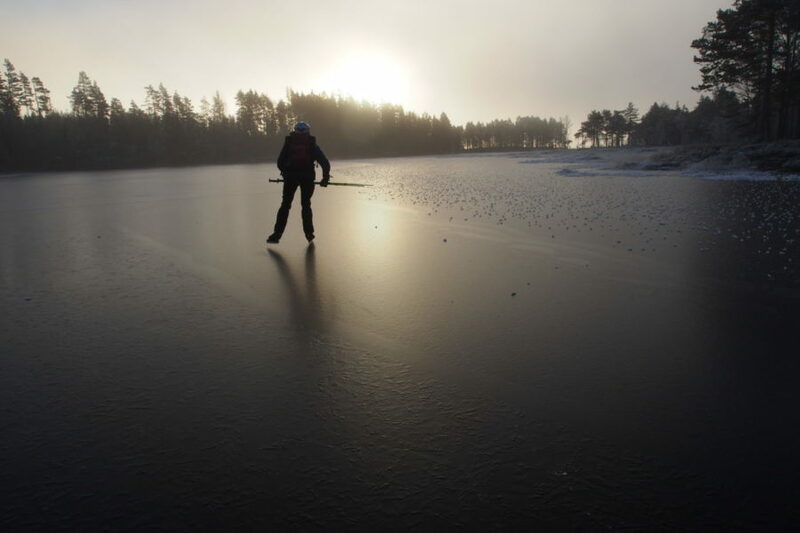 The last kilometers we paddled in dark. 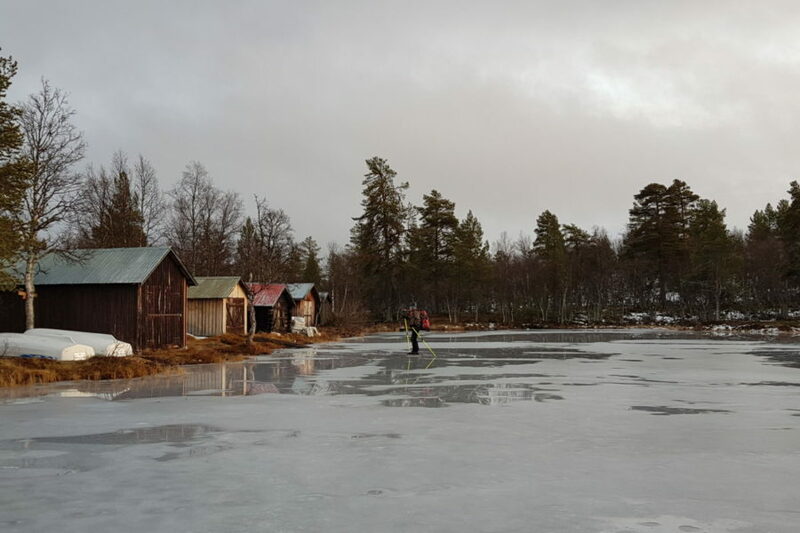 It would have been nice with an evening sauna and a swim in the lake, but dinner was waiting! 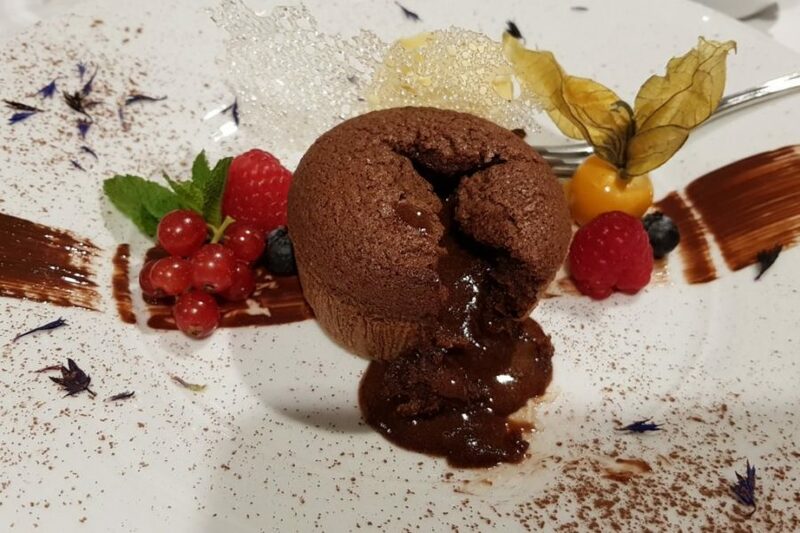 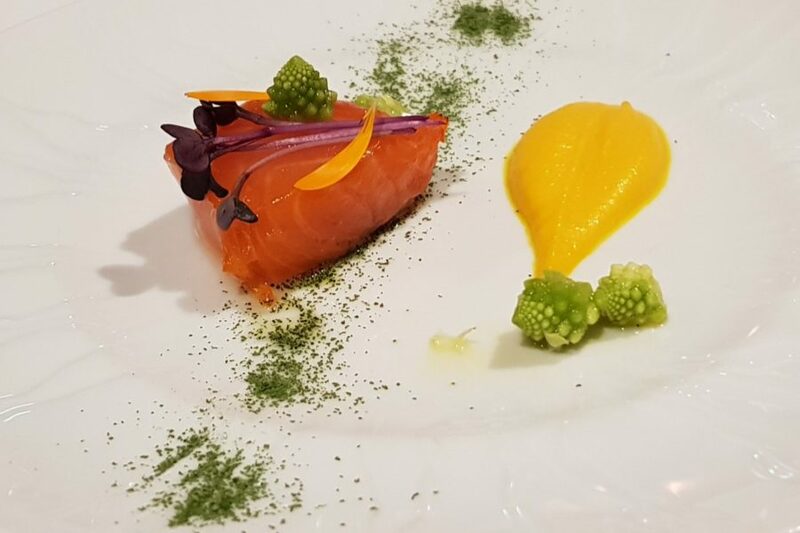 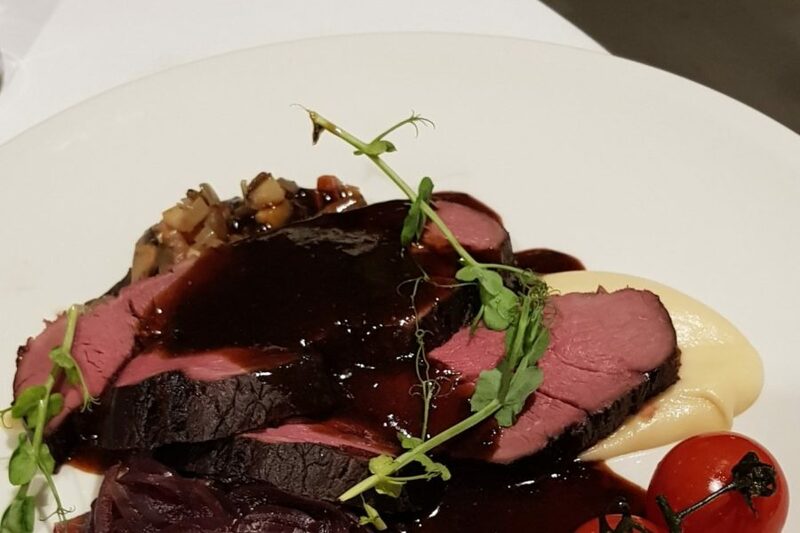 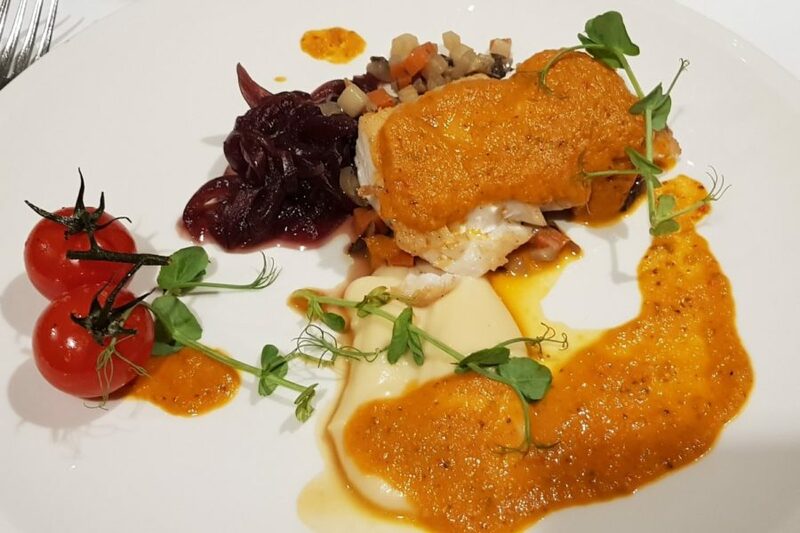 We were treated a wonderful three-course dinner prepared from local ingredients. 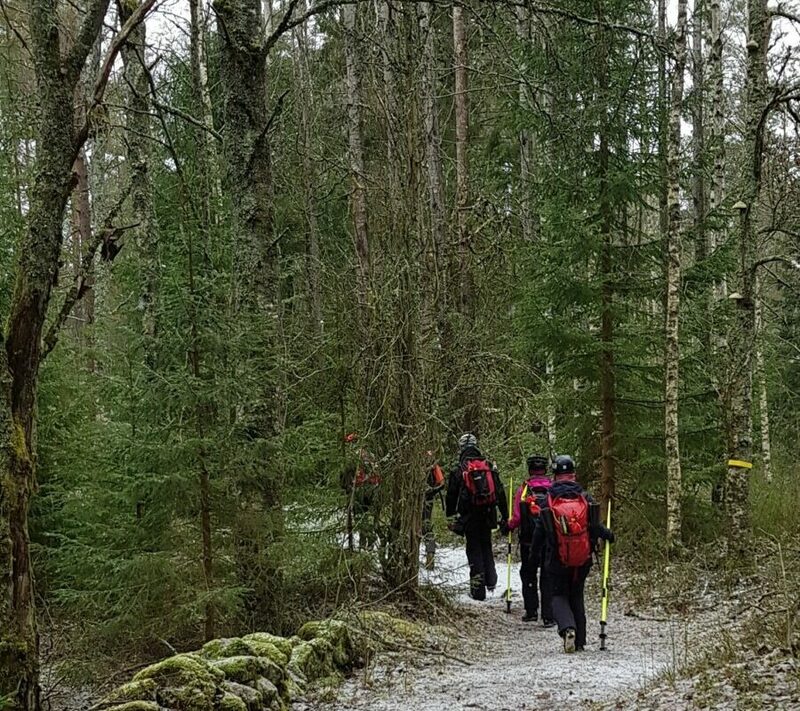 After a good night’s sleep and a nice breakfast we explored the area around the lake before heading south. 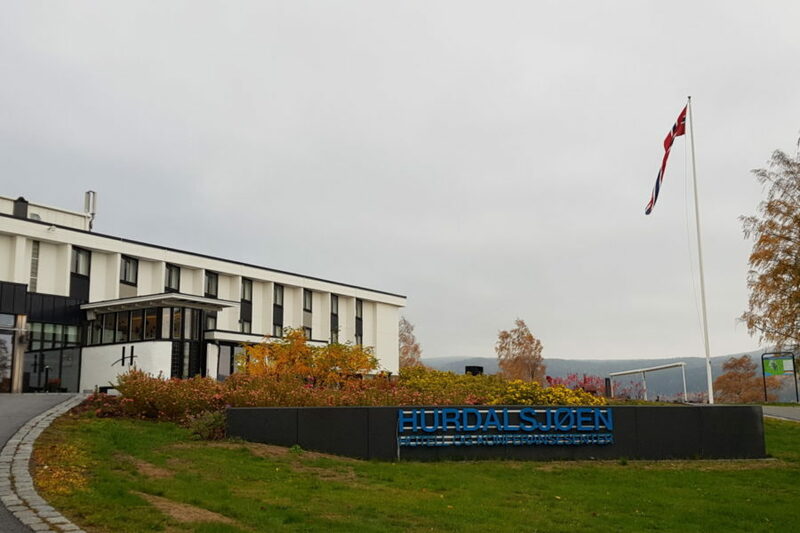 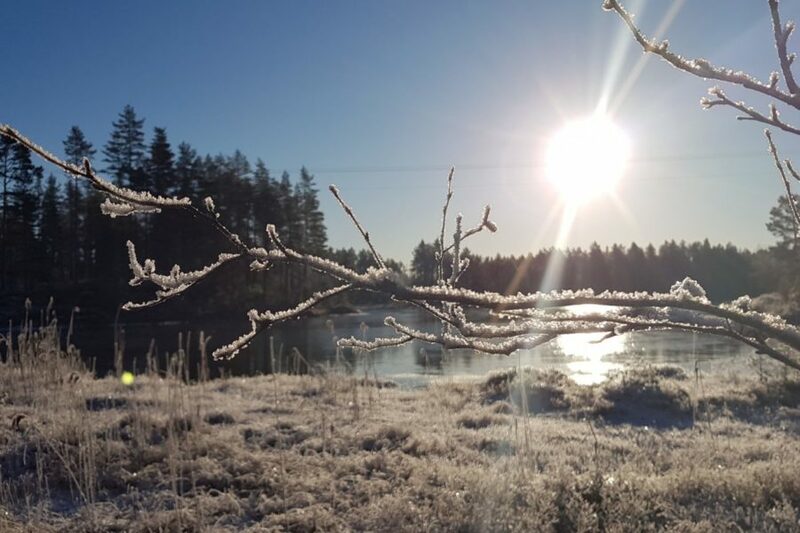 The hotel is situated only 25 minutes drive from airport Gardermoen, and a perfect place to start or end a visit in the borderland of Sweden and Norway. 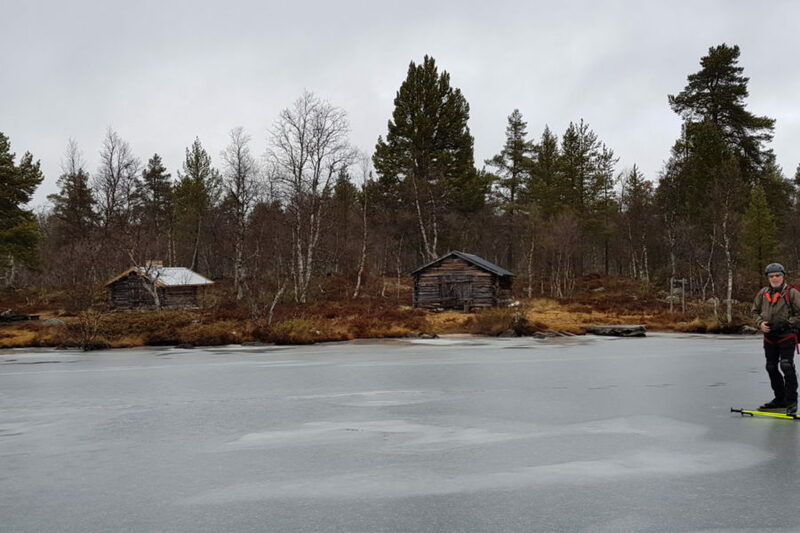 Thank you Pål, Dag and Marianne for your hospitality! 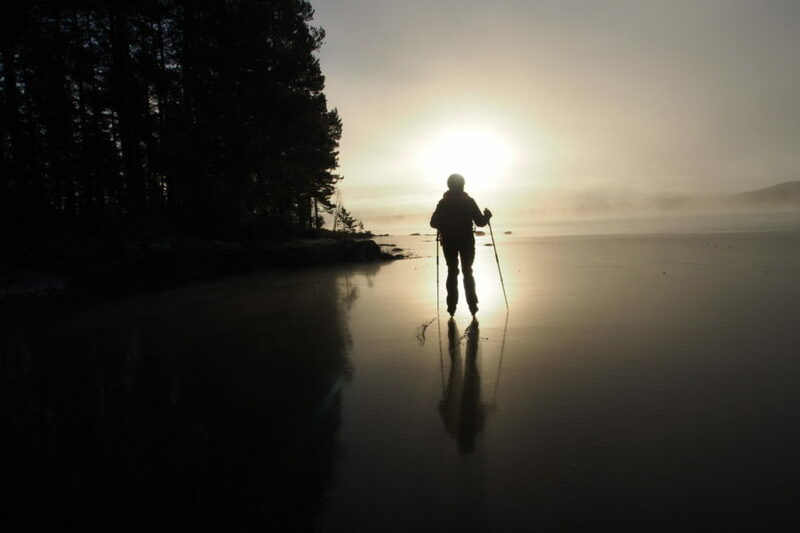 Besides perfect food and accommodation you had a lot to tell us about history and nature in your paradise. 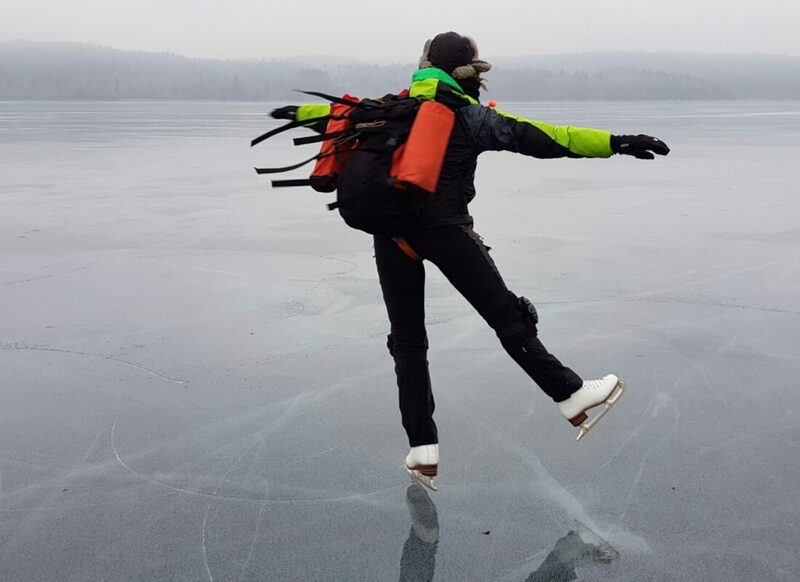 We will be back in wintertime for skating and skiing. 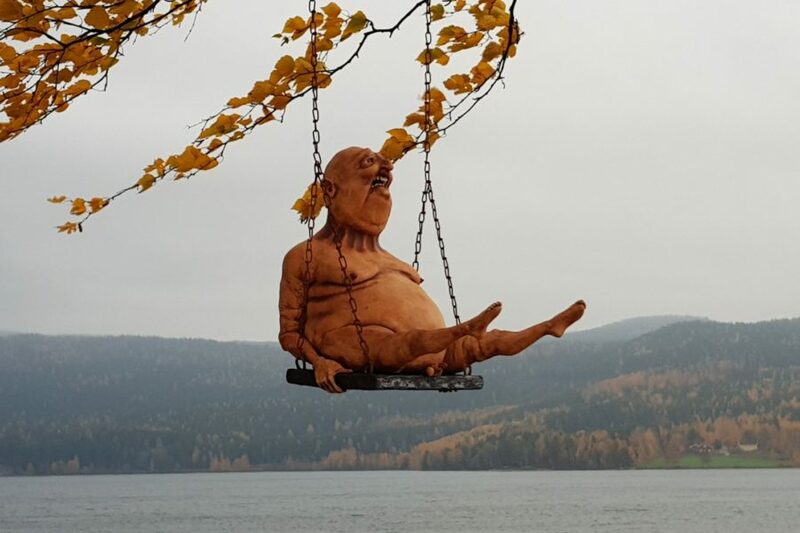 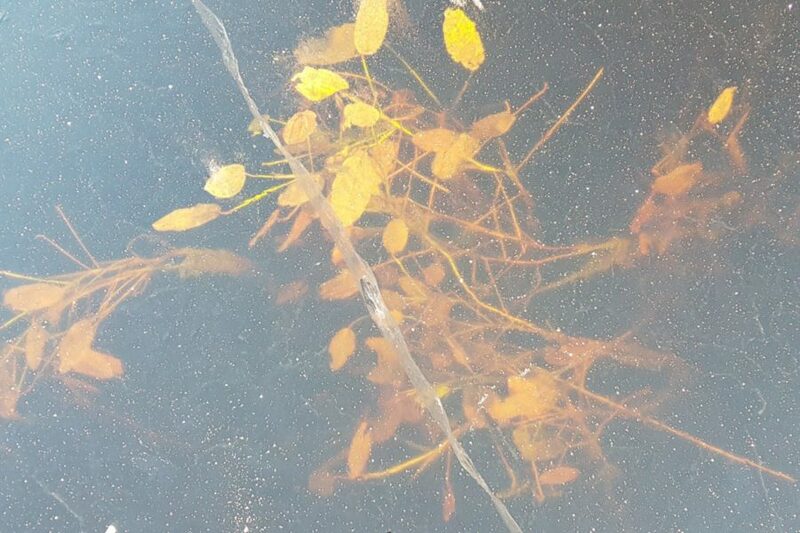 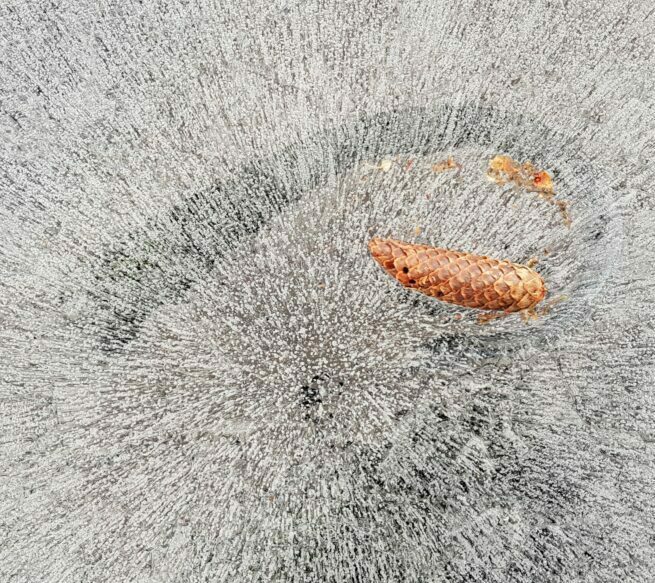 This entry was posted in In water and on ice on October 14, 2018 by BiTh.